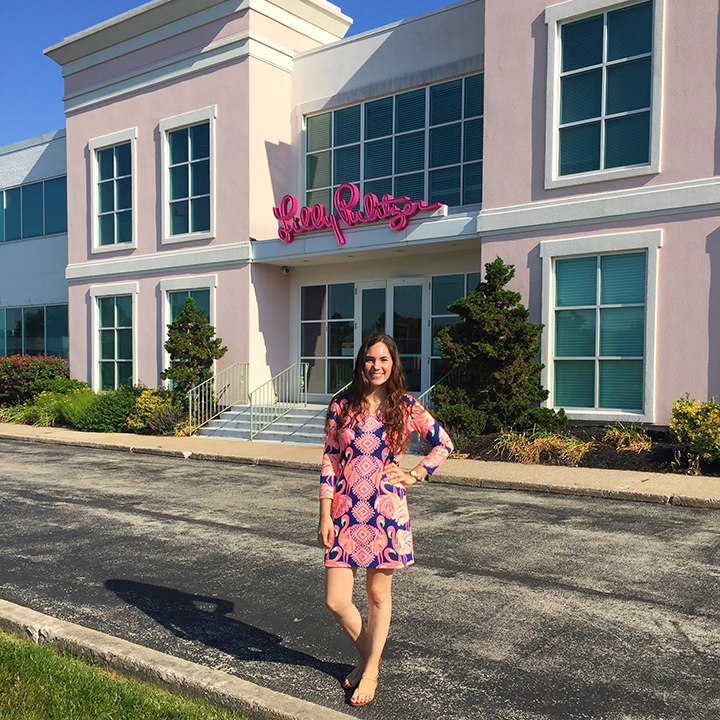 As you know if you follow me on Instagram, I had the amazing opportunity this summer to intern in the Print Design department at Lilly Pulitzer’s headquarters (the Pink Palace!) in King of Prussia, Pennsylvania. Morgan Foery from Atlantic Anchors asked to interview me about my experience. She shared the interview here, but I’m also posting below for my own record! 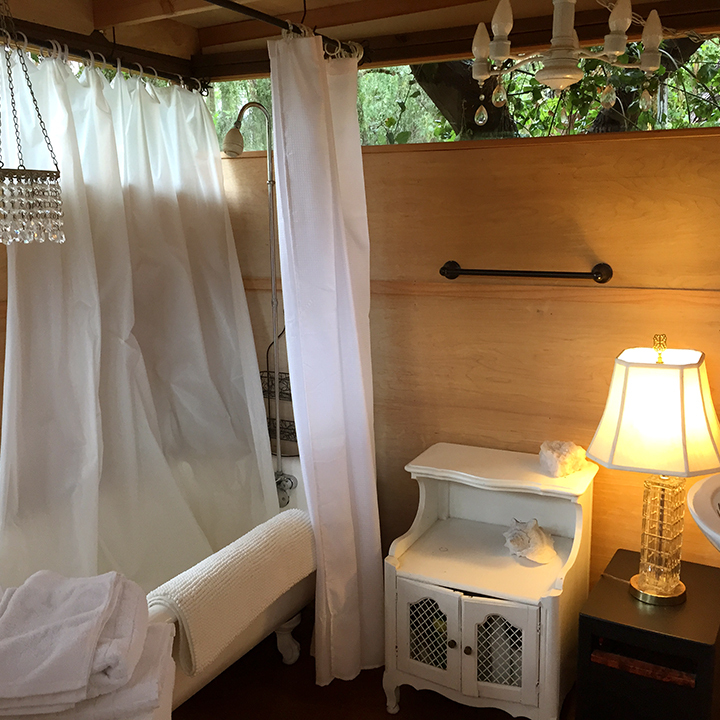 Read more about my experience below or on her blog! What did you study in college? 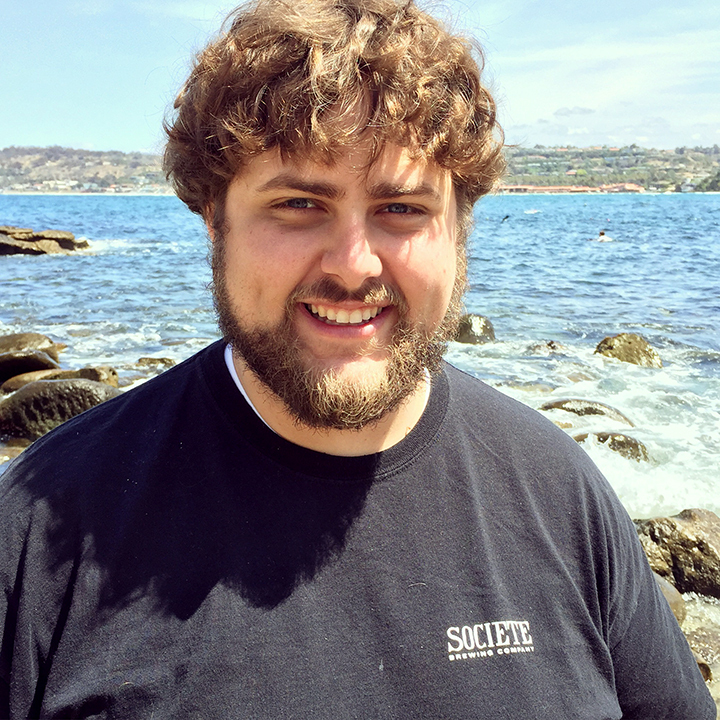 Did you always know you wanted to go to grad school? I did my undergrad at Tulane University in New Orleans and majored in both English and Studio Art with a concentration in Painting. 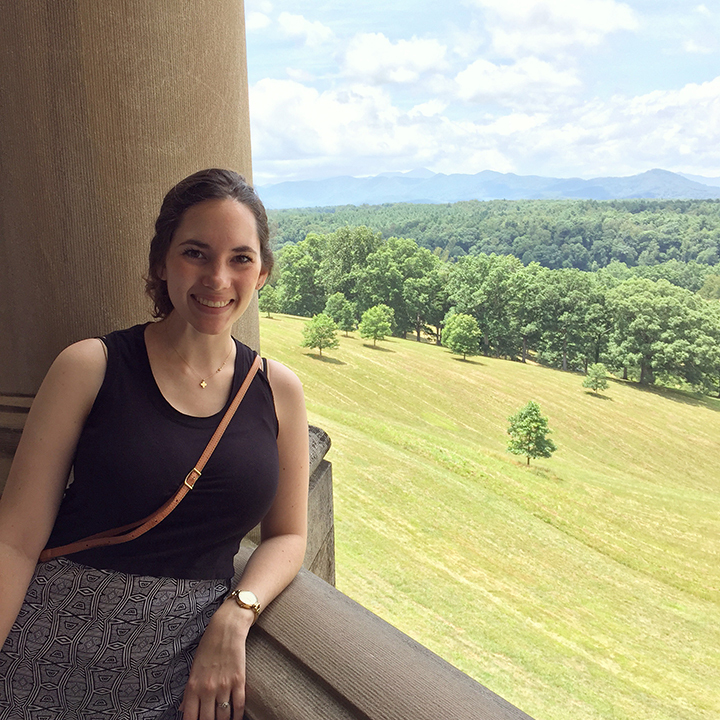 While in undergrad, I fell in love with design and interned at a small graphic design studio and also opened a small web and graphic design business with my husband (then boyfriend). It was part of the way through undergrad that I learned about surface pattern design and that people could be fabric/textile designers for a living. I immediately knew it was what I wanted to do! A perfect combination of my love of art and design! I couldn’t study that at Tulane though, so I made the most of my time there, poured myself into my painting and graphic design work. 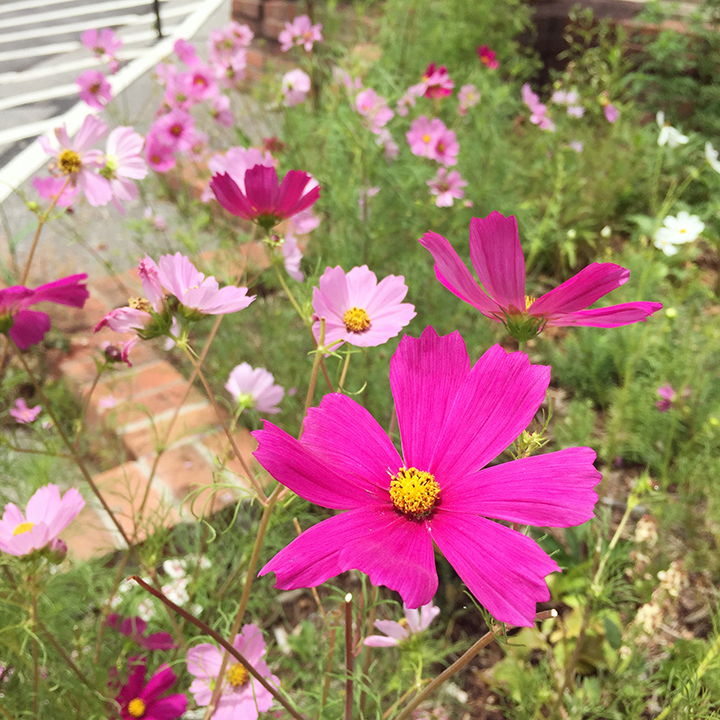 I had long admired the Savannah College of Art and Design and dreamed about going to grad school there for textile design, but when I graduated from undergrad my husband had a lot of student loans that we needed to pay off. So I worked full-time in graphic design for three years post-grad and we lived really simply and worked hard to pay off all our debt. 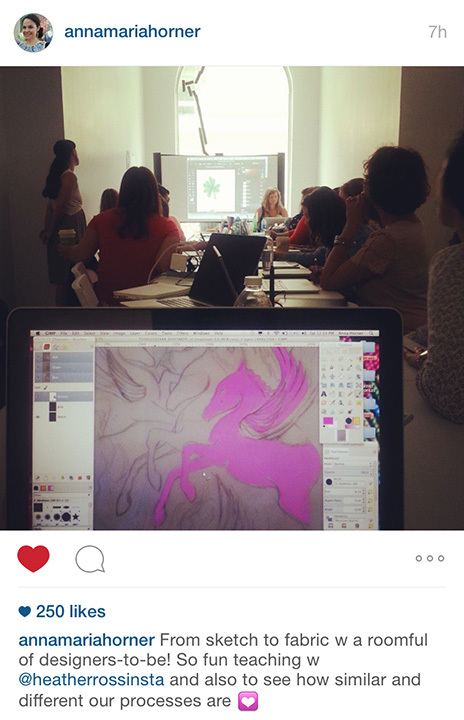 During that time I took online courses and in-person workshops with designers that I admired and taught myself repeatable pattern design. For a while I thought grad school was just a far off dream, but once we paid our debt off and I felt like I’d grown as an artist/designer on my own, I felt that grad school was the right next step for me. Although going to grad school meant some crazy life changes for me (my husband lives in New Orleans while I go to school in Savannah! ), I’m so glad I did it. 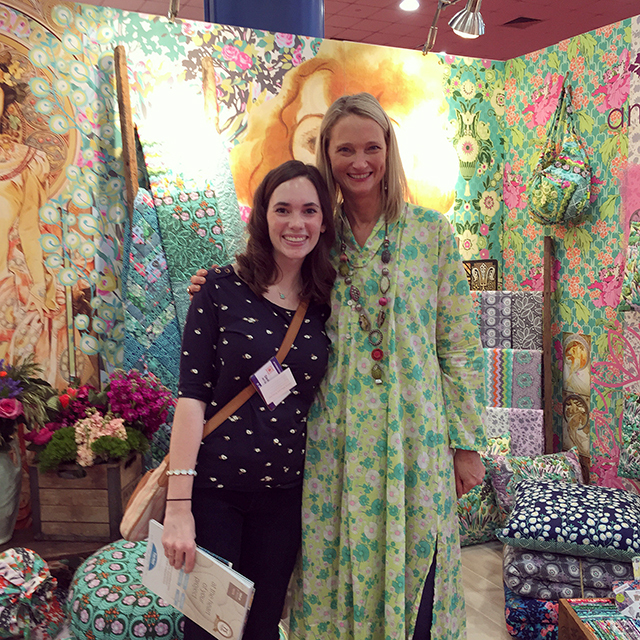 I’ve grown so much as a designer and it has connected me to some amazing opportunities, like Lilly! 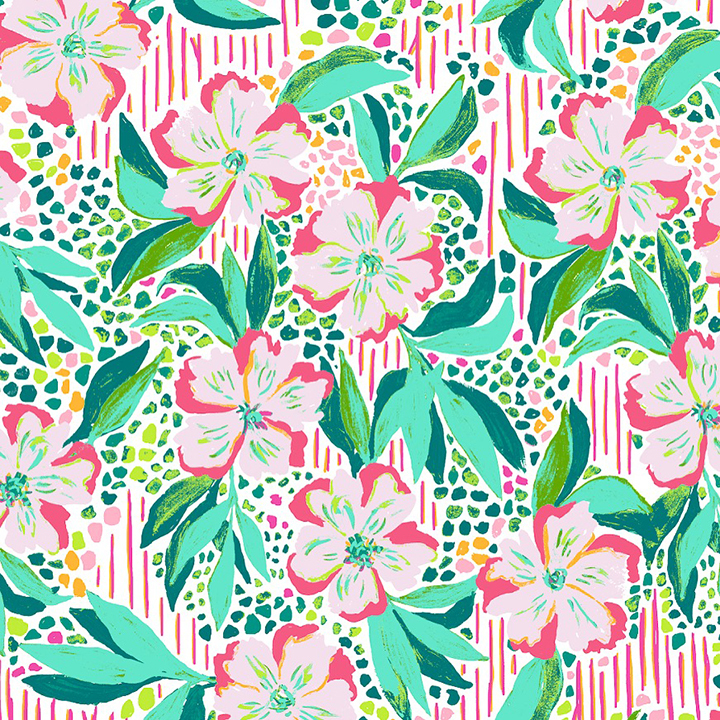 How did you become interested in Lilly Pulitzer? Although I’d always known of the brand Lilly Pulitzer and their iconic prints, they weren’t really on my radar before grad school. My personal passions in textile design have been aimed more at the quilting cotton and interior design markets, I never really thought of myself as someone who would work in fashion. 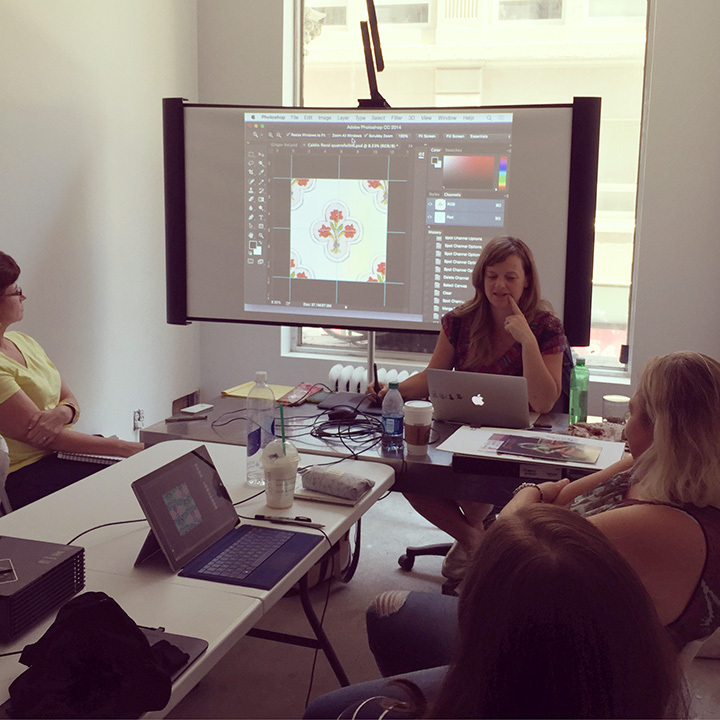 Lilly, along with many other companies, actively recruit from SCAD for interns and new hires because SCAD is known for really pushing their students in art and design. 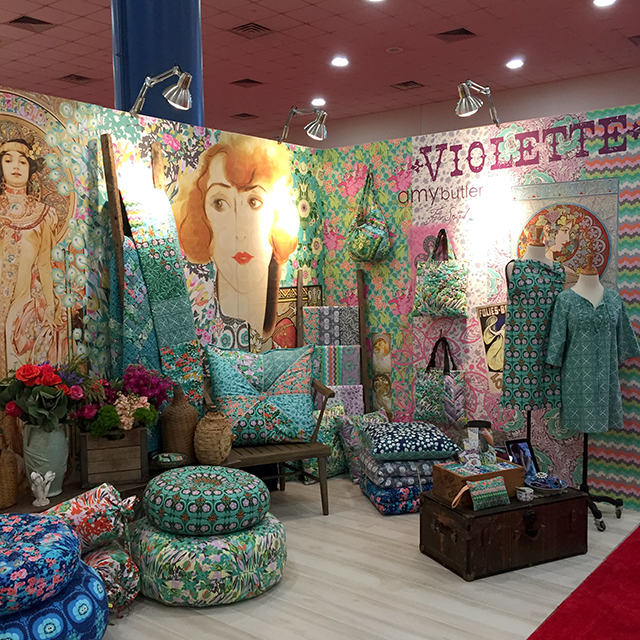 I certainly owe SCAD for the connection to Lilly! 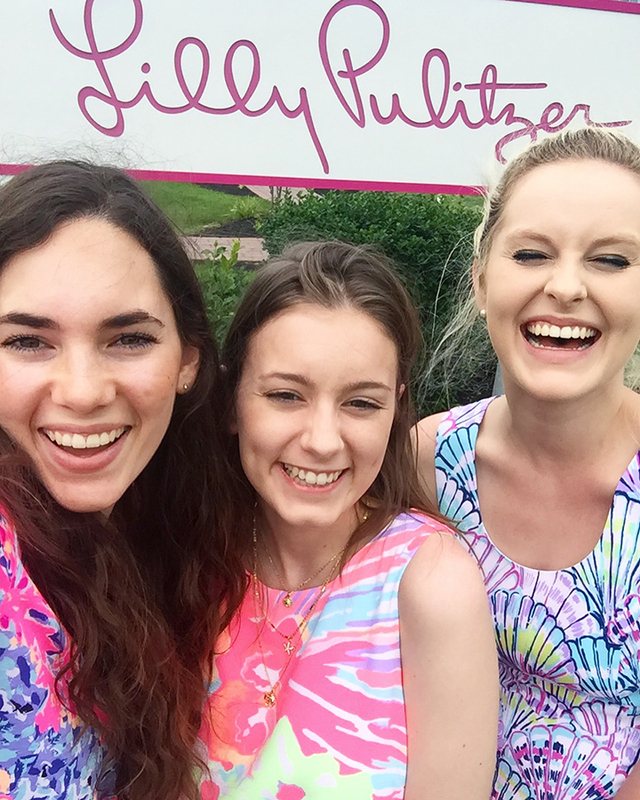 What was the process like when you were applying to the Lilly Pulitzer internship? Was there any way you differentiated yourself during the application process? There were many steps to the internship application/interview process. Initial resume submission, in-person interview and portfolio review, a special Lilly print project to see how well I could design to the Lilly brand, then additional video interviews. I would always recommend during any interview to use it as an opportunity to make connections regardless of the final outcome. Be confident and use the interview to speak to your skills, of course, but be interested in the company and what they do as well. It is a great time to ask questions about how the team works, what the day to day looks like, ask the interviewer what their favorite part of their job is (and if you can, relate their answers back to things in your own experience as well), etc. Don’t take over the interview into topics that are irrelevant to the position, but show that you are interested, can make interesting conversation, and want to know more about the job/position/company. Even if at the end of the process you don’t get the job, you’ve gotten a small peek into a world that you wouldn’t have seen into otherwise. Everything is a learning opportunity! What department did you intern in? 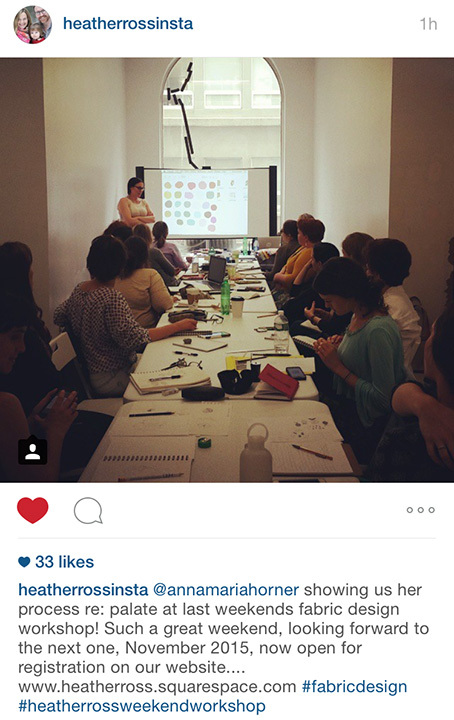 I interned in the Print Design department and also shadowed the Color, Fabric, and Trim Research and Innovation team! What did your day-to-day look like? During the time I spent at Lilly, I worked on the Summer and Resort Fall 2018 print lines as well as some special projects. My day-to-day varied depending on where we were at with each season, but mostly consisted of digitally cleaning prints and getting them as finalized as possible. That included putting designs into repeat, color reducing, re-coloring, re-sizing, and perfecting and tweaking the artwork. I did some original design work for border and engineered prints as well as an intern project print collection with the rest of the summer interns. 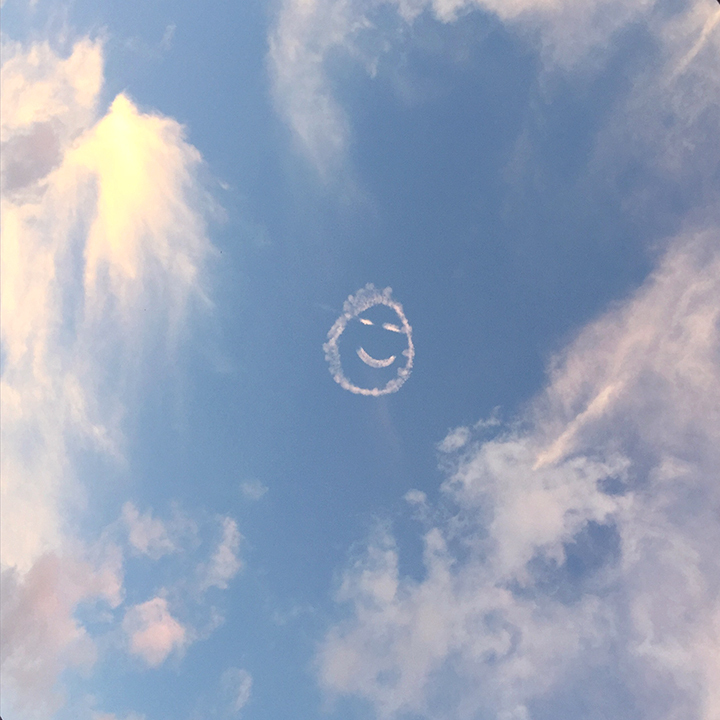 Was there anything you did this summer that you were really proud of? Honestly, the time flew by so fast and between the demands of the print team’s collections and the summer intern print collection, I mostly felt like I was being pulled all over the place! I’m happy with all that I was able to learn from my position and I’m happy with how my intern print collection turned out, but I’m also hard on myself and feel like it could have been even better with more time. If you had to describe your summer at Lilly with 3 words, what would you choose and why? Bright, Happy, and Fun! The Pink Palace is such an inspiring place to be with color, print, and pattern everywhere. 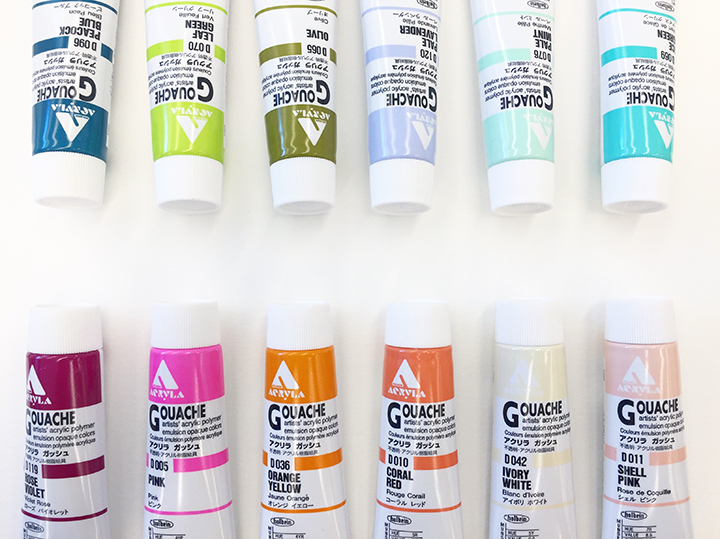 It is hard to wear and work around such bright colors without it making you feel happy and joyful! I also had the honor to work with an amazing group of interns and made some really awesome friendships. The summer was filled with great times with them both inside and outside of the workplace. 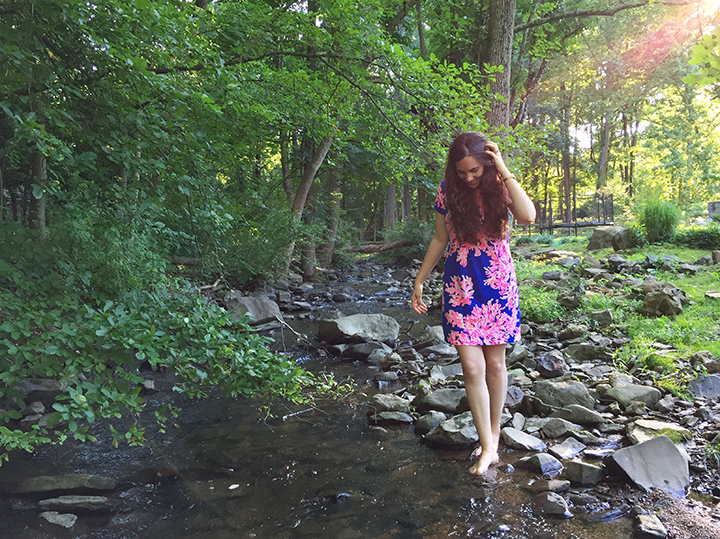 The King of Prussia, PA area is also really beautiful in the summer, so exploring the area was great too. What was the best part about your internship? Was there anything you didn’t love? It was awesome to see the design to production process in person of such a large company and how things progress from print design to fashion, tech, and production design, through merchandising and planning, and all the other departments and on to product in stores. As an artist and designer, I love that Lilly prints always start with hand painting and original artwork and I think Lilly does an amazing job of keeping a very painterly feel in the finished designs. There wasn’t really any part of the job that I didn’t love, but as with any new job it always takes a while to learn how things work and who is in charge of what. I’d never worked in a company that big before, so I was a little surprised by how distinct the hierarchy of design/positions were. Even with that though, Lilly still does a great job of having a team/collaborative approach. Overall, I really am so grateful for the opportunity to work there! What are your plans after grad school? I’m almost done, my only remaining class is my final project/capstone/Masters thesis! My husband just started a graduate program in Louisiana, so I’ll be back in New Orleans when I’m done. I’m looking forward to settling my life down a little bit and figuring out what is next! I’ve always been interested in licensing my design work to fabric companies, so next on my list is to pursue that a little more! We’ll see! What advice would you give someone who wants to apply for a Lilly internship? Whether applying to Lilly, or anyone interested in the world of art/design in general, I would suggest taking the time to figure out what you have to uniquely offer through your work. Whether it be through conceptual ideas, sense of color, a design style or unique design process or content, make yourself stand out and find where your work fits into the world. You want to show not only your skills and strengths as a designer, but your creativity and that you can come up with new and original ideas. For Lilly in particular, I think it’s nice to be interested in a painterly Lilly aesthetic, but you also want to show that you can create more than just what they are already doing. It’s a company that values creativity, so I feel like the same can be said for any of the other departments as well. 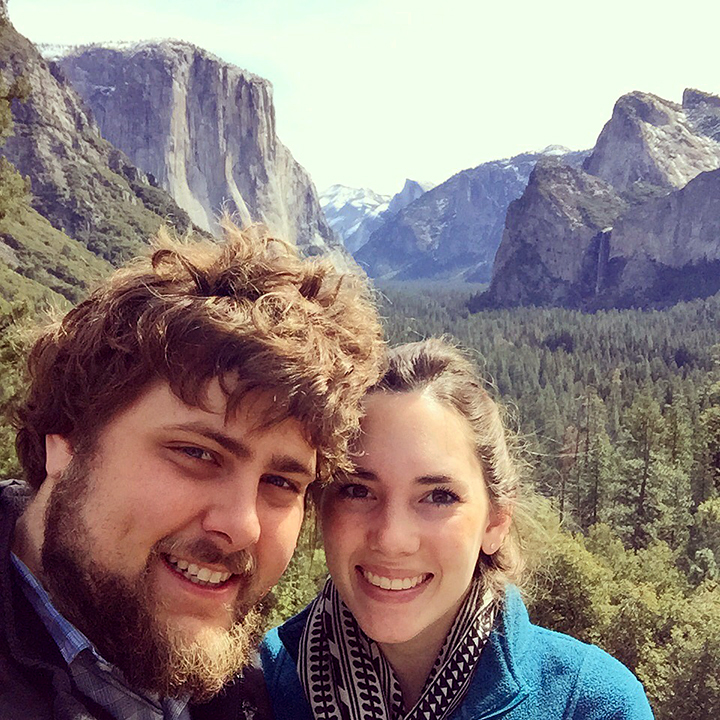 Drew and I took a two-week backpacking trip across Europe. We visited friends in Copenhagen and they showed us around Denmark and Malmö, Sweden. Drew visited the renowned Cantillon Brewery in Brussels, Belgium while I spent the day traveling through Amsterdam, Netherlands and on to visit the tulip fields in Holland. We stopped in Paris for part of a day so that Drew could see the Notre Dame and the Eiffel Tower, before we took a train up into the Swiss Alps for several days of exploring the beautiful towns of Lauterbrunnen, Mürren, Gimmelwald, and Stechelberg, Switzerland. 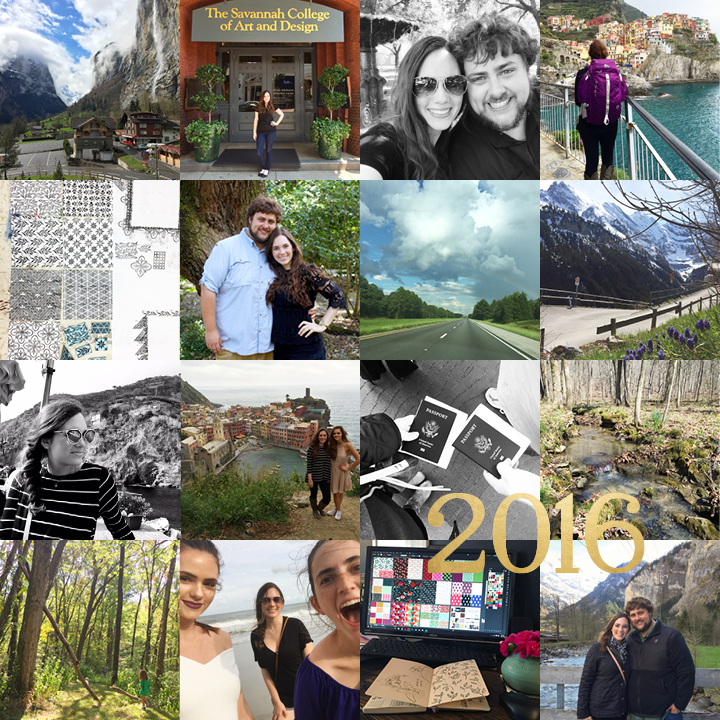 We both fell in love with Switzerland — it’s quaint towns, breathtaking mountains, and crystal clear streams and waterfalls. 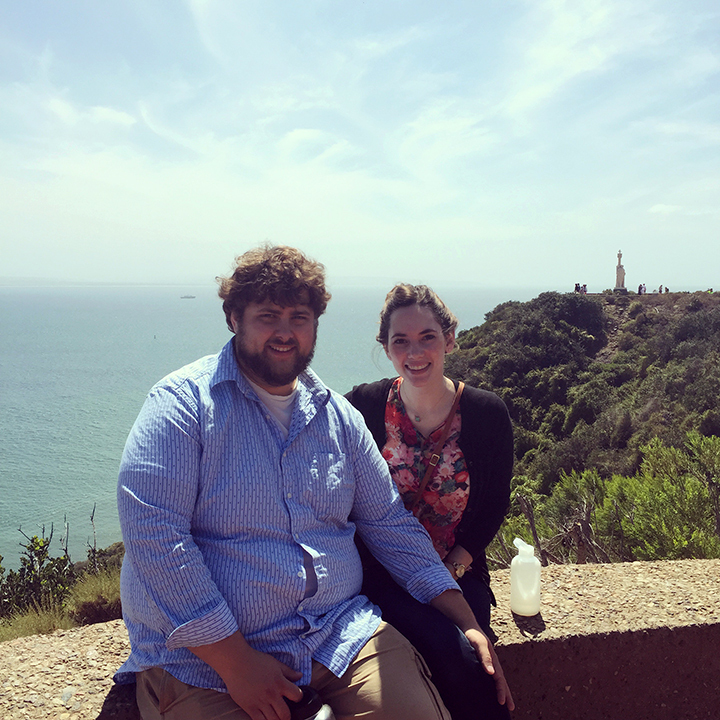 We met up with my sister Kelsey as she studied abroad in Italy and explored the coastal cities in the Cinque Terre with her. She showed us around Florence and we ate the most delicious gluten-free pastries and more gelato in a week than I have in the rest of my life combined. 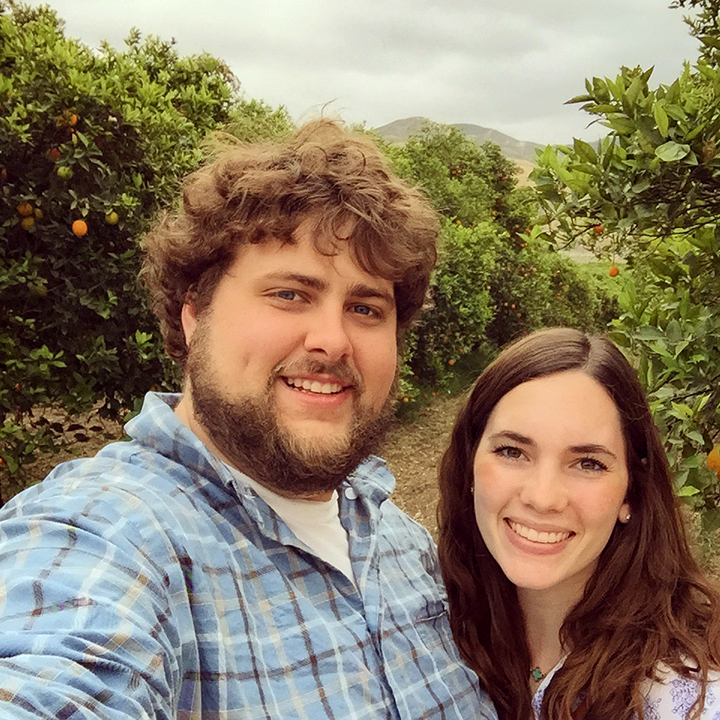 We went on to eat the most amazing pizza in Naples and explore the ancient ruins of Pompeii. We ended our trip in Rome, seeing the Colosseum and Trevi Fountain and visiting Vatican City and the Sistine Chapel. 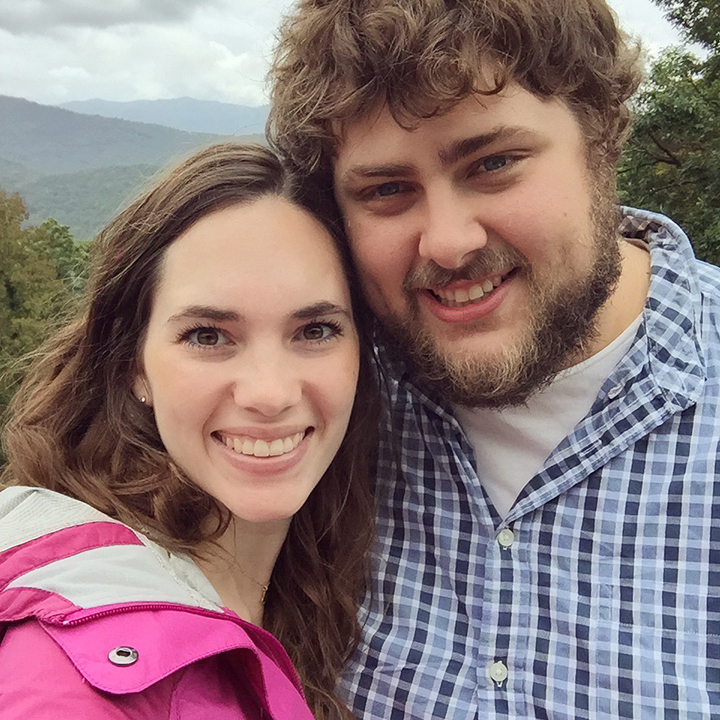 Drew and I finished a 3+ year process of paying off all of our credit card, car, and student loan debt! 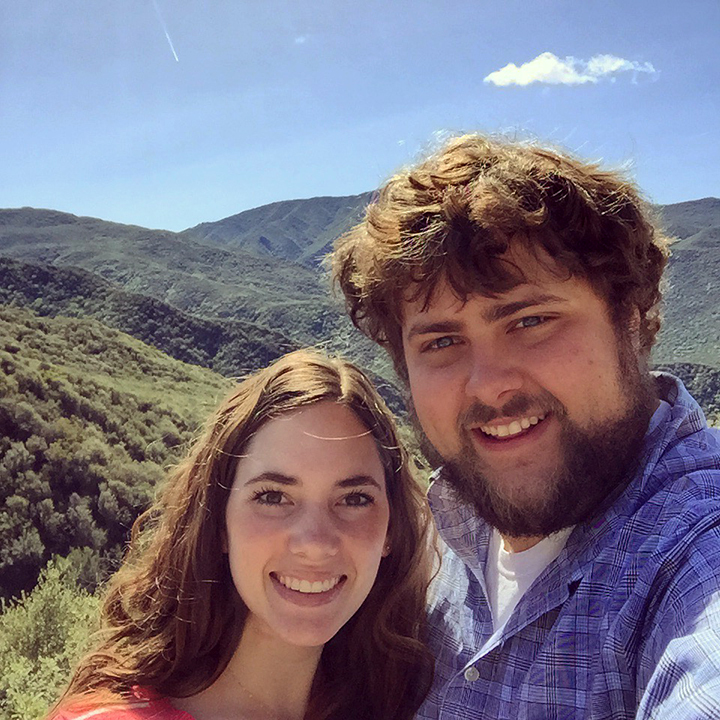 (read more about our debt free journey here) We lived the majority of this year completely debt free for the first time in our married lives, even with paying for two apartments in separate cities and for my grad school tuition! We stretched our possessions to furnish two separate apartments, without buying much more than a Craigslist couch, trash cans, and a couple rugs. I also simplified my clothing into a capsule wardrobe and realized that I pretty much only wear black. Many road trips happened between New Orleans and Savannah and I made the trip from Savannah to Jacksonville, Florida to pick up Drew from the airport many times. We made a few trips to Nashville and Southern Illinois to visit family. We also explored Tybee Island, Georgia and Hilton Head, South Carolina. I even evacuated Savannah from a hurricane — driving the 8 hours to Nashville by myself at night (with Violet). I also traveled to visit my sisters and aunt in Raleigh, Wilmington, and Kure Beach, North Carolina. I worked my full-time job in graphic design for 8 months out of the year, made another quilt and another quilt top, did a 60-day daily practice of block printed patterns, starting painting with gouache, created a complete pattern collection with three colorways, did a lot of reading, writing, and research, re-branded my art portfolio website, and learned a lot about myself and my design style and where I want to go with my career. I turned 25, celebrated 9 years together with Drew, lived completely alone in a new city by myself for the first time in my life, had to learn how to take care of a household alone, struggled with starting school again, missed my husband more than I can even put into words, appreciated him so much more, learned what it means to miss New Orleans, spent both major holidays away from family for the first time, and felt some of the deepest sadness and loneliness I’ve ever felt. For the first time in my life, I cared deeply about the US Presidential Election and was devastated by the results. In stepping so far outside my comfort zone this year, I’ve felt more emotions than I even knew were possible and I’ve also felt so much more alive. I realized just how important getting ~10 hours of sleep every night is to my productivity and sanity. I ate healthier and drank green smoothies for breakfast almost every day. 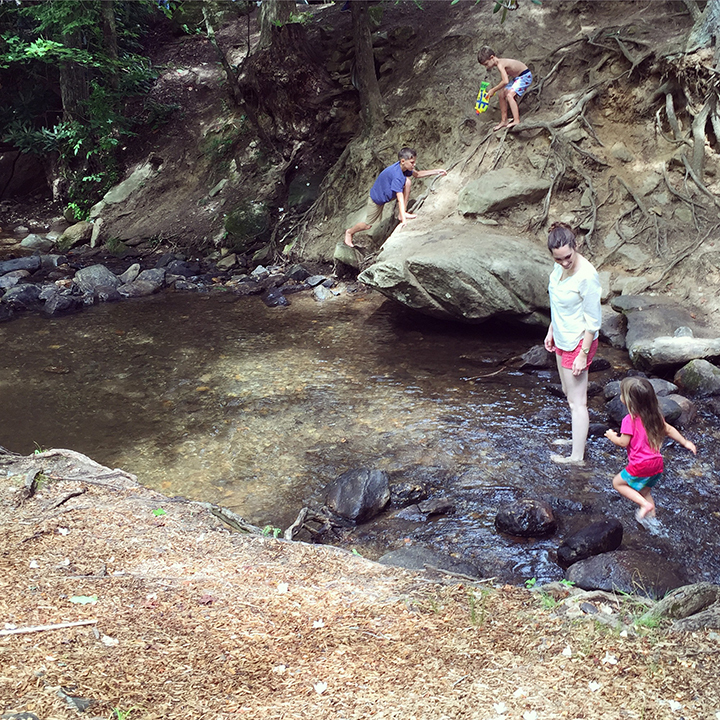 For the first time in over three years, I took time off not just for travel, but to rest. I spent the last month of this year back in New Orleans, clearing my head, re-evaluating my life and priorities, centering myself, and finding so much clarity. 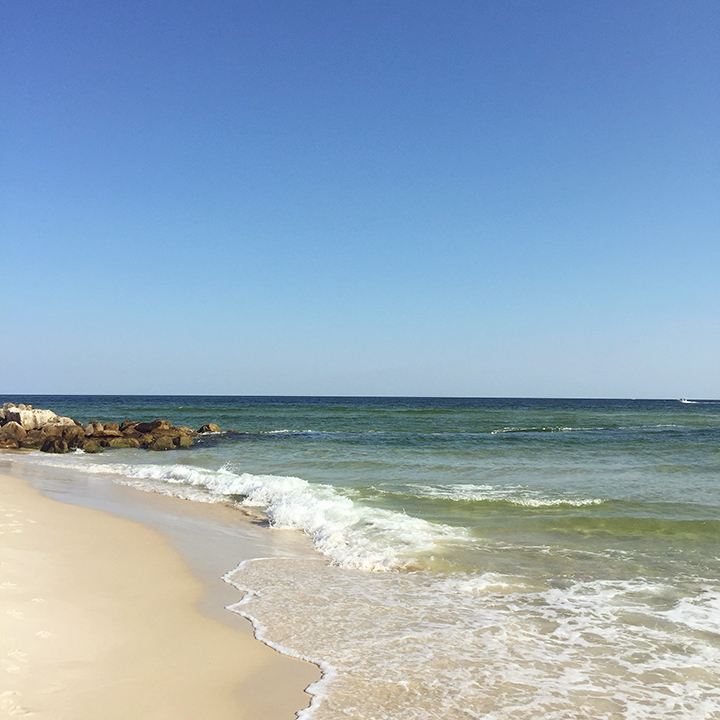 I realized the true importance of taking time to rest and recharge. I also realized how much better I design and operate when it comes from within myself and not to meet other people’s expectations. I also found so much more bliss in small, everyday moments — eating at my favorite restaurants, being back at SCAPC, and slow Saturday mornings with Vietnamese food at Singletons and a visit to a coffee shop with Drew. 2016 was a year of some of the highest highs and lowest lows for me. It was a year of growth in many ways, but growth in addition to being good, is also hard. I’m grateful for the ways that it pushed and strengthened me, glad I lived through it, but also glad to see it behind me. I’m looking forward to what 2017 has in store, but I know that much of it will also be full of good/hard growth. 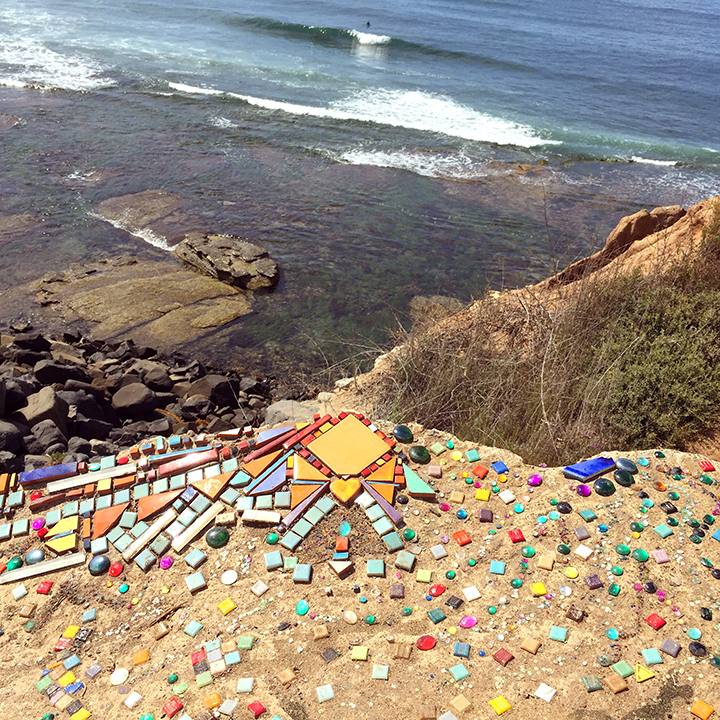 Here’s to new adventures, discoveries, patterns, places, and opportunities ahead. P.S. Past old year reflections and new year goals: Goals for 2016, Reflections on 2015, Reflections on 2014, Goals for 2015, Reflections on 2013, Goals for 2014, Goodbye 2012, Hello 2013, Happy 2012, 2011 and 20 Before Twenty. MAKING lots of art this month! 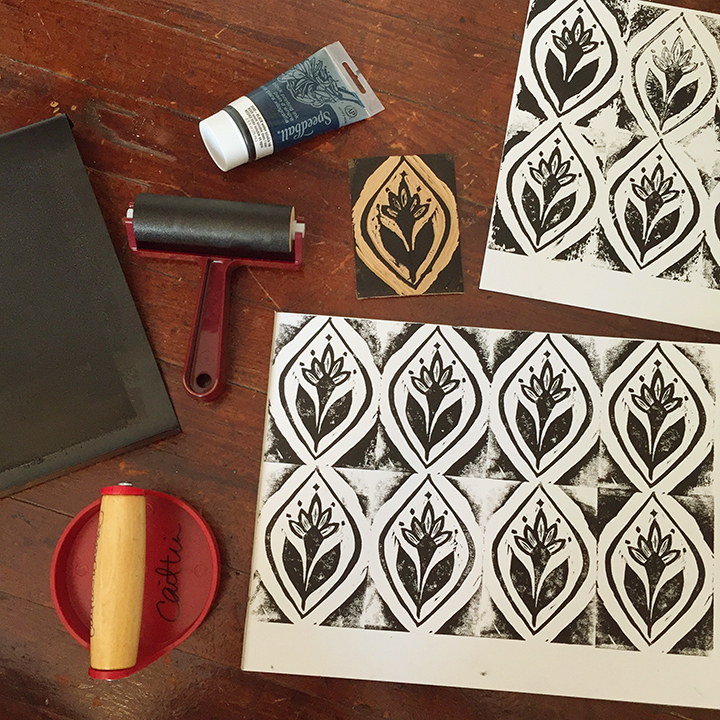 India ink sketches, sketchbook drawings, experimenting with block printing (pictured below). 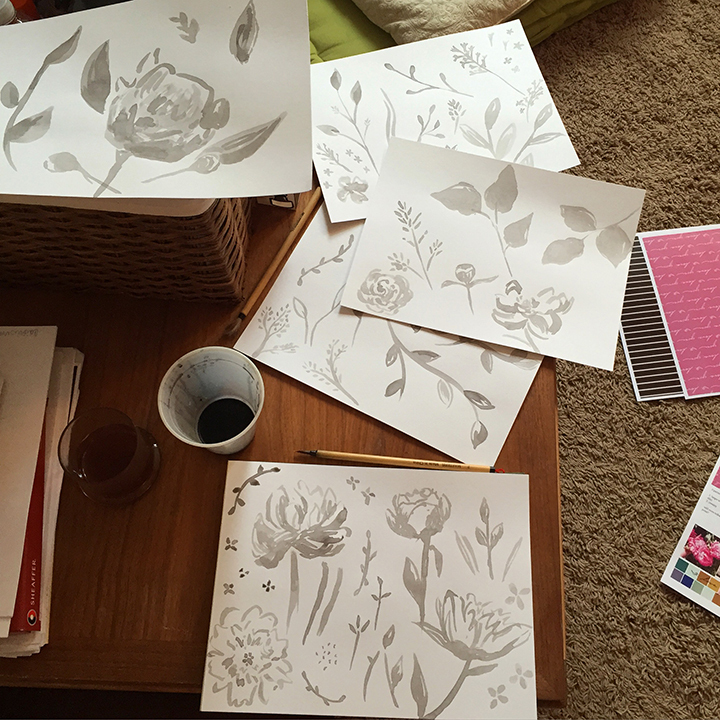 LOVE getting to spend more time making art lately (all for surface pattern design work). COOKING meals from Hello Fresh and Blue Apron. How nice to have all the ingredients for meals delivered right to your door! Use code: CEFVYJ for $40 off your first Hello Fresh box! Also cooking with lots of fresh veggies from my sister and dad’s gardens. Loving all the summer fruit out too — love me some peaches and cherries! And of course, lots of Plum Street Snoballs (pictured above). 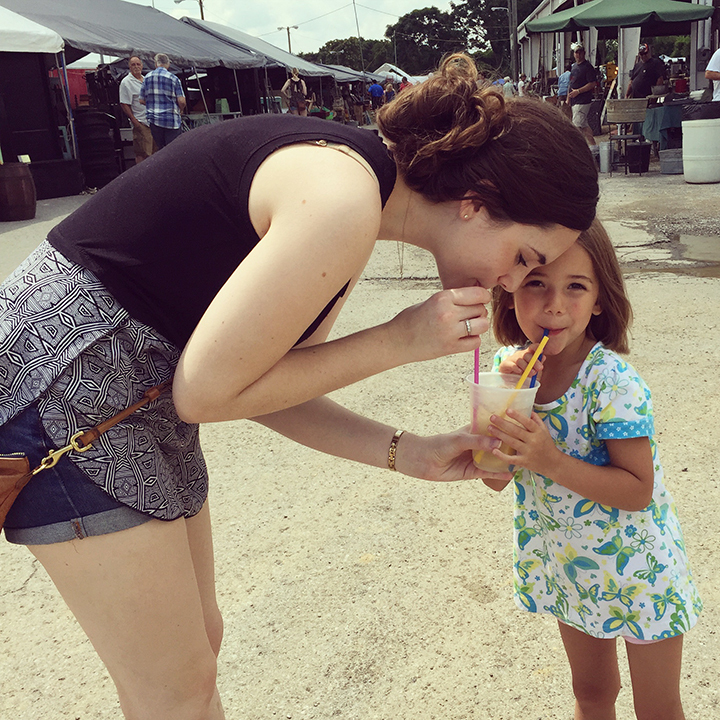 DRINKING Lemon Shake Ups with Drew and Gigi at the Nashville Flea Market. READING Creative Girl: The Ultimate Guide for Turning Talent and Creativity into a Real Career by Katharine Sise. I’m really taking my time reading through this and thinking about/writing through all the prompts. If you are thinking about a creative career, so far this is really a great read! I feel like so much of it is speaking directly to me! 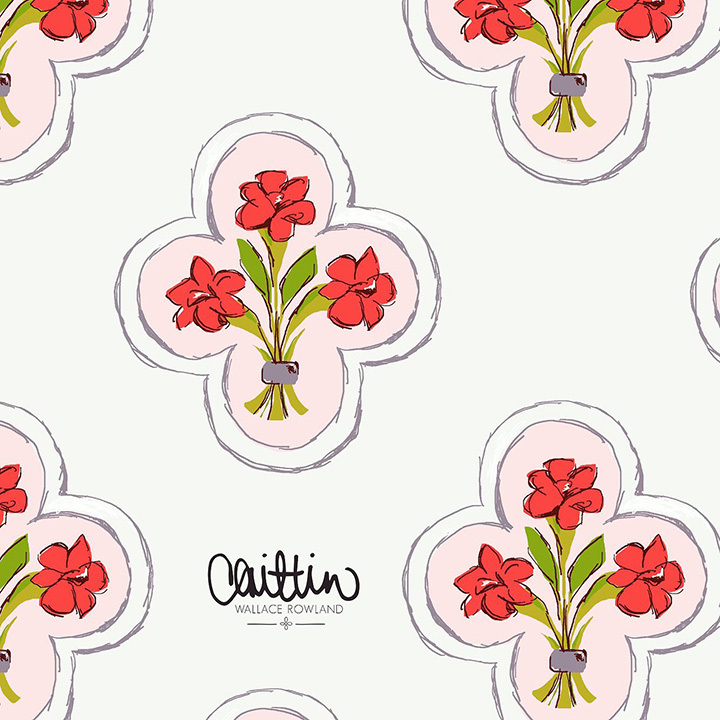 WANTING to continue experimenting with different art and styles of surface pattern design. Really working on figuring out my style and the voice I bring to that industry. PLAYING Kacey Musgraves’ new album, Pageant Material (like seriously on repeat the first couple weeks it came out). 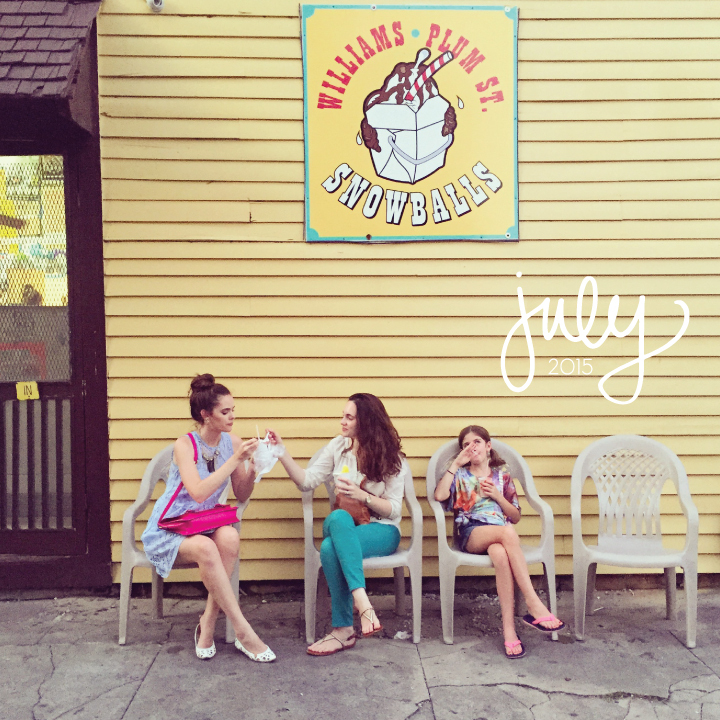 Listening to lots of music on Spotify this month as we took two different road trips. Also lots of records playing in our house, especially after Drew went record shopping all over Nashville. SEWING all the things! Actually just a quilt, but a really awesome one at the Cotton and Steel Patchwork Weekend Workshop at Craft South in Nashville. CROCHETING nothing lately. I have multiple projects in the works, just haven’t worked on them recently. 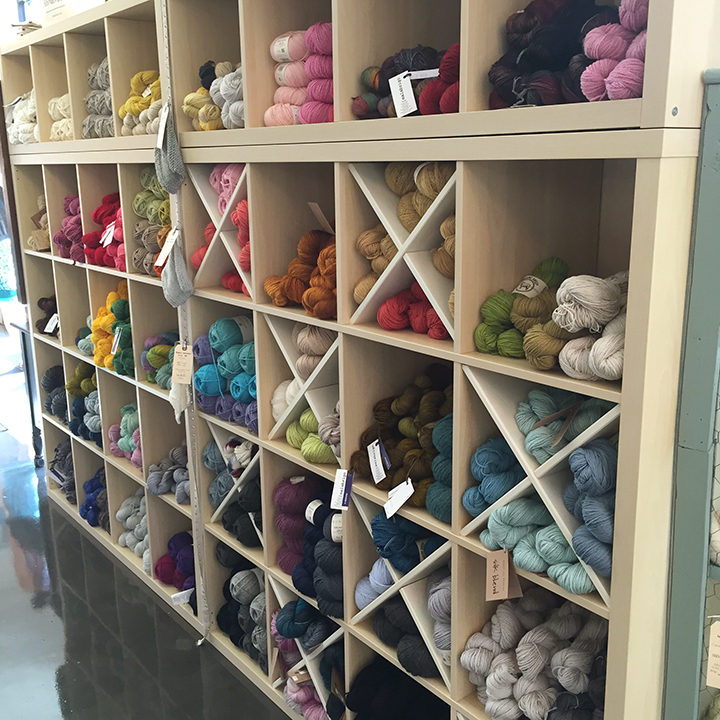 Crocheting has taken a back seat to other creative endeavors. WISHING for a great month of August as we work on home projects and I continue quilting and working on pattern design work. ENJOYING family time! 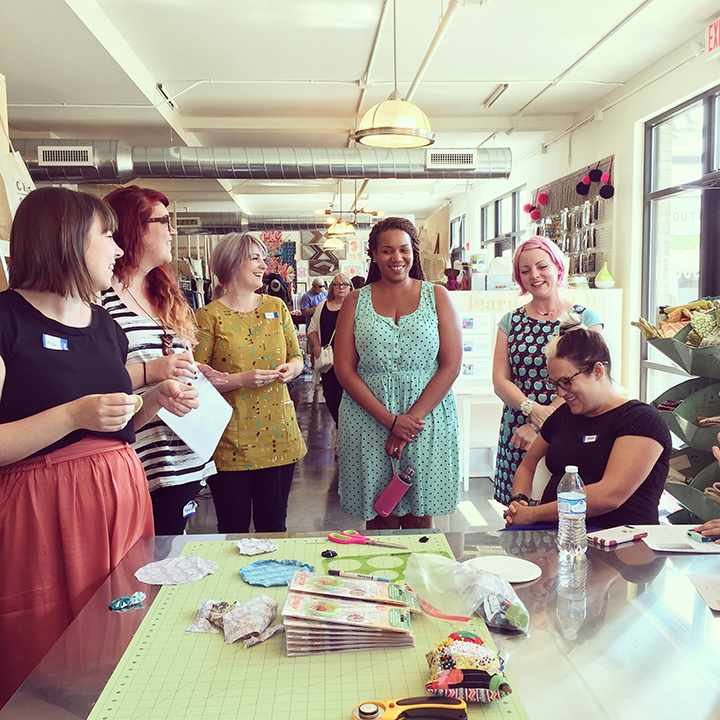 When visiting Nashville for the Craft South Workshop, we stayed with my older sister and her husband and kids that live there and my parents and younger sisters came down from Illinois too. Drew, Gigi, and I went to the Nashville Flea Market, we had a tie-dye birthday party for my niece, Evie, and then my sister, Kelsey, and niece, Evie, rode back to New Orleans with us and spent a few days here. Then my dad came to New Orleans to bring me my furniture (and pick Kelsey and Evie up). So much family time this month! WAITING to work on/finish up some fun house projects in our foyer/dining room! LIKING having my work office back in order after crazy renovations all summer! 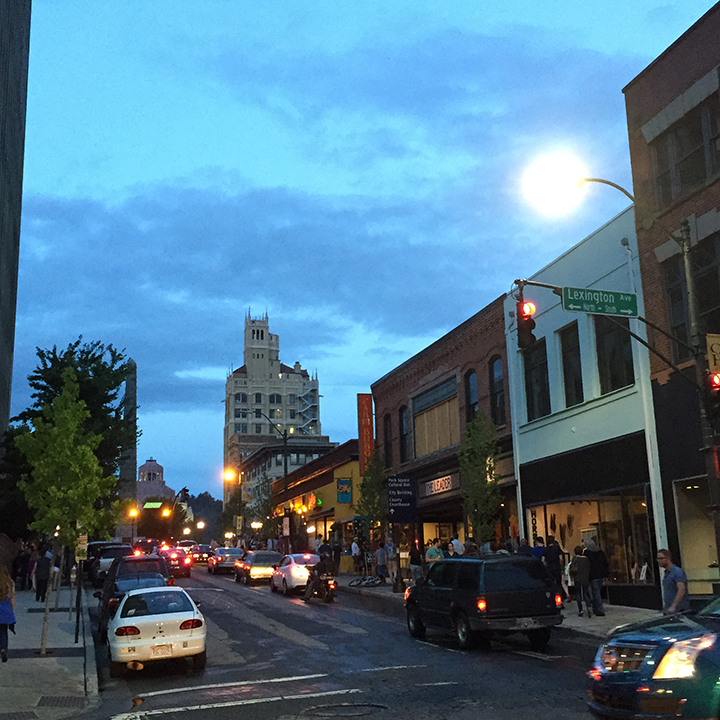 LOVING Asheville! 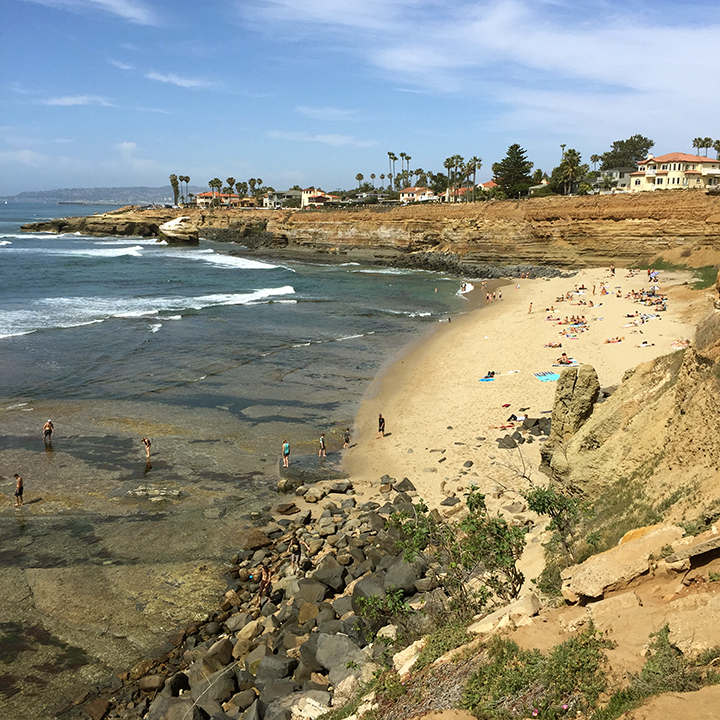 We took a trip there over the 4th of July weekend and it was amazing! Great weather, amazing views, delicious GF food. It was just a wonderful and relaxing trip. 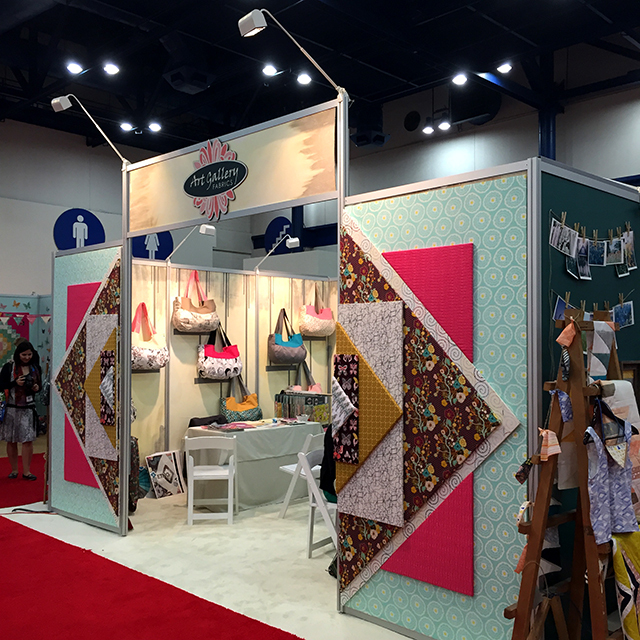 HOPING to continue working on my Cotton and Steel / Anna Maria Horner quilt I started at Craft South. I’ve wanted to get into quilting for a long time, I can’t wait to finish this one! MARVELING at all the wonderful adventures we’ve been on this summer. NEEDING a creek like this in my life all the time. LEARNING more about my design style the more patterns I make! And this month I made several! See some here, here, here, and the one I made from a hand-carved and printed block print, here. Also a couple more for an exciting project, here and here. SMELLING peaches? snoballs? heat? Oh the smells of summer. WEARING new jeans I got from Madewell (my first pair from them and loving them so far). Lace kimonos, breezy summer tees, jean shorts (while on vacations). 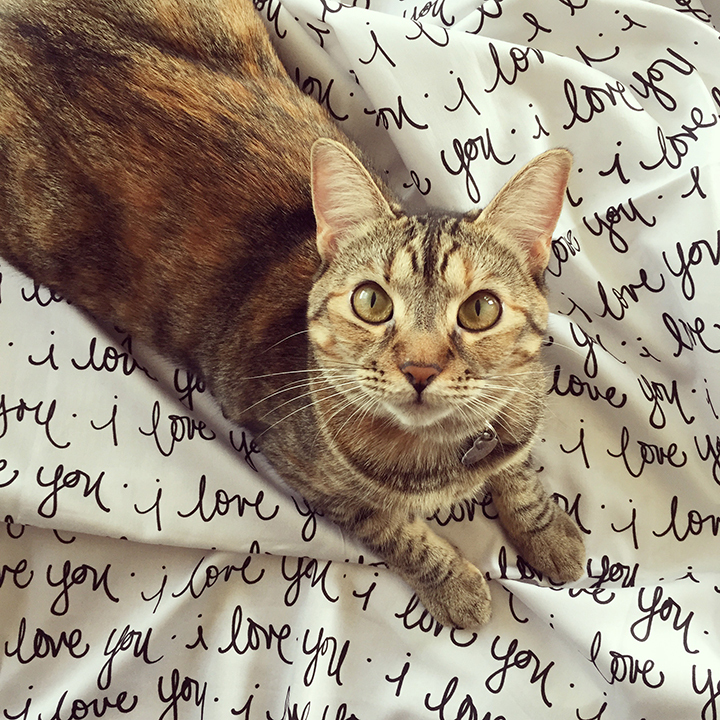 FOLLOWING me around and having to be in the middle of everything (Violet that is) — she hopped right up onto the fabric I had printed as soon as I set it on the table for a photo. Love seeing my designs on fabric!! NOTICING this amazing mirrored tile wall at the French Quarter Sucre. KNOWING that although I didn’t study design like I wanted to in college, that I’m so thankful for my art degree and what it taught me (and the skills I have because of it!). THINKING about the talented designers that designed old book covers and pages. Such beautiful patterns! CELEBRATING Evie’s birthday, vacations and road trips, time at home. 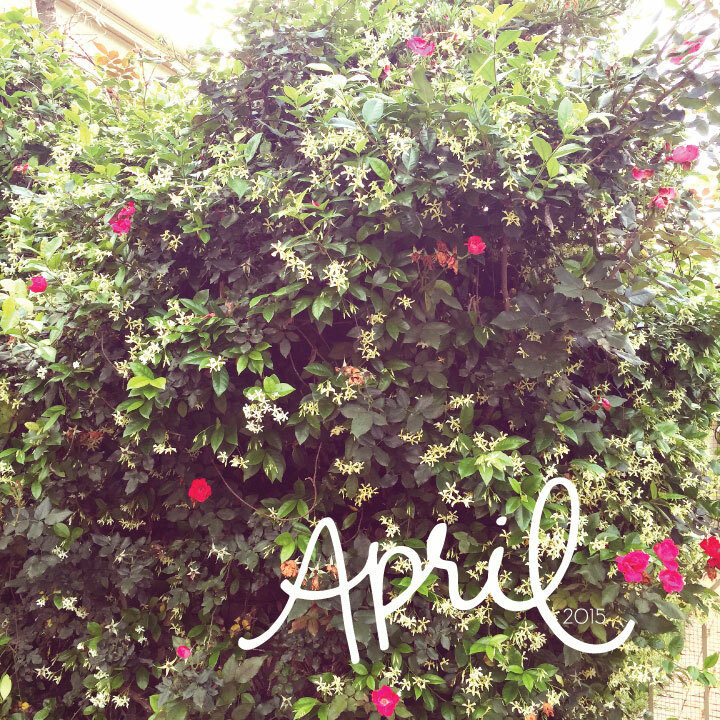 Lots of lovely this month. OPENING the door for Drew and his friend as they unloaded the furniture into the house that my dad finally brought me from Illinois. Our church pew finally arrived as did our mid-century modern cabinet/dresser. LOVE them!! LAUGHING at Violet and her silly ways. Always. FEELING grateful for how full and amazing this summer has been in so many ways. 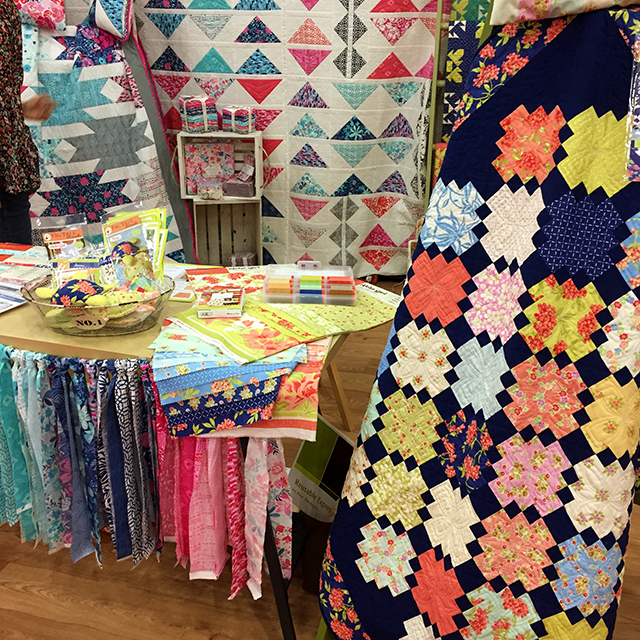 Last weekend, I attended the Cotton and Steel Patchwork Weekend Workshop hosted by Anna Maria Horner at her new (and fabulous!) 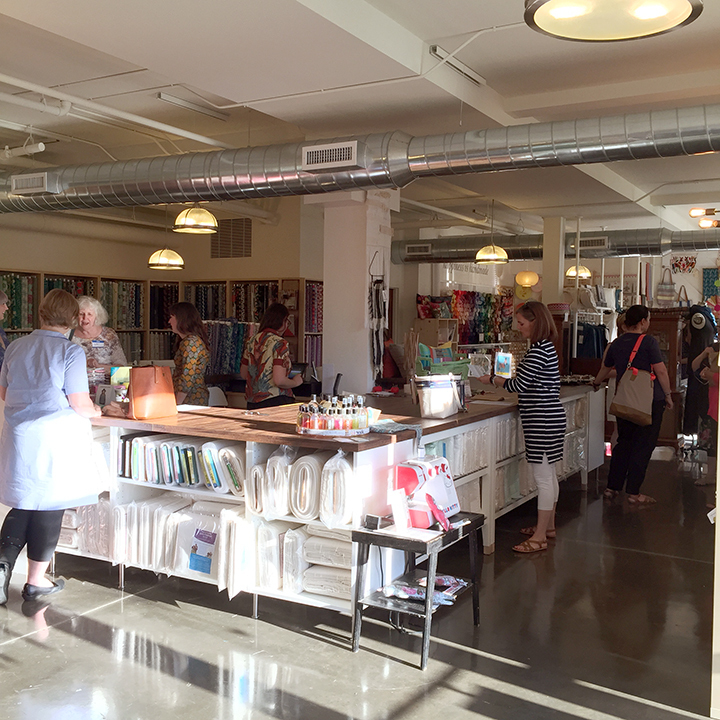 shop, Craft South, in Nashville, Tennessee. Craft South is so insanely beautiful and inspiring. You can’t walk into this space and not be inspired to create. How I wish this space existed in New Orleans (or that I lived closer to Nashville!). I love the workshops that Craft South is putting together. So many great things happening there! (see upcoming workshops and classes here). As you all already know, Anna Maria Horner and her fabulous fabric design skills have been an inspiration to me for quite a while (read more about that, here), so I’ve been dying to get to Craft South and take a workshop ever since she announced that it was happening (she started Craft South workshops last summer in another location and then opened Craft South the store this past May). 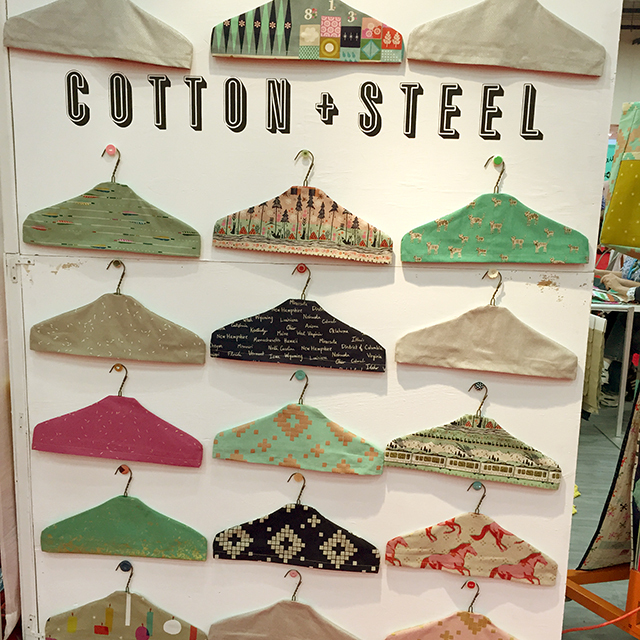 When I saw that she had put together a weekend workshop with all five of the founding designers of the fabulous Cotton and Steel, I jumped at the opportunity! 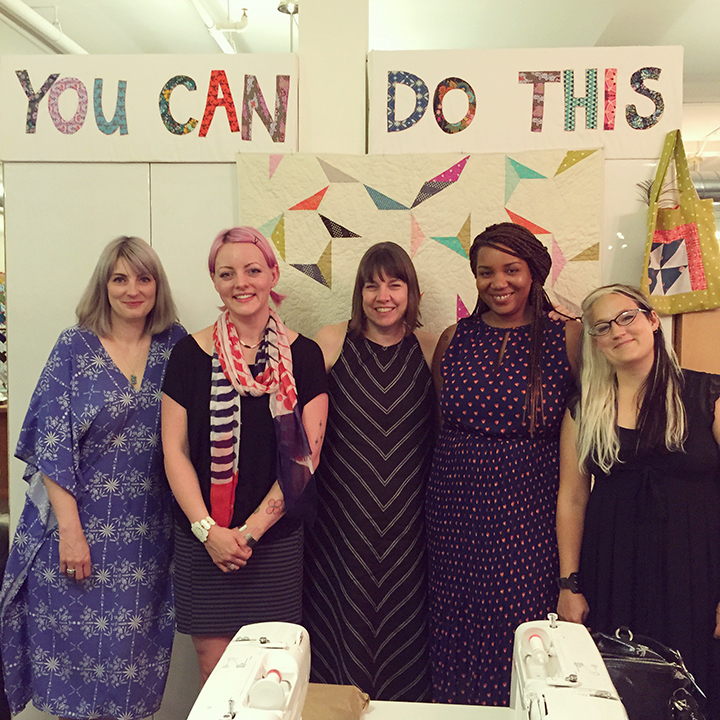 Six amazing fabric designers all under one roof teaching me how to quilt and chatting about the industry? YES!! My older sister lives right outside Nashville, and we love the area, so it is always nice to have an excuse to make a visit up there. It is only a few hours from my hometown, so my parents and sisters also came down to visit while we were in town for the workshop (we had a tie-dye birthday party for my niece, Evie, while I was there too!). 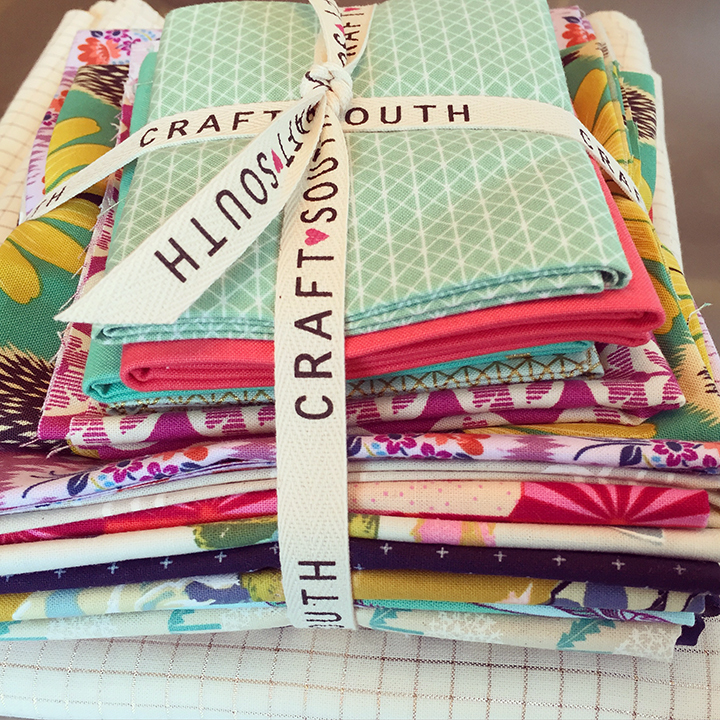 I loved getting to explore the 12 South neighborhood of Nashville that Craft South is in. I hadn’t spent much time in that area before, but it is a great little area! Lots of cool restaurants and shops. I was a little nervous to take the workshop considering I’ve never actually made a quilt before. But I have a sewing background and I’d done some other quilting-type projects before (I made a quilt top and stretched it like a canvas to paint on in college and when I was younger I did some paper piecing), so I was prepared enough. 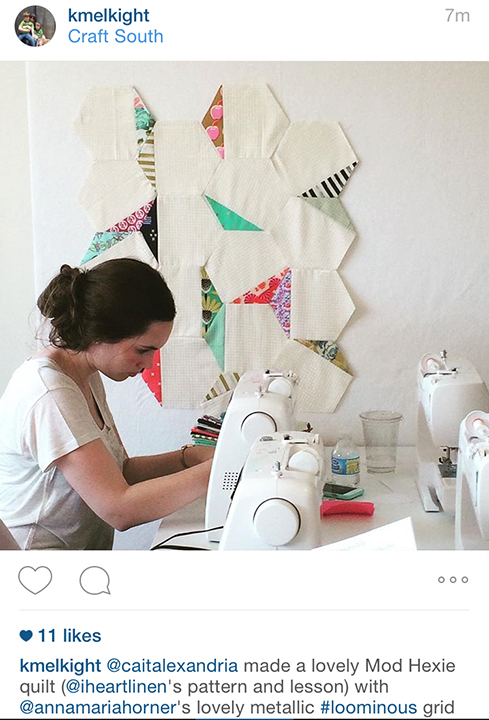 If you remember from my goals for 2015, quilting was one of them! I really love the way my quilt is starting out! LOVE those little paper airplanes! 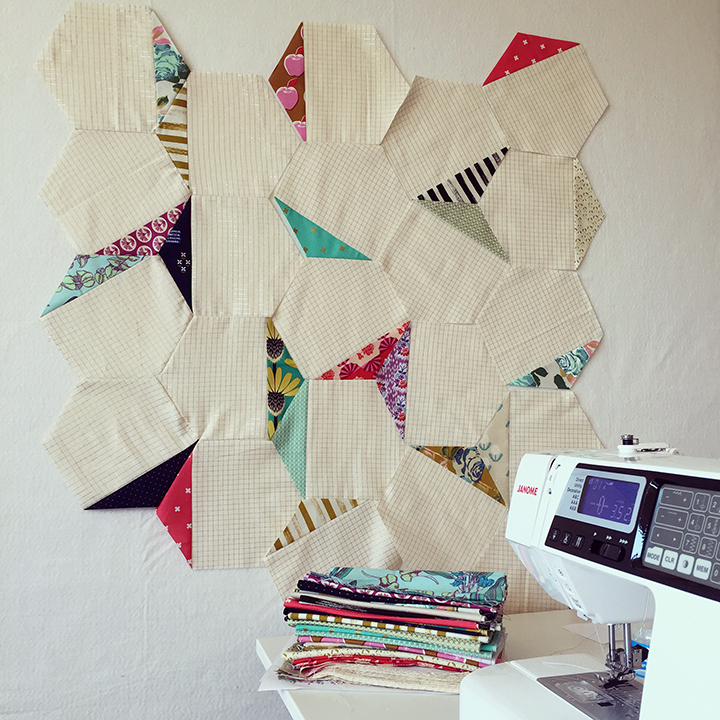 The quilt pattern we worked from for the workshop is the Mod Hexagon Quilt by Rashida Coleman-Hale (one of the designers for Cotton and Steel). The patterned fabrics I’m using are fat quarters of different prints from Cotton and Steel and Anna Maria Horner. For the background fabric, I’m using a metallic woven from Anna Maria’s Loominous fabric line (it is so pretty and sparkly – I wish you could see that better in the photos). We also learned how to make fabric yo-yos and patchwork zip and Gamaguchi pouches, but I mostly stuck to working on my quilt. I wanted to get as much as I could done while I was there. I still have quite a bit left to do. I enjoyed getting to sew on the Janome machines while I was there. Craft South is also a Janome dealer if you are in the area and looking for a new machine. If I decide to keep quilting, I will probably have to eventually upgrade my basic Singer machine, but for now I can make it work. It really was such a great weekend and I’m so glad I went! 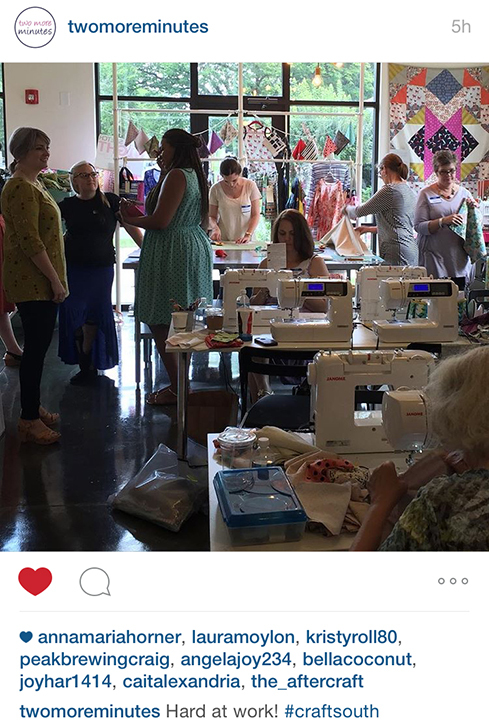 All the other workshop attendees were the best and I enjoyed hanging out and sewing with them for the weekend (and learning from them!). 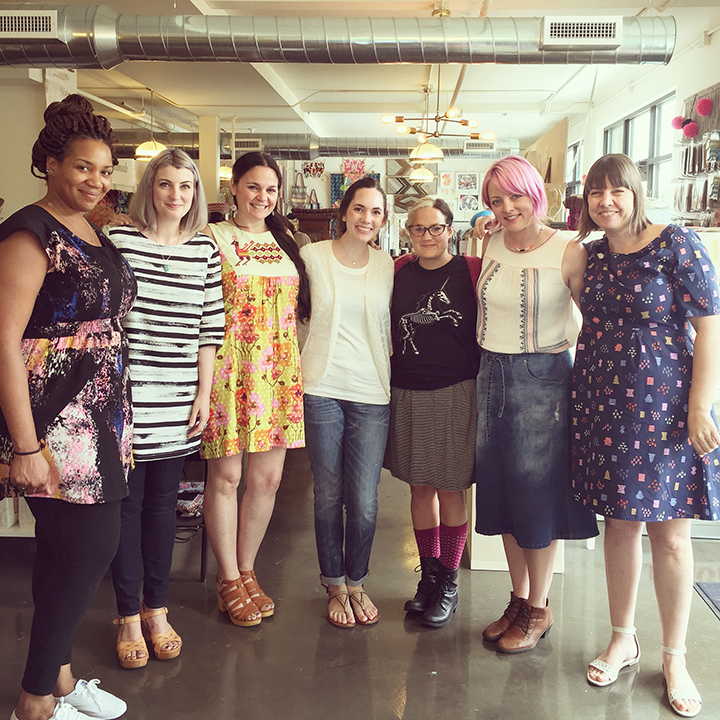 All the designers of Cotton and Steel (Melody Miller, Rashida Coleman-Hale, Alexia Abegg, Sarah Watts, and Kim Kight) are seriously some of the nicest people I’ve ever met. It was such a treat learning from them about sewing, quilting, and the fabric design industry. I especially chatted with Melody and Alexia at dinner both nights and loved hearing about their stories, successes, and advice they had for others wanting to explore the fabric design and manufacturing industry. 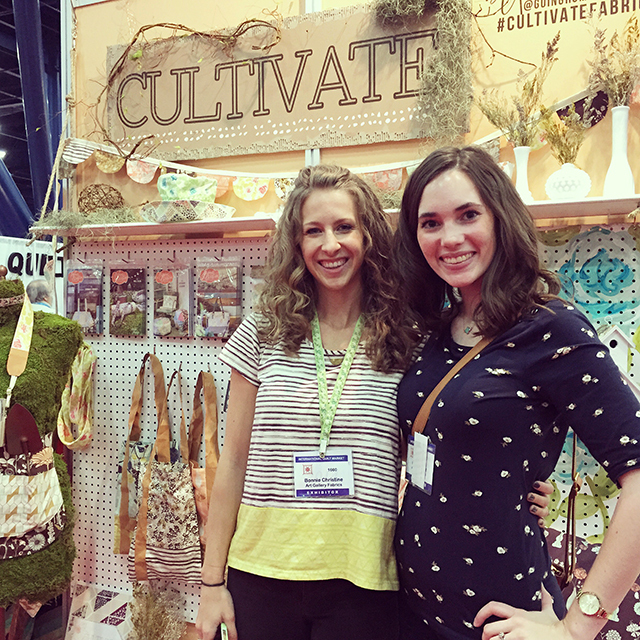 If you get the opportunity to meet these amazing ladies or take a class at Craft South, do it!! 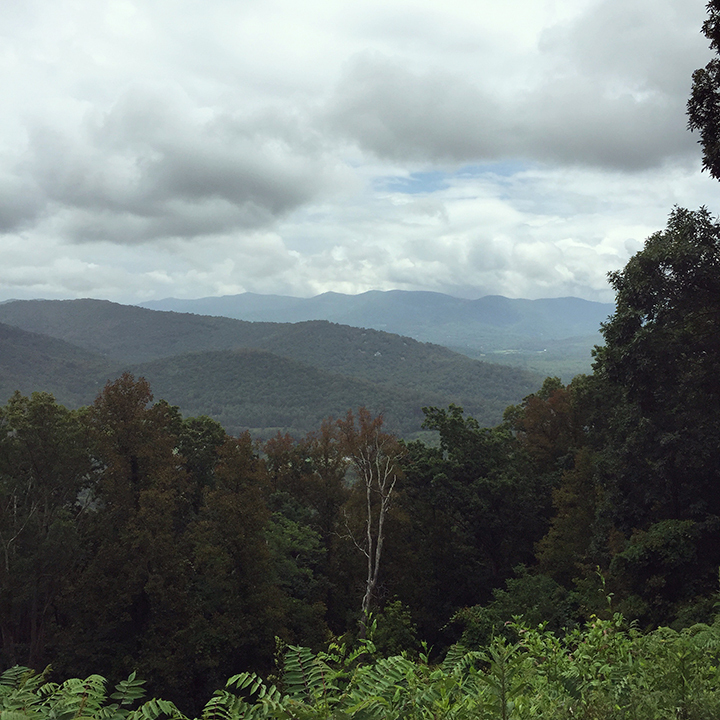 A couple weeks ago, over the 4th of July weekend, Drew and I took a little mini-vacation to Asheville, North Carolina. 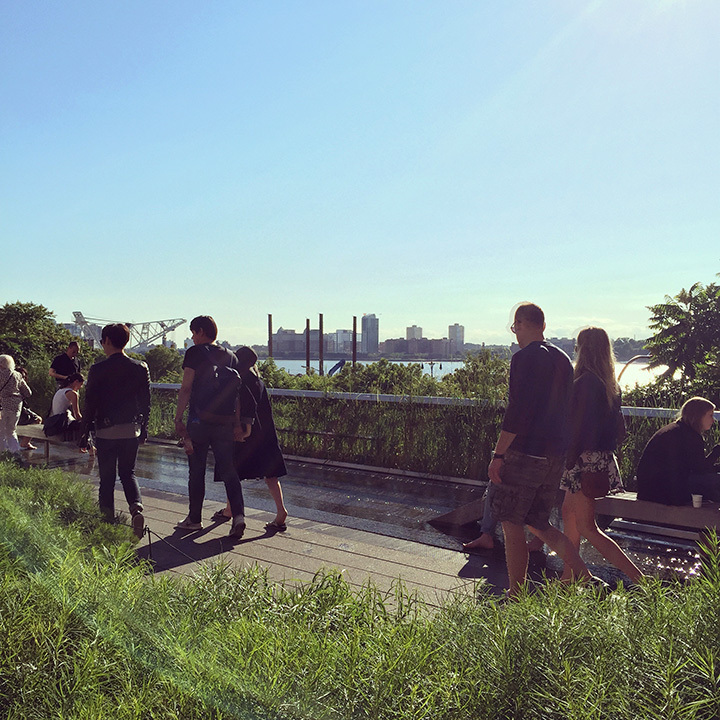 We’d heard so many good things about the place and it seemed like our perfect city (arts, nature, GF food, craft beer). 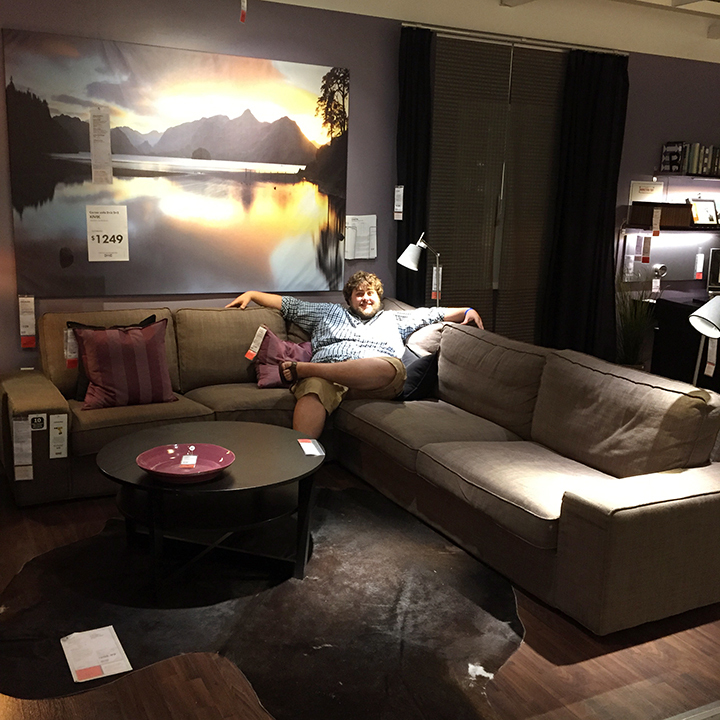 We couldn’t wait to check it out, and it definitely lived up to the hype! The weather was amazing, the views were gorgeous, and it was one of the most relaxing trips we’ve ever taken. We got a late start due to Drew’s flight delays getting back to NOLA from a business trip in Philadelphia. He was supposed to get in the night before we planned to leave, then we planned to get up at 6 a.m. to make the 12-13 hour drive (plus an hour time change) to Asheville. He ended up spending the night in the Atlanta airport, then making it to Dallas the morning we were supposed to leave. Finally he got to New Orleans, but not until 10:30 a.m.! So much for leaving at 6 a.m.! 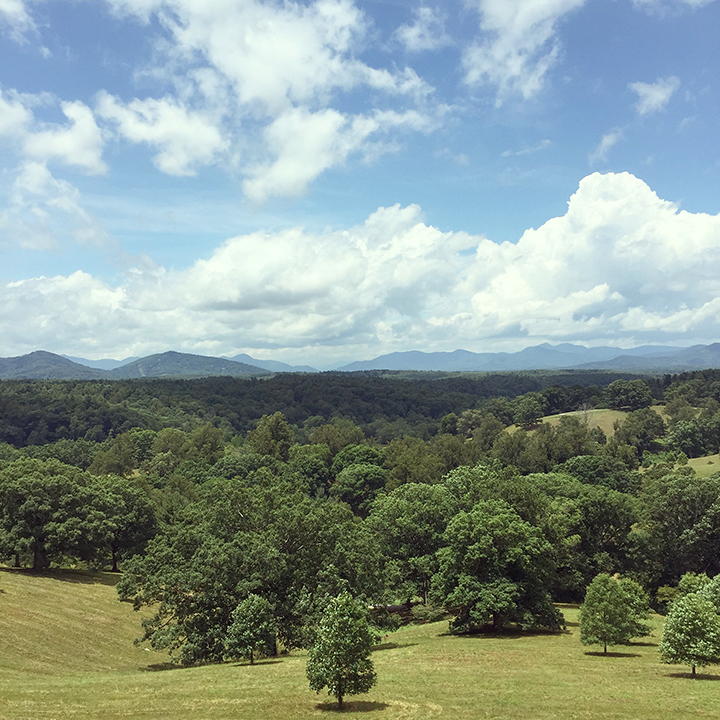 I guess we shouldn’t plan back-to-back trips like this, but it all worked out in the end, we were just really tired by the time we got to Asheville! 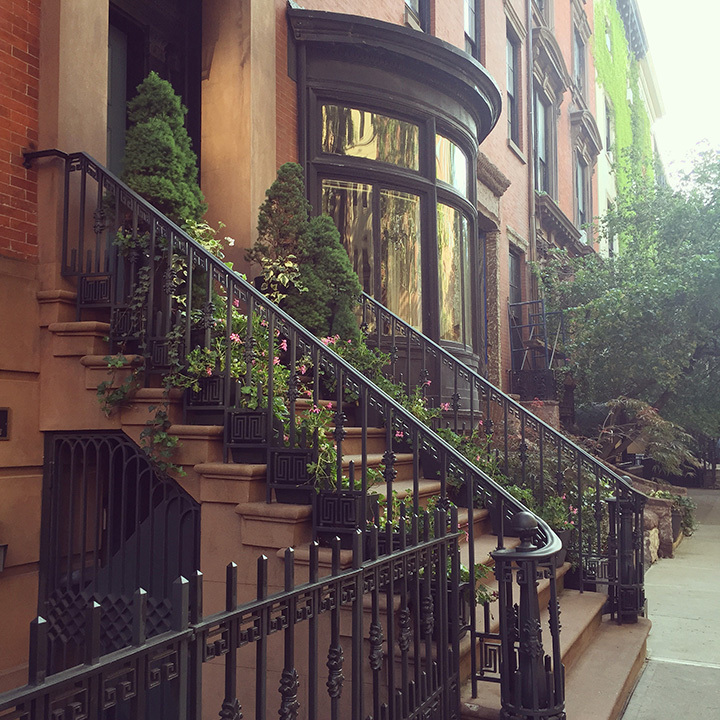 We stayed in this adorable Airbnb, which I highly recommend. 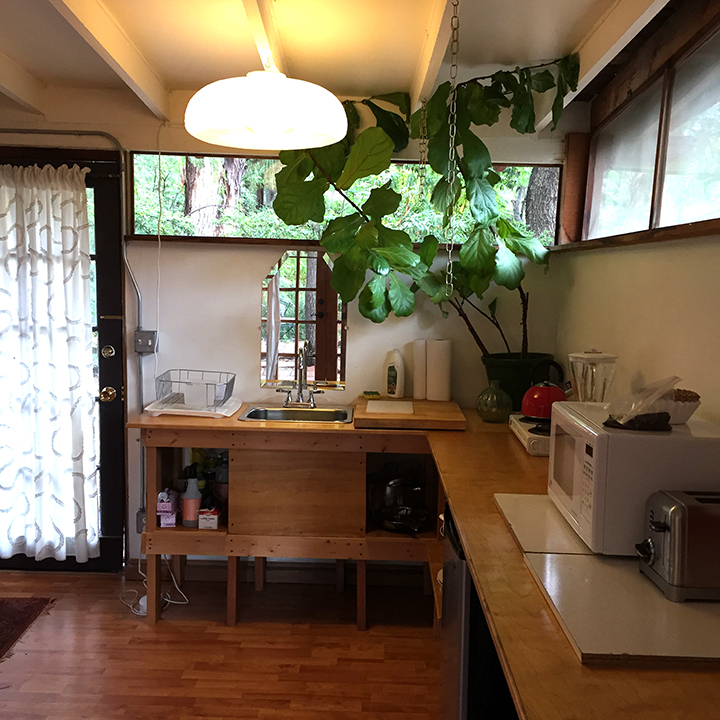 It was the cutest little apartment with our own kitchen, living room, bedroom, office area, and bathroom. 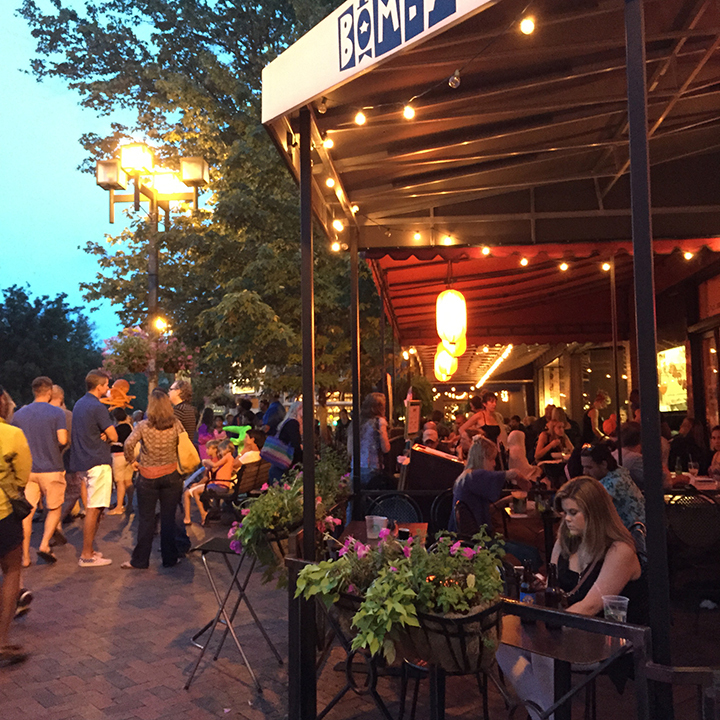 It felt secluded out in the country (we had an adorable little patio area), but was only a few minutes from both the River Arts District and Downtown. We checked out the adorable little downtown area with shops and restaurants, the River Arts District full of artist studios, drove along the Blue Ridge Parkway for amazing views of the mountains, headed to Montreat Conference Center for a cute little 4th of July parade and fun playing in the creek (I work at a Presbyterian Church and Montreat is well talked about here! It was nice to finally see it in person! 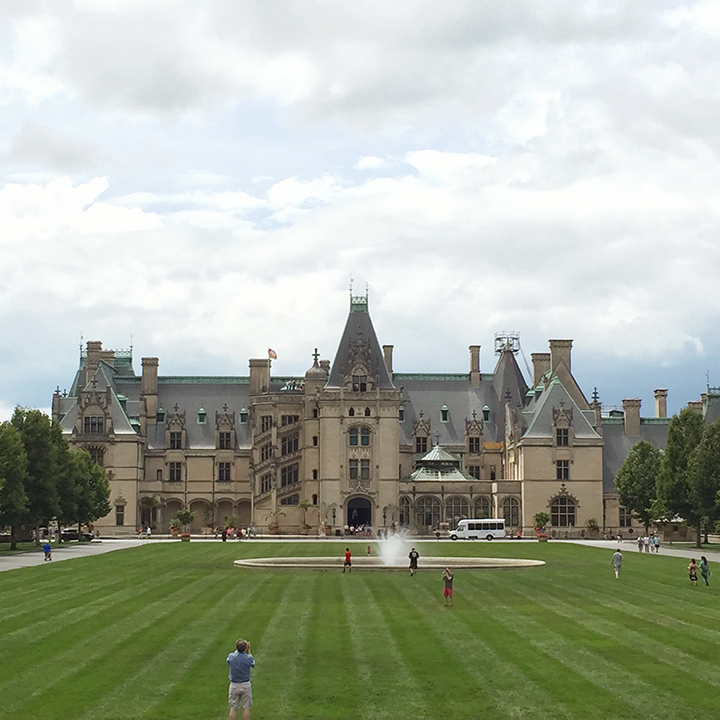 ), watched the fireworks from a Veteran’s Memorial, found the most amazing antique stores, toured the Biltmore house and gardens (and winery and museum), and visited many craft breweries. It was a fun, busy, and relaxing weekend! I wanted to hike to some waterfalls and kayak down the French Broad River, but we didn’t get a chance on this trip. Next time! One of the best things about Asheville was the amazing food! They are very gluten-free friendly, so it was so easy to eat well and GF! Our favorite restaurants were: King Daddy’s Chicken and Waffles (GF chicken and waffles, yes please! ), Homegrown, Tupelo Honey Cafe, and Biscuit Head (GF biscuits and a jam bar!). We also checked out French Broad Chocolates, which was great, but a little too rich for me! Everyone raved about 12 Bones BBQ, but we tried it and the meat was tough and dry. Some of the worst BBQ I’ve ever had, actually. Maybe it was just a bad day? Other places we wanted to check out, but didn’t make it to: White Duck Tacos (they were closed when we tried to go) and Sunny Point Cafe (we tried to go the last day, but the wait was an hour and forty-five minutes!). 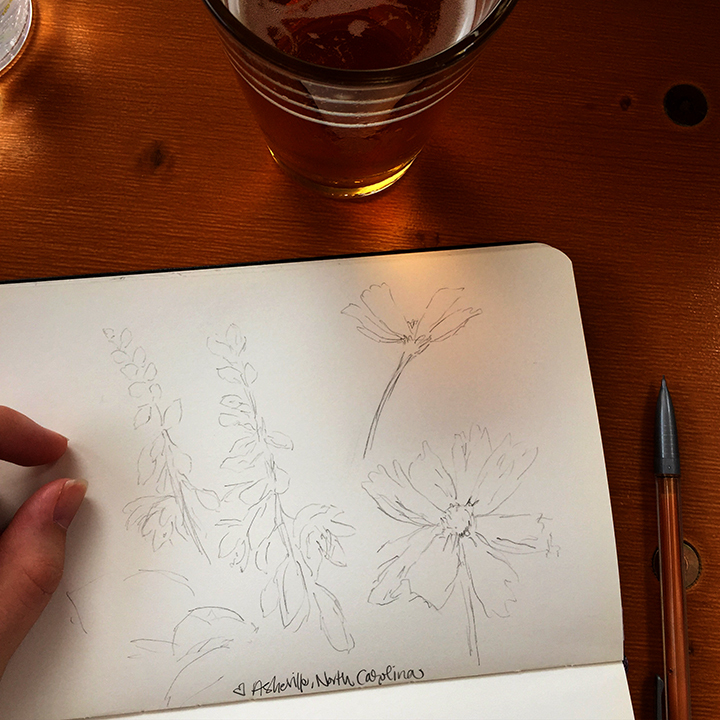 While Drew was enjoying craft beers, I was sketching flowers I’d seen around town. 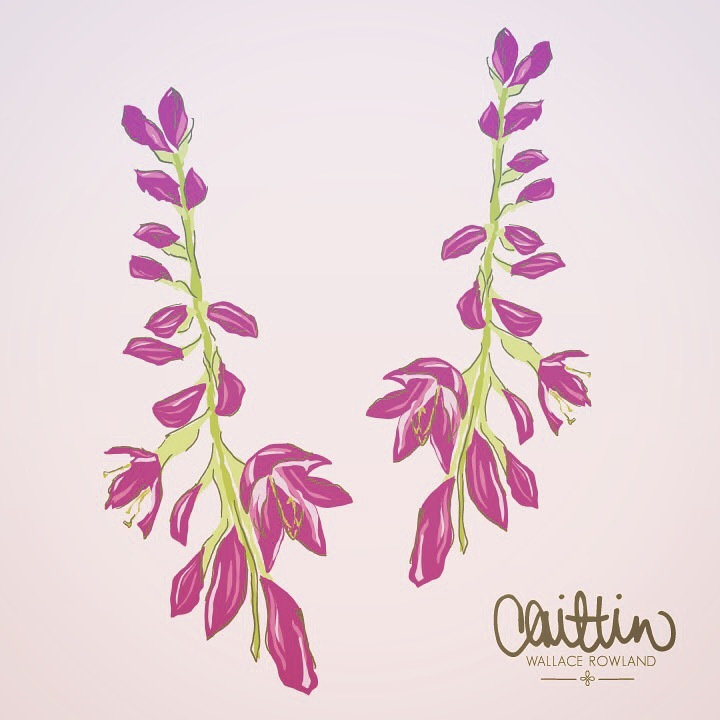 I even did this digital illustration when we got home of my sketch of some Hosta flowers from the backyard of our Airbnb. 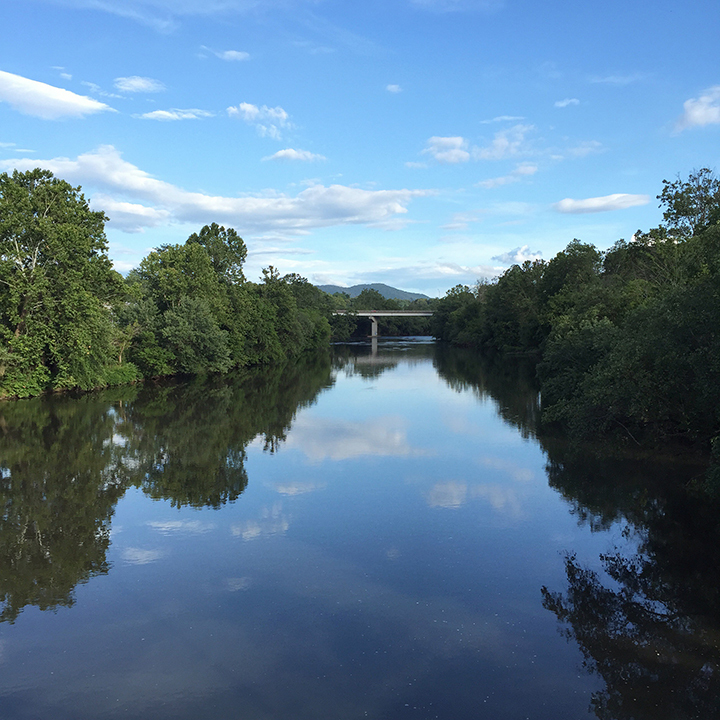 We fell in love with Asheville and can’t wait to make another trip! We’d highly recommend it! Especially a great place to visit in the summer to escape the blazing hot New Orleans heat! 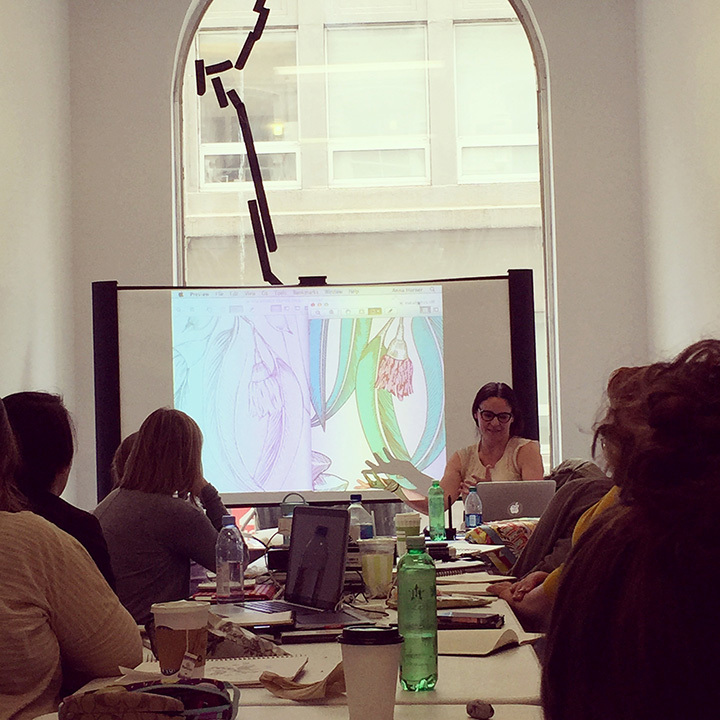 This past weekend, I had the incredible opportunity to travel to New York City and attend a three-day Fabric Design Workshop led by the amazing designers Heather Ross and Anna Maria Horner. 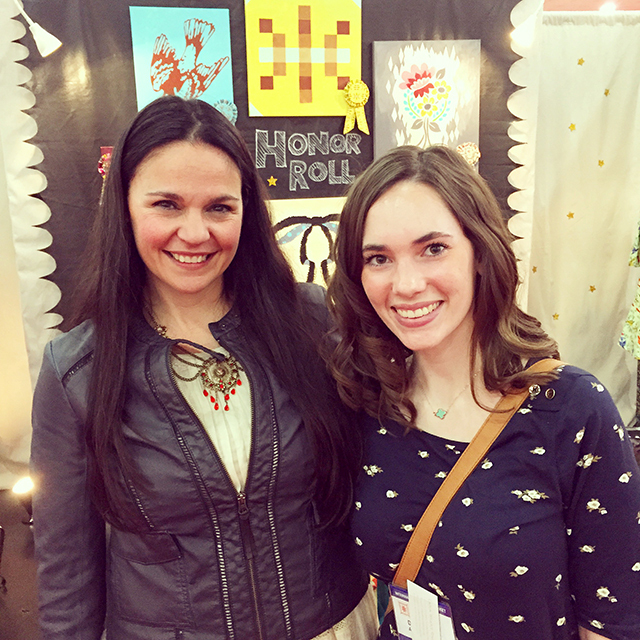 (I’ve mentioned AMH several times on here before, you might remember me meeting her at Quilt Market last year). 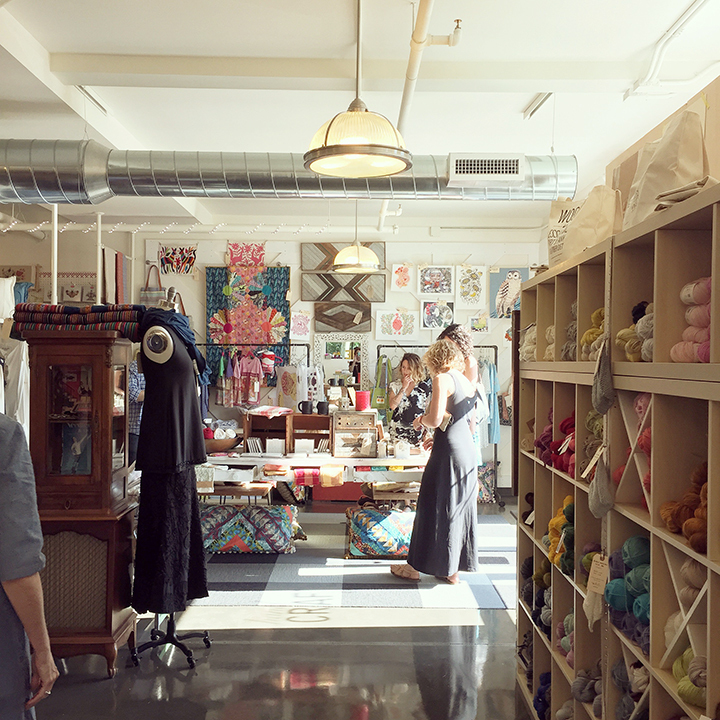 Three days of insight into the fabric design and manufacturing industry, peeks into the design process of Heather and Anna Maria, looks at their sketches and fabrics, great conversations, learning a different design process, and exploring the awesome city of New York. Above Anna Maria is showing us an example of her original sketch and then her final pattern (Eucalyptus from Pretty Potent). Again, another sketch to final pattern example. This one is Small Gathering from Folk Song. I was so happy that she showed this particular example, as this fabric was actually quite influential to my own story. When I was prepping for my freshman dorm room at Tulane, I bought this fabric (in her Good Folks collection in the sea colorway) to make a pillowcase for my bedding. That fabric ended up being the jumping off point for my dorm decor. It was while I was living in that dorm room that I realized I had a passion for design and that I wanted to be a designer. Not long after that that I read an article in Country Living about Anna Maria Horner and saw this sketch on her bulletin board in the photo of the article and realized she was the designer of my pillow fabric. I had always been a collector and lover of fabric, but hadn’t before thought much about the design process or the designers behind them. That article and AMH’s fabrics started my desire to learn more about this elusive industry and made me want to design fabric of my own! I also love the sweet illustrative style of Heather Ross’s work and I loved getting to learn about her process as well. 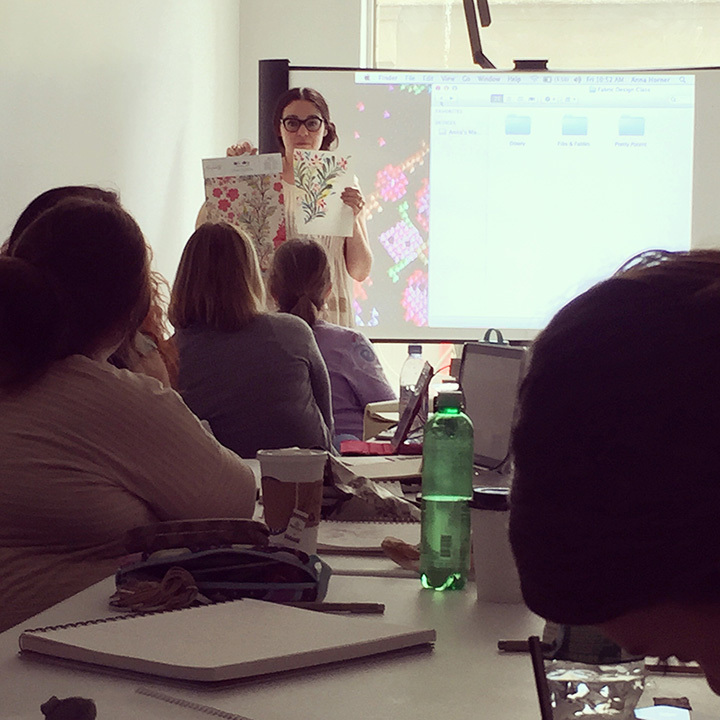 In the photo above, she is showing the class how to build repeats in Photoshop using one of my designs as an example. Loved seeing the subtle differences in the colors she chose, verses the jewel tones I was originally using. I really love how the final pattern came out. It is a different style than my other work (much more sketchy and hand-drawn looking), but I really love it! As I said before, the original colors I used were jewel toned, as they usually are, and in Heather’s demo, she changed the colors to these. I loved seeing my work re-colored and in a new light. These aren’t colors that I typically would have chosen, but I love how they work together. It has me looking at colors differently now! Anna Maria also gave several talks about her color theories in her work and I loved hearing her perspective. 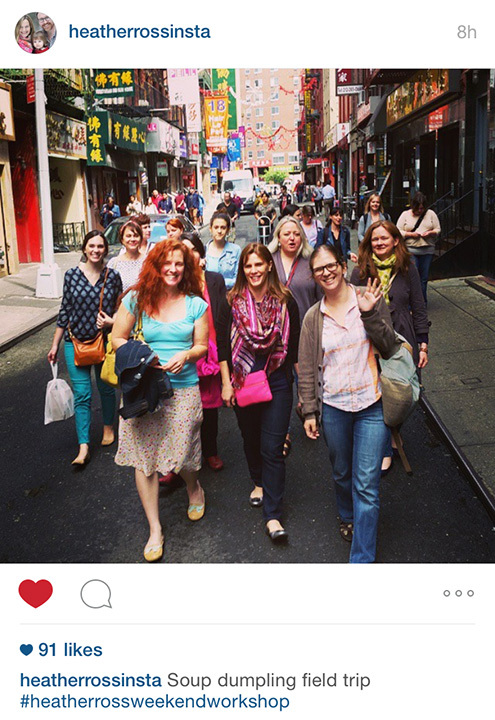 The class met in the same building as Heather’s studio, on Fulton street in the Financial District in Lower Manhattan. It was only a few blocks from the new Freedom Tower/One World Trade Center, and was an awesome area to get to explore a bit. 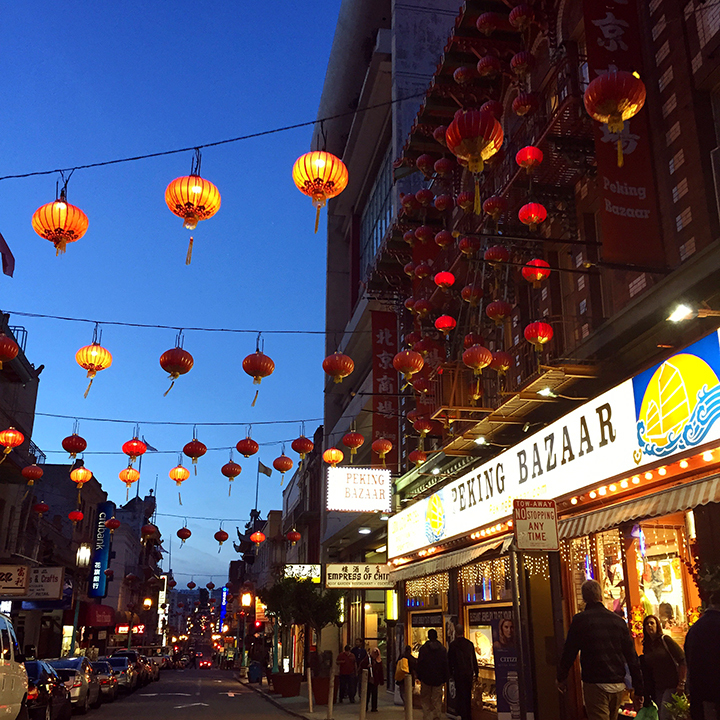 We walked over to Chinatown one day for soup dumplings for lunch. 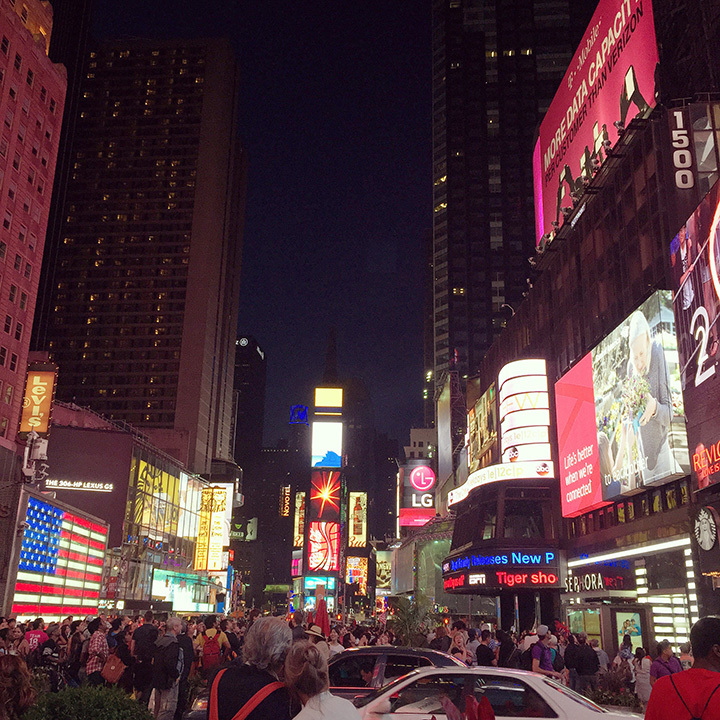 I was in class most of the time we were in NYC, but I got the chance to explore a few other places in the evenings. This was my third time visiting NYC, so I didn’t try to squeeze in a lot. I really wanted to make a trip to MoMA, but alas, it wasn’t open late enough for me to make it after class. 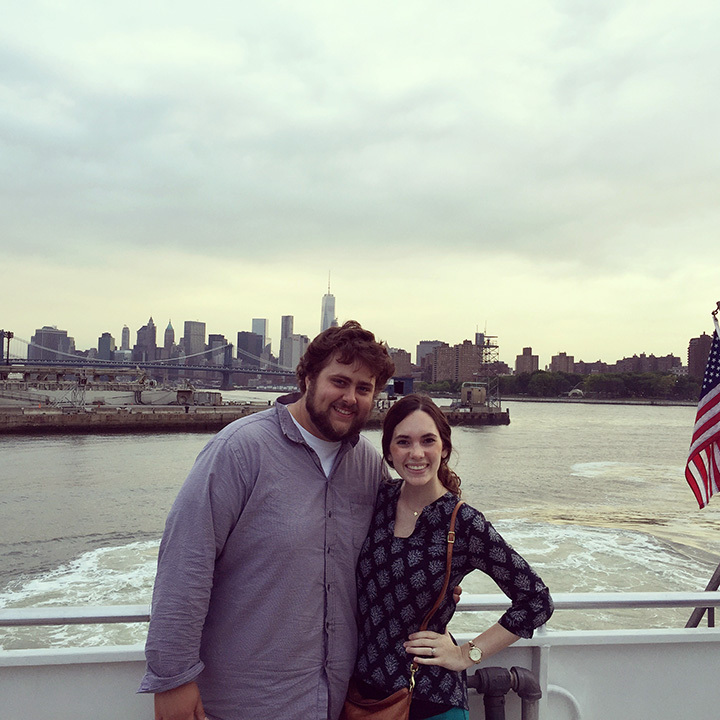 It was Drew’s first time in NYC and he explored craft beer/coffee/food places during the day while I was in class. 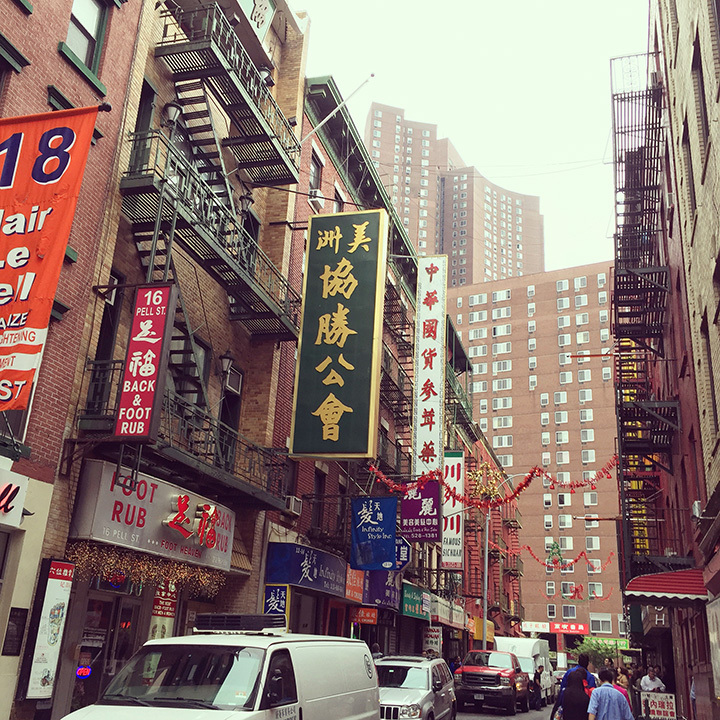 Chinatown, the East River Ferry (we stayed in the Williamsburg area of Brooklyn), Flatiron Building, Times Square, The High Line (so awesome! 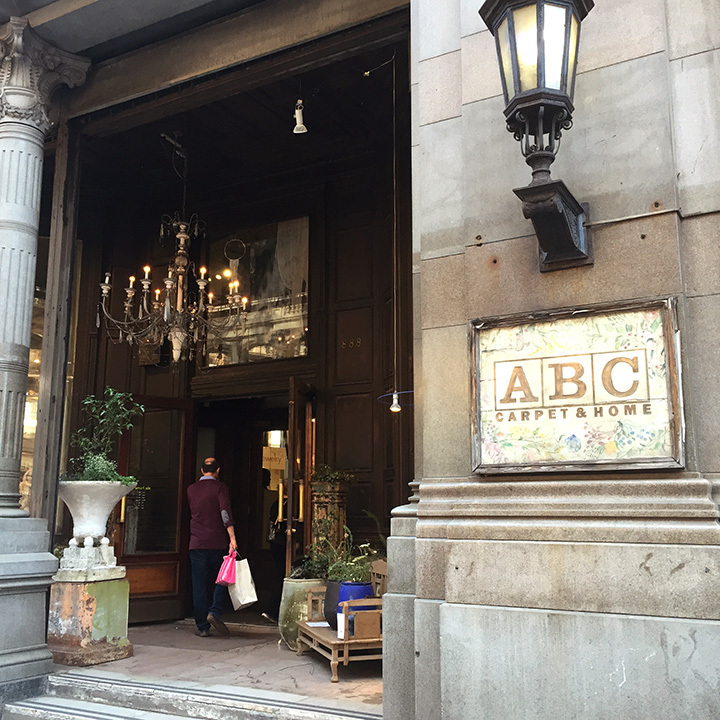 ), Chelsea Flea, ABC Carpet and Home (so amazing! 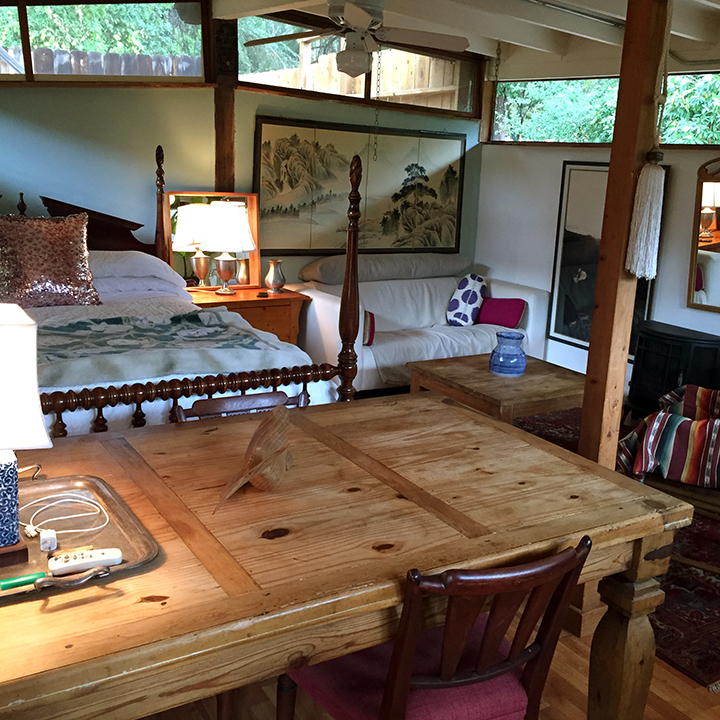 floors and floors of amazing furniture, bedding, awesome rugs, etc…). I’ve had a great time every time I’ve visited NYC, but this time I really fell in love with New York! 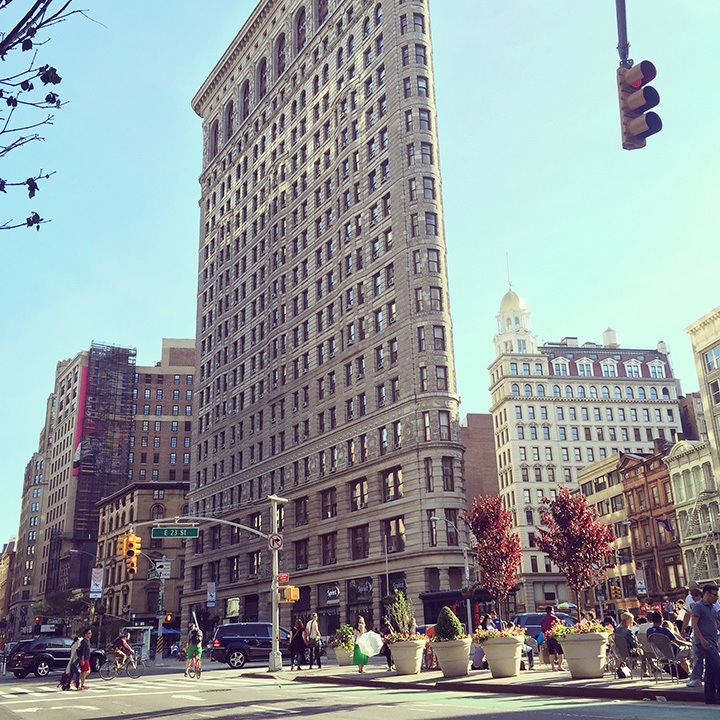 The weather was amazing, I mastered riding the subway, and I came to appreciate the determined energy about the city and the fact that so much is all at your fingertips. It was a really awesome trip. I’m so glad Heather and Anna Maria put this class together and I’m so grateful for them opening up their careers to give us advice and insight. I came to New York with a mini portfolio of designs and I left with a different perspective and new direction and ideas for my work. This class made me grateful for my art degree and left me wanting to draw/paint/sketch/block print and in general put a little more art into my design work. 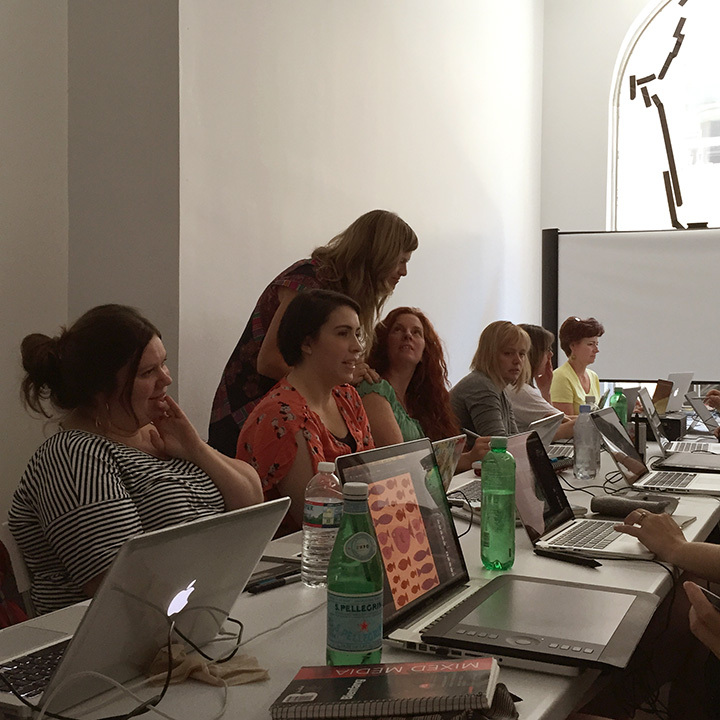 Interested in taking a similar workshop? 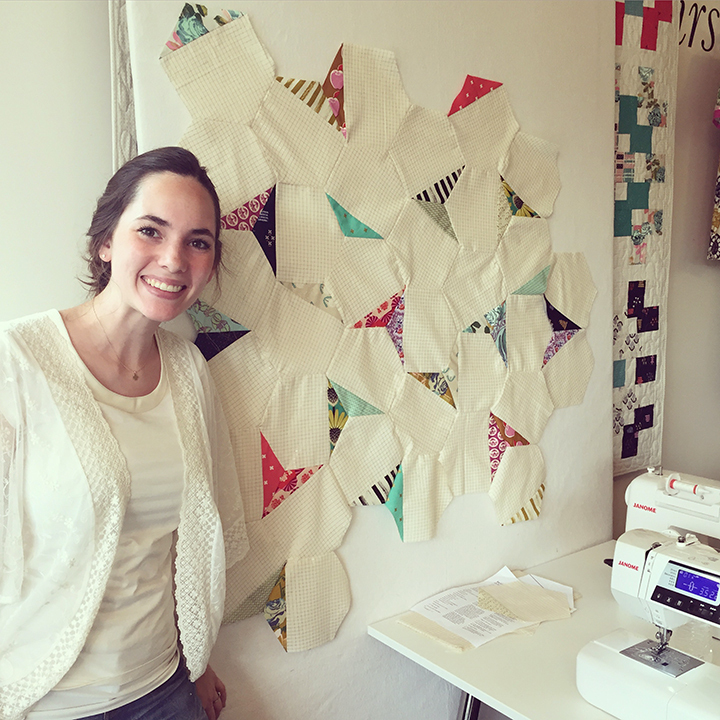 Heather is hosting another Fabric Design workshop this fall! Details can be found on the workshops page of her website, here. 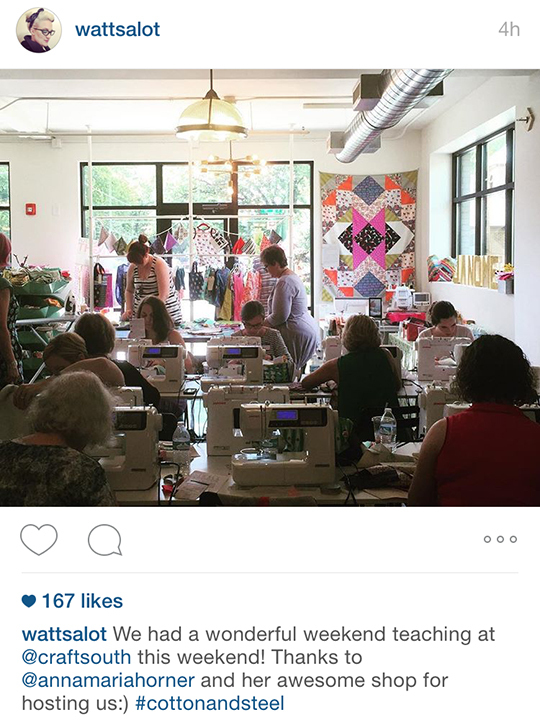 Anna Maria also hosts different workshops at her shop, Craft South, in Nashville. Find more info on her workshops and classes, here. MAKING patterns!! My journey in surface pattern design has progressed by leaps and bounds the past few weeks! I’ve almost finished up my first collection of designs! So exciting! COOKING the first blackberry pie of the season, GF Buttermilk Biscuits and Sausage Gravy for National Buttermilk Biscuit Day (May 14), lots of yummy Beef and Rice Salad Bowls, my Mamaw’s sweet tea, and her fried round steak and mashed potatoes and gravy. DRINKING sweet tea! Just like my Mamaw used to make it. We also made mint juleps during the KY Derby/Jazz Fest in the mint julep cups I got Drew for Christmas. A little secret though, mine is just ice water with mint. Bourbon isn’t gluten-free. READING Heather Ross’s book How to Catch a Frog. WANTING to finish my first surface pattern design collection and make more! PLAYING Kacey Musgraves. Loved seeing her at Jazz Fest this month!! Also loved seeing John Boutte and the music at Front Porch Fest. Can’t believe it look me 6 years of living in New Orleans to finally make it to Jazz Fest. It was awesome! SEWING MY DIY WEST ELM CLOTH NAPKIN PILLOWS!! FINALLY!! If you remember, I had been talking about wanting to sew them in my Life Right Now posts for months. So glad this is finally done and they look awesome! WISHING I could re-live just one day with my grandparents. They were such incredible people and I miss them so much. I enjoyed spending Memorial Day weekend running around their house, scanning in old photos, re-living memories, and playing with Fergus, my sister’s goat. ENJOYING dinner on the river with my dad, husband, and older sister and her husband and kids (me and Jackson). Catfish, family, BYOB (wine in our case), pretty views, and a nice (slightly fishy) breeze off the water. WAITING for our next adventure. We have several exciting ones coming up! I can’t wait! LIKING this Saturday at the beach for my birthday. Photos here, here, and here. WONDERING why it took me so long to simplify my office area. It is so much nicer to work here without the visual overload it was before. LOVING this pattern with my handwriting and seeing my designs on actual fabric! HOPING to get to work on some DIY projects around the house this summer. More walls need to be painted and I have a project to do with my tree stump cake stand from our wedding, now that my best friend, Tonya’s, brother, Tyler, helped me cut it down while I was at home a few weekends ago. MARVELING at the beauty and the peacefulness in my favorite place in the whole world. 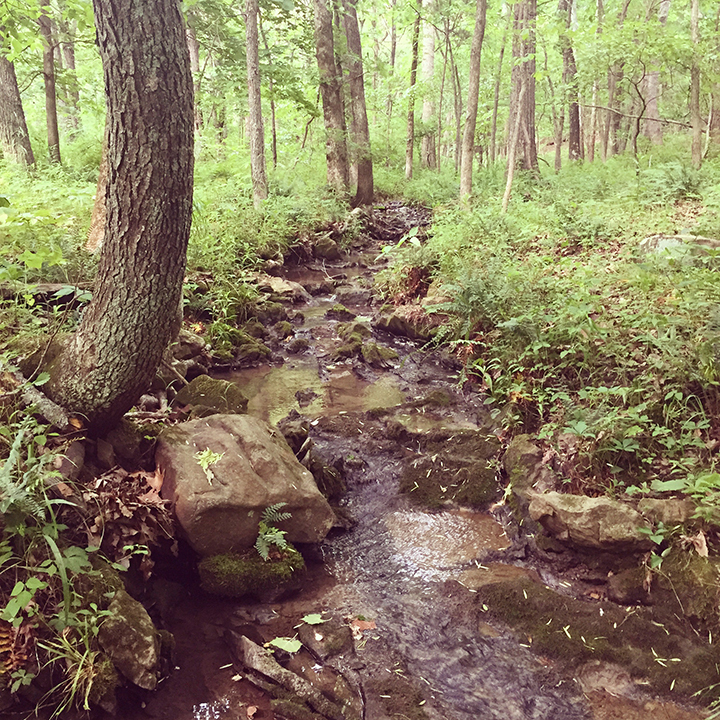 I spent so much of my childhood running through that creek in the backyard of my childhood home (photo below). It was so nice to take a walk back there with my dad when I was at home. Boy, how I miss the country. LEARNING new bits of design knowledge every day. 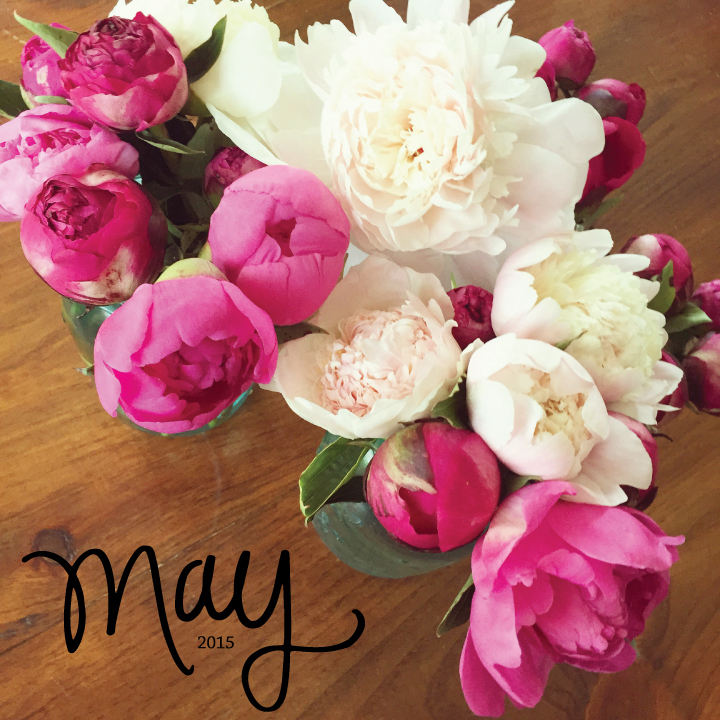 SMELLING peonies, peonies, peonies, and more peonies. FOLLOWING along on my progress from painting to pattern with these India ink sketches, here, here, and vectorized here. I’m loving how the final pattern came out and that I was finally able to combine my painting into my pattern work. This was the first time I’d sketched in India ink in 3-4 years! NOTICING the beauty of Southern Illinois (me and my sister, Kelsey, in my dad’s friend’s vineyard). KNOWING how much I wish there was a Dairy Queen closer to Uptown New Orleans. I think I ate DQ at least once a day when back home. Mini Turtle Pecan Cluster Blizzard with Cheesecake pieces for the win. THINKING about summer travels, decorating plans, and future career plans. BOOKMARKING this kitchen renovation and this breakfast nook. CELEBRATING my birthday, my niece’s 10th birthday, and my friend Jessica’s college graduation. Lots of celebrating this month! OPENING birthday presents! I didn’t really open it, but I bought a church pew for our dining room this month! I’ve been looking for one for years and my sister found one for me in Nashville. My dad is overseeing its renovation and I can’t wait to get it to New Orleans and into my dining room! LAUGHING at life? I don’t remember any particular funny moments this month. But it was a great month with lots of fun times. FEELING grateful for this life I live. 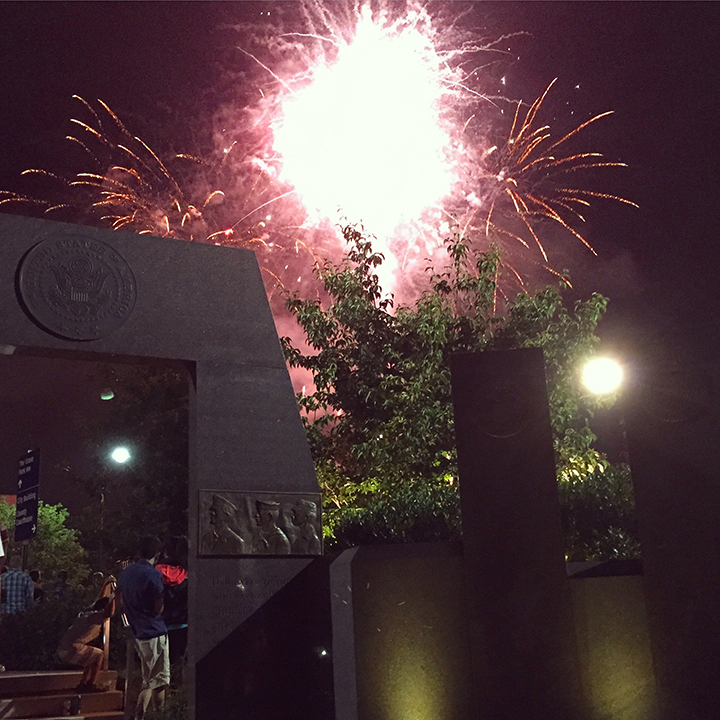 For family, for the country, for artistic talents, and Adobe design software. MAKING ceramics! Finished up all the pieces from my ceramics class this month. So happy with how they turned out! COOKING tortilla soup, gf strawberry fruit tart, gf strawberry muffins, grits and grillades, avocado toast, avocado salsa, mojo pork, black beans, lots of rice. DRINKING green tea with lemon and honey in a mug I made myself. WANTING to simplify everything in my life. I’ve been on a mission the last few months. The stuff in my house, closet, work routine, the blogs I read, the ways I spend my time – everything. PLAYING records on our new record player! Drew has been wanting one for years and we finally bought one! WISHING I hadn’t developed a head cold on our vacation that stuck around for weeks. But this kitty snuggle while I was sick melted my heart. ENJOYING our wonderful road trip across California. WAITING for our next adventure. LIKING the idea of finally working on some design work in our bedroom! WONDERING what it is that Drew likes about working in the beer industry. LOVING flowy, summer work tops. And this haiku from my friend Emma at the close of our sharing an office. HOPING to figure out a good, natural hair routine. I tried Dr. Bronner’s soap and conditioning rinse for several weeks, but just couldn’t deal with how nasty my hair felt while using it. Any recommendations on a good natural shampoo and conditioner? MARVELING at the beauty and diversity of our country. 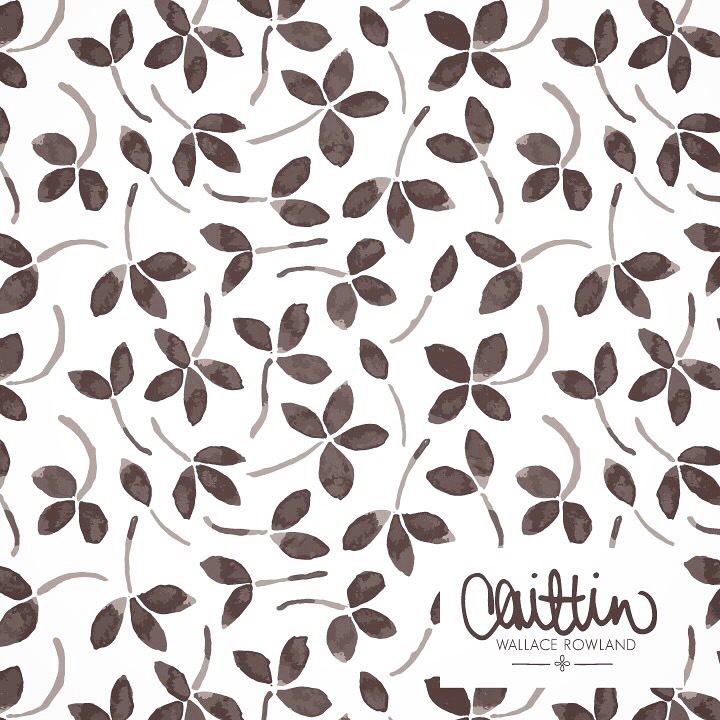 NEEDING to get back to work on my surface pattern design portfolio. Lots of ideas and inspiration this month. LEARNING all about Hashimoto’s thyroiditis or Hashimoto’s disease. My endocrinologist confirmed that my hypothyroidism and gluten intolerance were caused my this autoimmune disease of the thyroid. SMELLING the sweet, sweet smell of sweet jasmine (photo at top). WEARING the usual! Loving my cleaned out closet from last month! I think there might still be some more cleaning out to do though! FOLLOWING (or rather stalking) Craigslist searching for the perfect nightstands and a mid-century modern long dresser for our foyer. I’ve also searched all over online and in a bunch of stores in New Orleans for nightstands. Why are good nightstands so hard to find!? 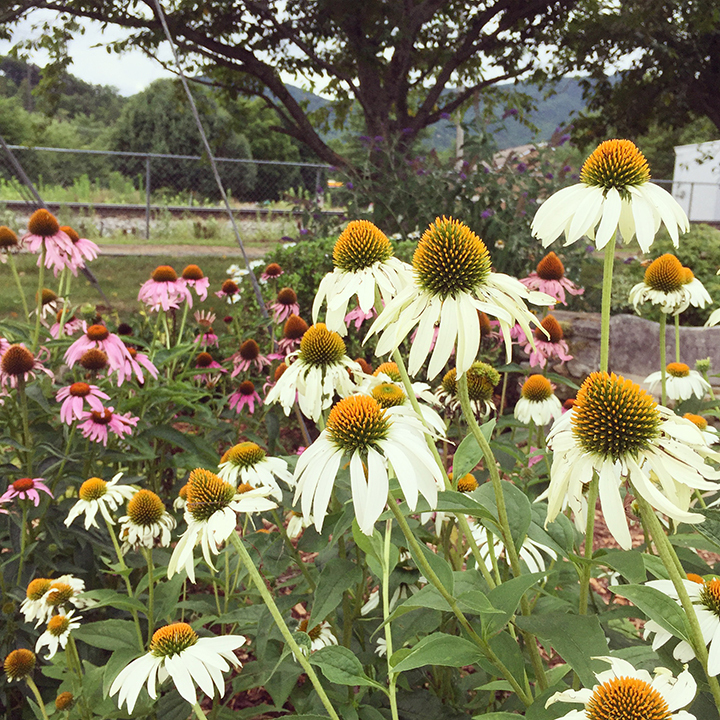 NOTICING lots of nature this month in our travels. How I miss hills, waterfalls, hiking, and so many other things while living in Louisiana. KNOWING that life is good. THINKING about plans for the future and how far Drew and I have come since we met. BOOKMARKING paint colors and possible desk configurations in preparation for the office renovation happening this summer at work! CELEBRATING the beautiful weather, even the plethora of rainy days we’ve had lately. It will be way too hot here before long. Enjoying these beautiful days with walks outside, Plum Street Snoballs, and eating outside at restaurants. OPENING new a new duvet cover and king shams for our bed from West Elm. I’ve had my eye on these ones for years! LAUGHING at our sweet and funny little kitty. Missed her so much while on vacation! FEELING grateful for this life I live. Drew and I just got back from an amazing vacation! 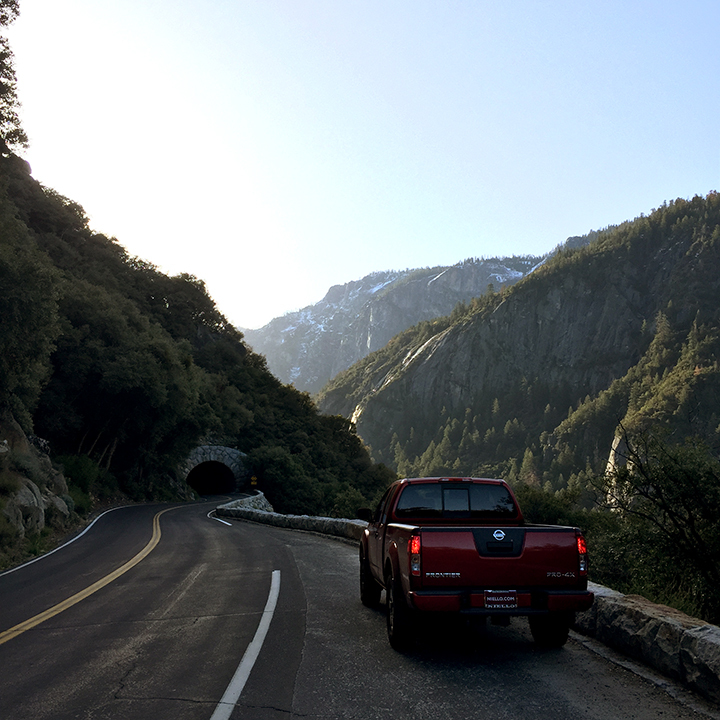 We spent just over 8 days taking a road trip across California! 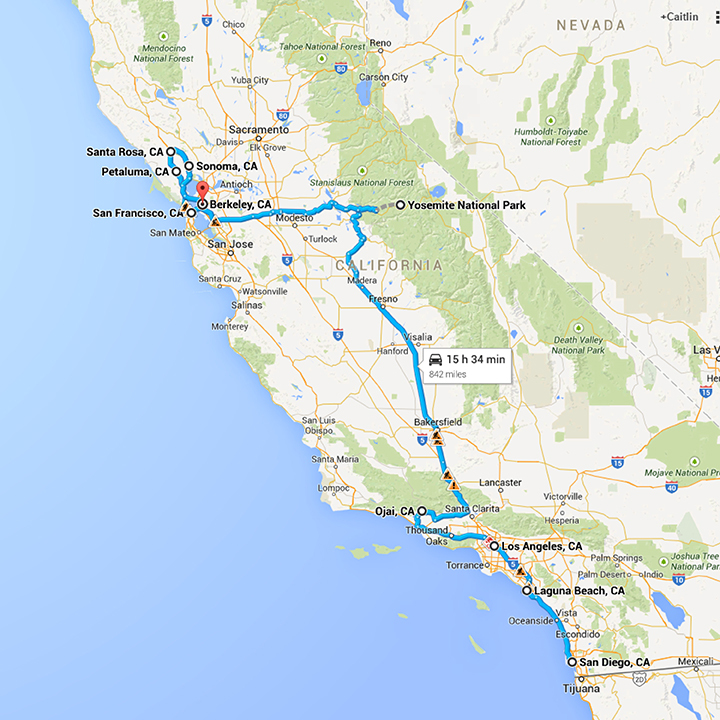 Friday, April 3 – Fly from New Orleans to San Diego, California. 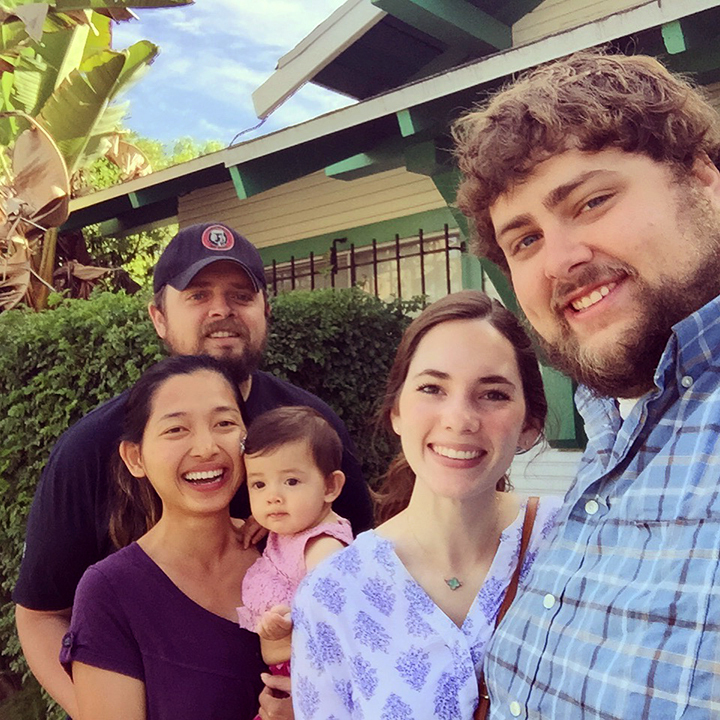 We got there around 6 p.m. and Drew’s brother, Wes, his wife, Trang, and their 8-month old baby girl, Aili, picked us up from the airport. We ate dinner at home with them and stayed with them in La Mesa, California. 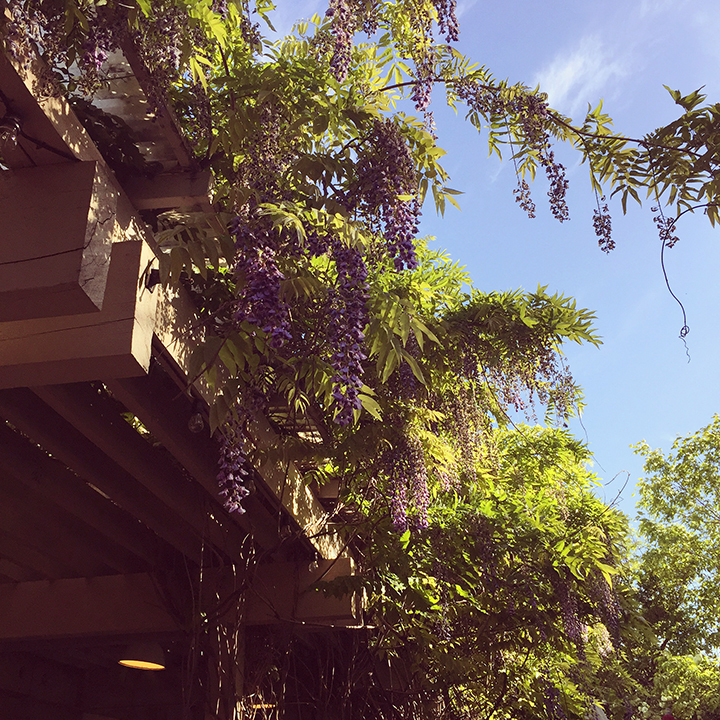 Saturday, April 4 – We all had a lovely breakfast together, then Drew went to work with Wes at Societe Brewing, stopping along at a coffee shop along the way. Trang, Aili, and I got ready and went to North Park to walk around in some cute shops (loved Pigment). Later on, we picked up Drew and had a nice lunch. 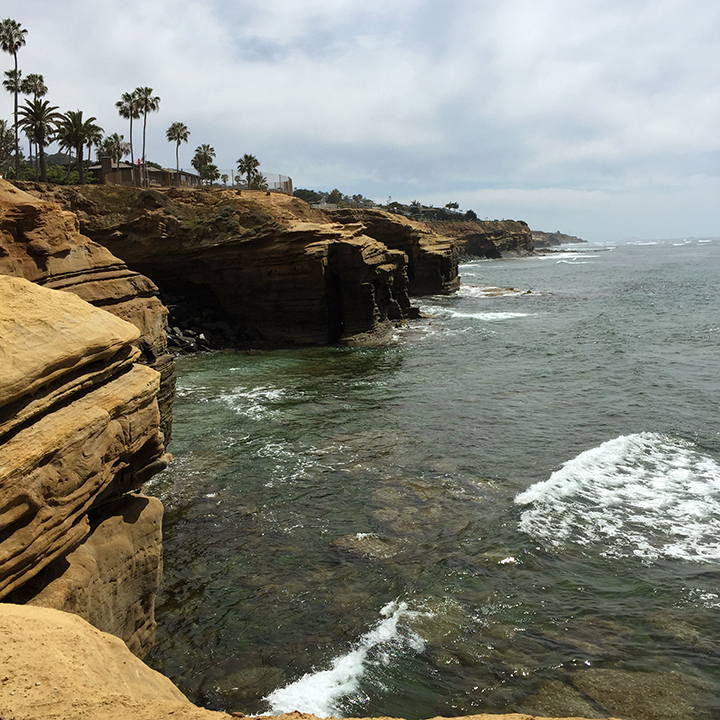 We had a nice afternoon walking around at Sunset Cliffs (one of my favorite spots in San Diego!) and then stopping by to eat some raw desserts at Peace Pies. 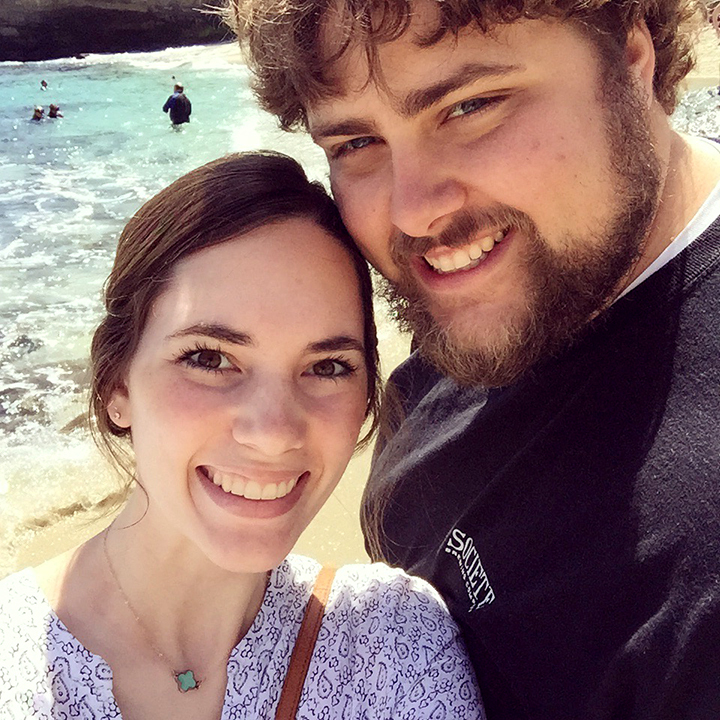 We headed back home, prepped dinner, Drew and I took a walk around La Mesa, we visited with Wes once he got home from work, and ate dinner. After dinner and more visiting, Aili went to bed, Trang and I had a great time chatting about fabric design and our business dreams and Wes and Drew went out to check out Fall Brewing, Counsel Brewing, Toronado Bar, Hamilton’s Tavern, and a burrito shop for him to get a California burrito (with french fries in it). 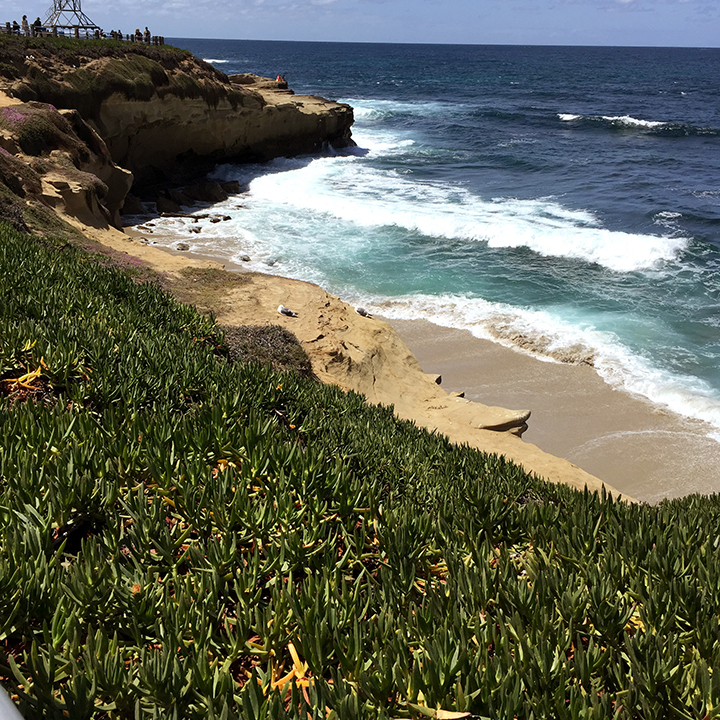 Sunday, April 5 – Drew and I took a nice morning walk around La Mesa while Aili took her morning nap. 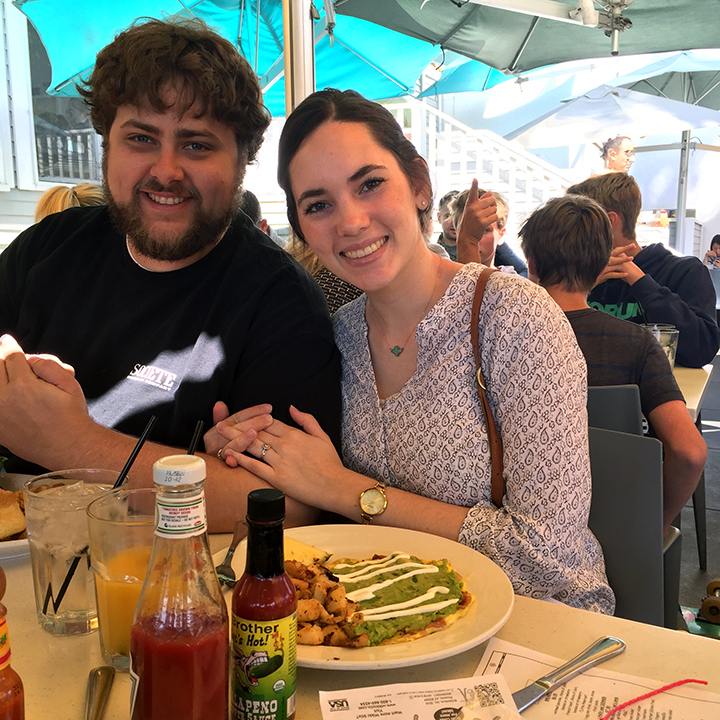 Then we got breakfast from a restaurant called The Mission and ate it at the Cabrillo National Monument, overlooking the ocean and San Diego. 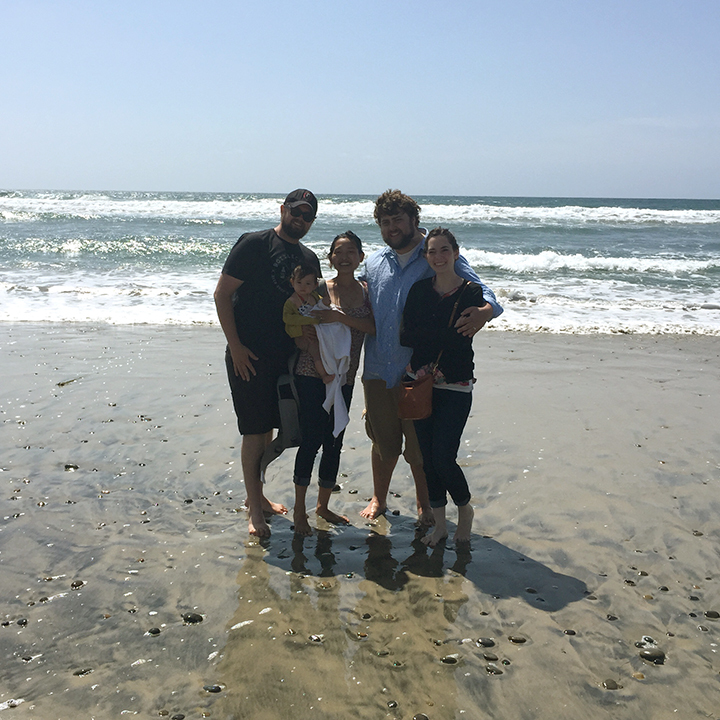 Then we visited Torrey Pines beach, Coronado Brewing, Ballast Point Brewing, AleSmith Brewing, and had dinner at a Vietnamese restaurant before heading back home. Drew and I were exhausted from travel and the time change, so we fell asleep at 6 pm! We woke up later to visit some more before going to bed again. 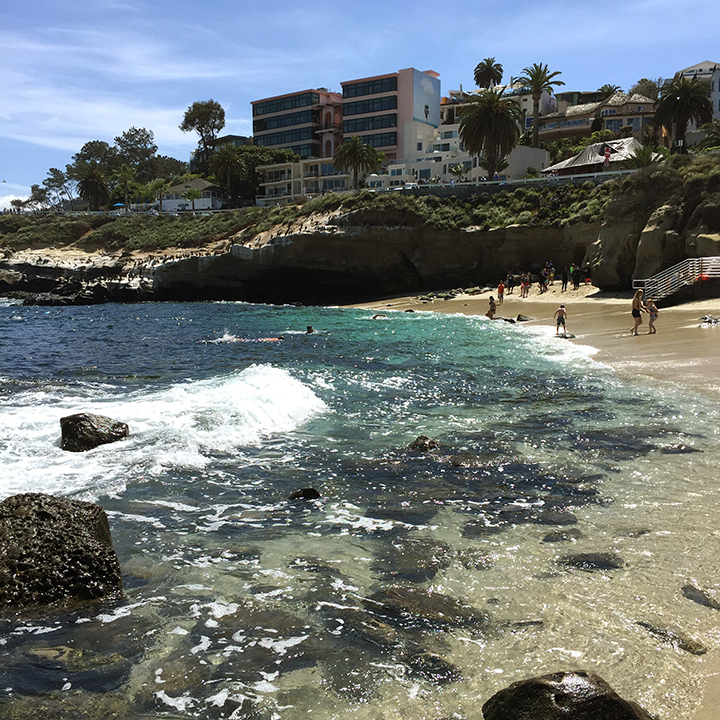 Monday, April 6 – We woke up and had brunch at The Cottage in La Jolla, then spent the morning hanging out at La Jolla Cove (another favorite spot in San Diego!). 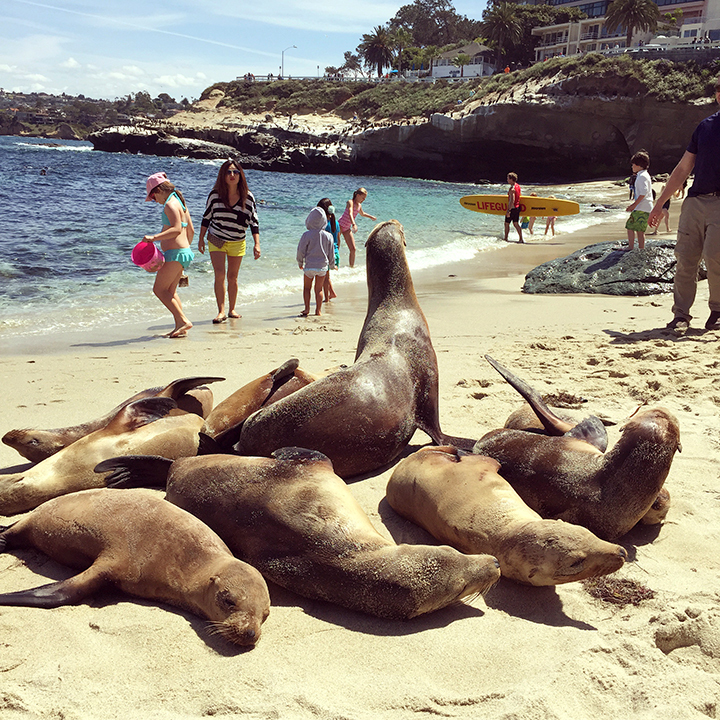 The weather was so nice, the water so beautiful, and there were some sea lions sunning right next to us on the beach! 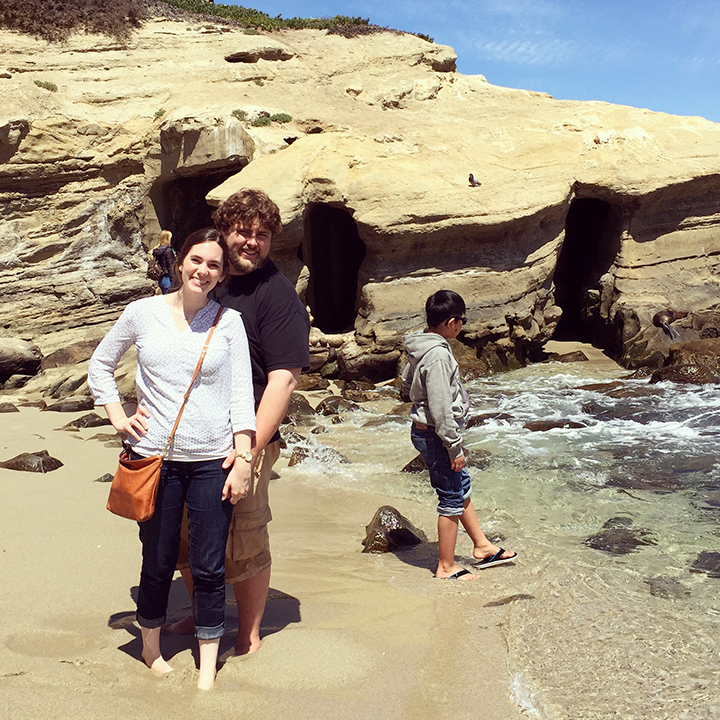 We walked around in some shops in La Jolla, had some awesome gelato, then left to drive around San Diego a bit more. 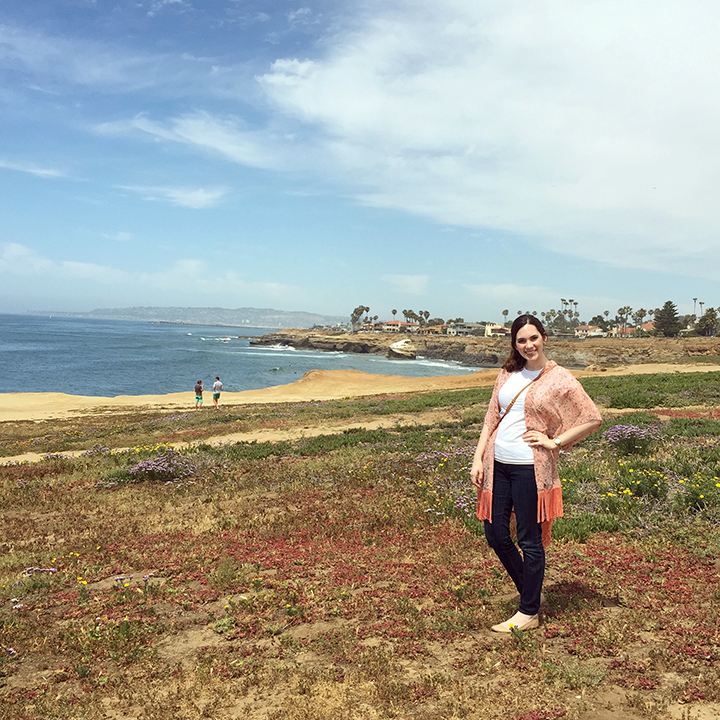 We drove up to Carlsbad, California to check out Pizza Port Brewing and walked around there and went to the beach. 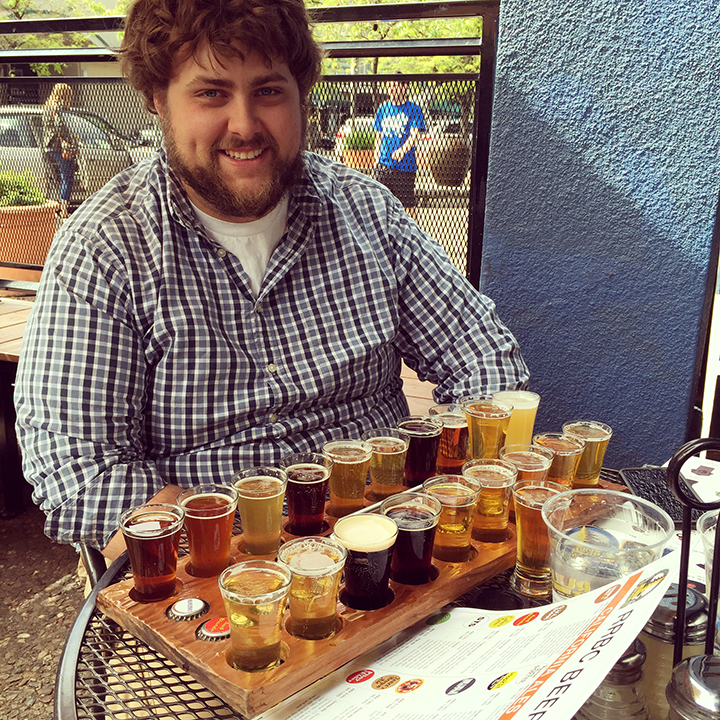 We also went to Lost Abbey Brewing (can you tell that Drew and Wes are into craft beer!?) and then had tacos for dinner. We spent the rest of our last evening in San Diego visiting with Wes, Trang, and Aili — Drew and Wes sharing some great beers together, as always. Tuesday, April 7 – We had breakfast together one last time, before packing up our stuff to head to get our rental car. On the way, we stopped by a gluten-free bakery in Santee, California (my great-grandpa used to live in Santee). 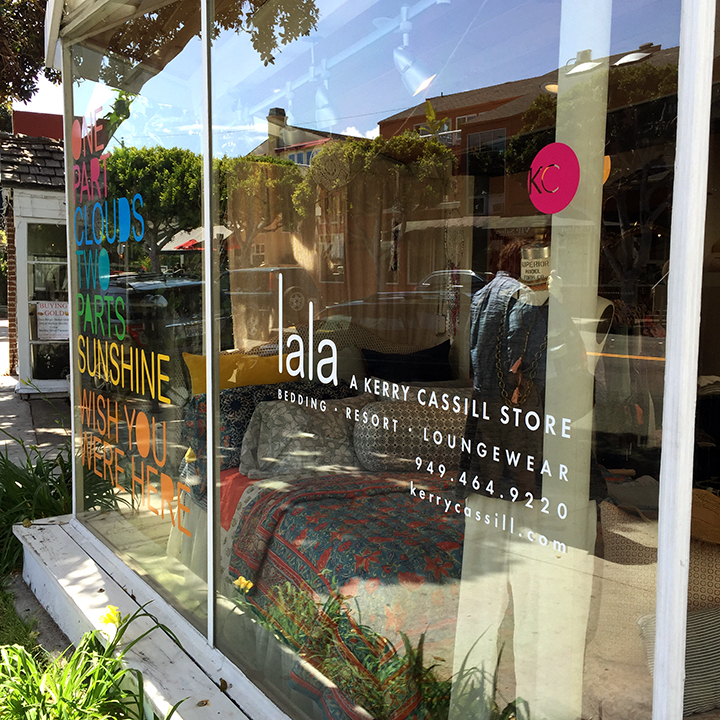 Drew and I headed up the coast, stopping in Laguna Beach, California to check out Kerry Cassill’s gorgeous block printed linens shop (beautiful area too!) and then we continued on, stopping to eat lunch at Joe’s Falafel in Los Angeles (probably a totally random place to go for our only stop in LA, but it was delicious!). We would have explored LA a bit more, but we had more ground to cover and we didn’t want to exhaust ourselves. We did see the Hollywood sign as we drove through. 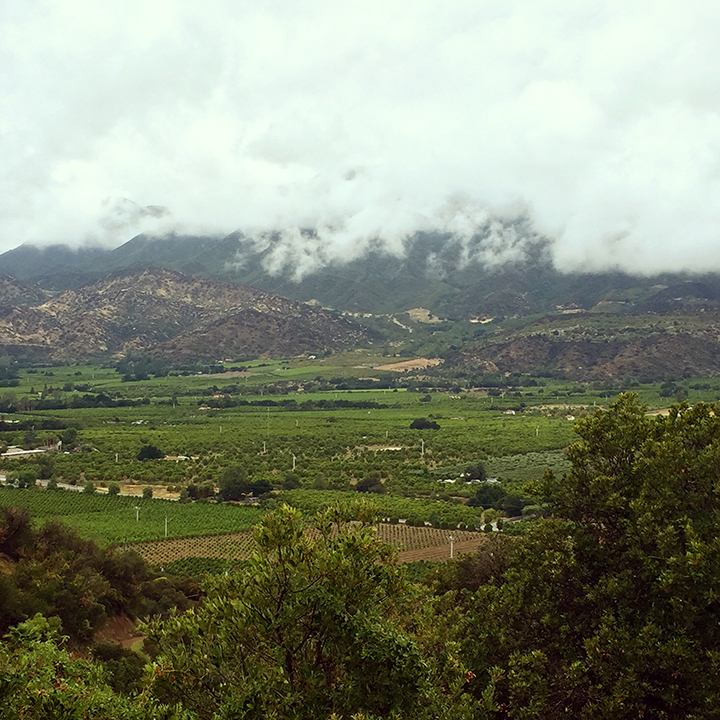 Then we headed up and into the mountains to the Ojai Valley. 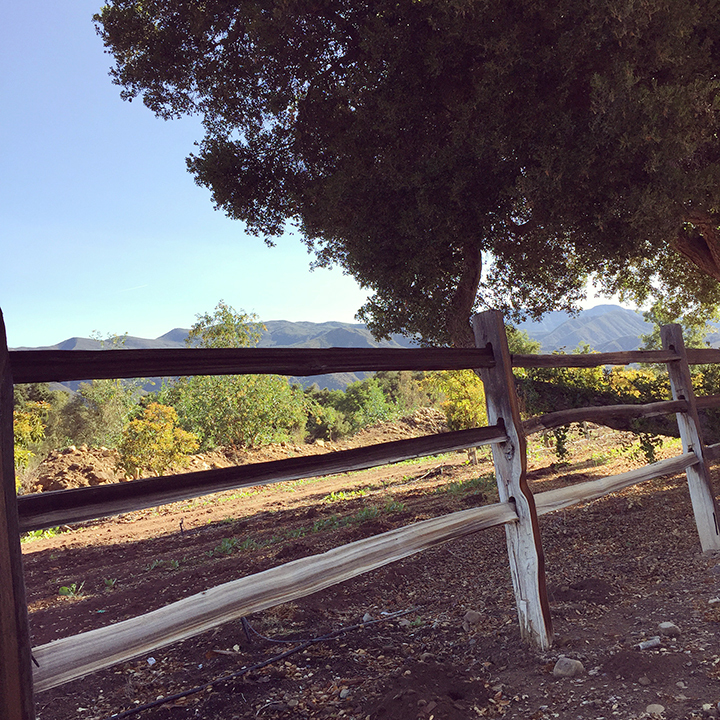 Gorgeous area with mountains and orange groves. We dropped our stuff off in the pretty little cabin we stayed in, then walked around for a bit, enjoying the scenery, visiting shops, and eating dinner in the little town. Wednesday, April 8 – We woke up, packed up our stuff, then headed into town for breakfast. 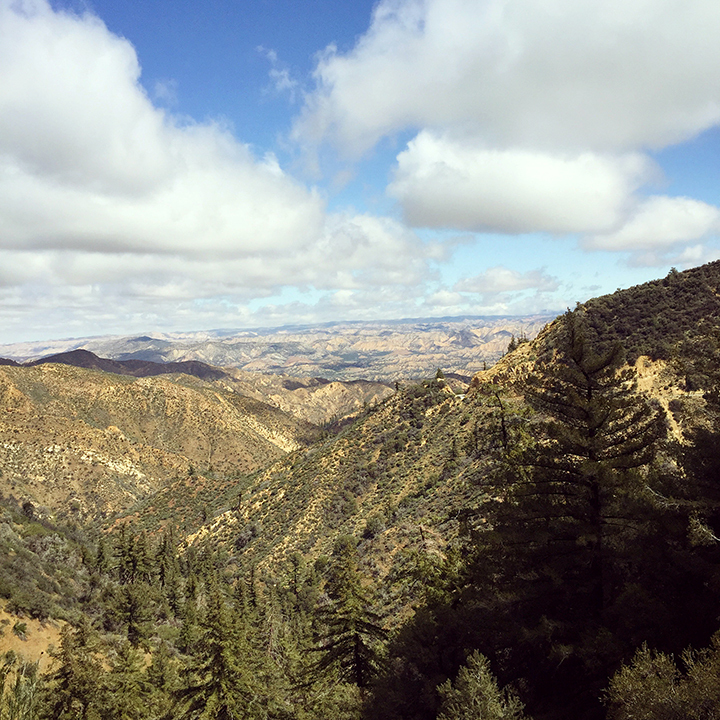 The drive from Ojai to Yosemite was gorgeous. We drove through the mountains, seeing green hilly mountains, sharp stone ones, and dusty desert hills. 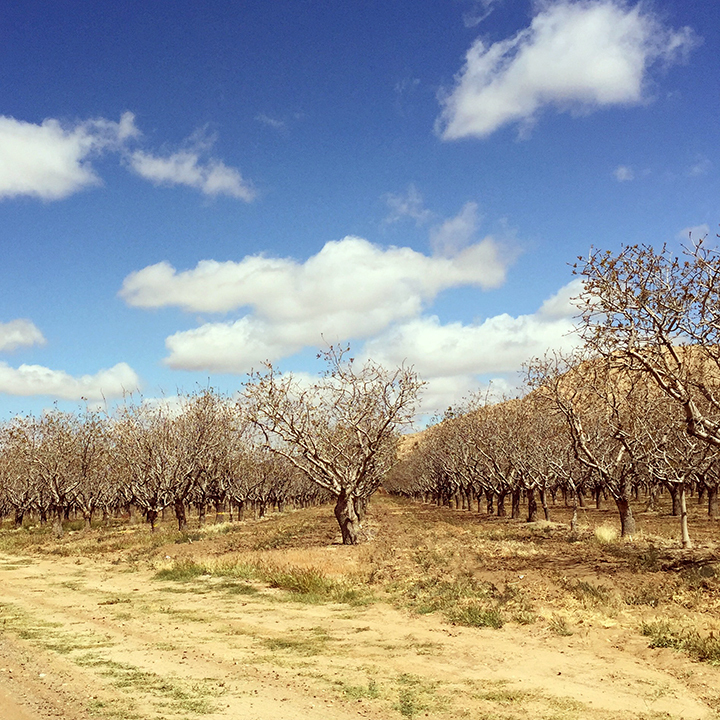 We drove through the Santa Barbara pistachio farms, stopping to get a bag of pistachios to snack on from the Santa Barbara Pistachio Company. 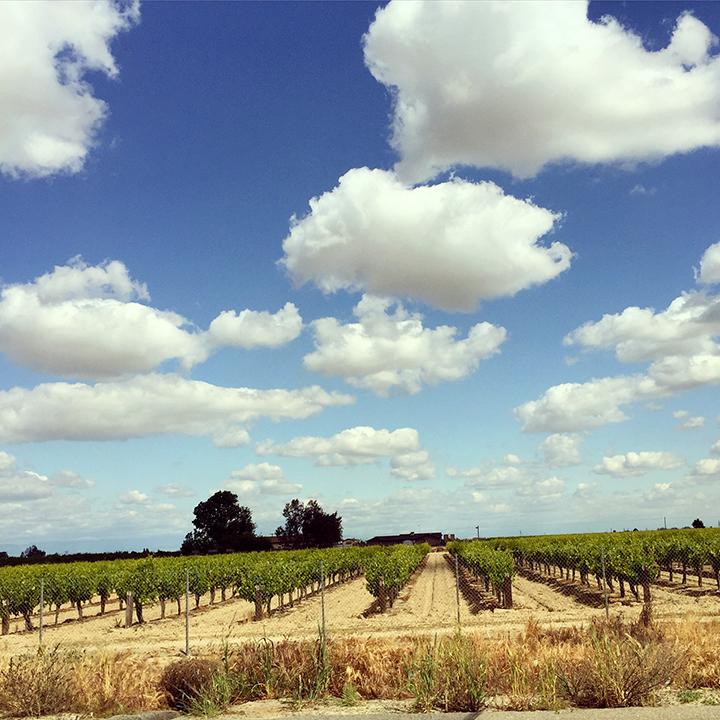 We also passed the Sunmaid Raisins vineyards. Then continued on, stopping in Fresno for food/groceries for our stay in Yosemite. 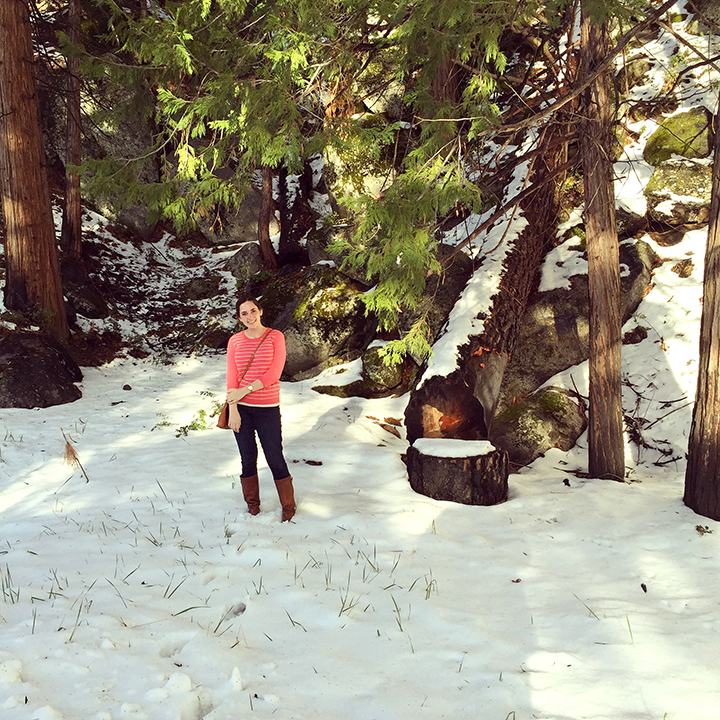 We continued our drive into Yosemite where there was snow on the ground!! I had thought that we were going to drive though the Mariposa Grove on our way into Yosemite to see the giant sequoia trees, but I guess you had to go off the main road to see those (and I think the road might have been closed to there because of the snow). I’m a little bummed we didn’t get to see those, but I guess there is always next time! 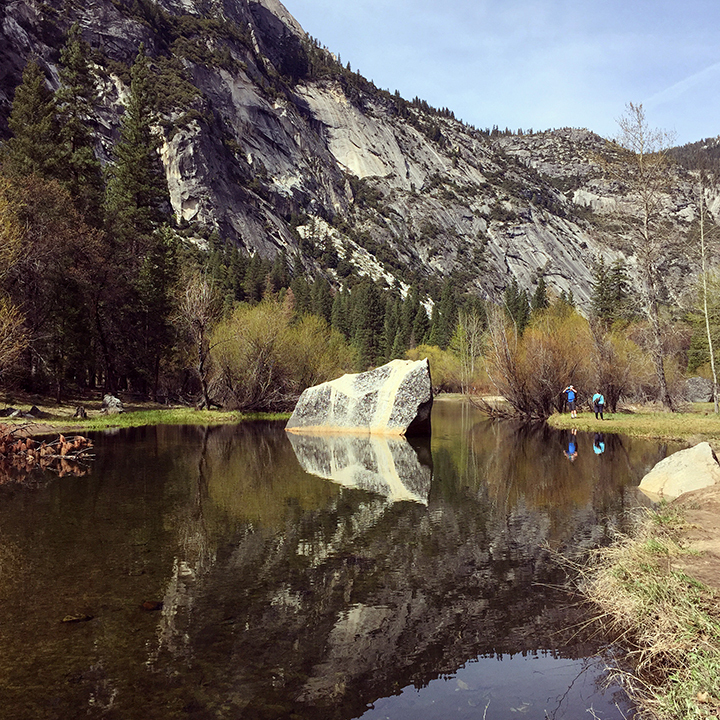 Thursday, April 9 – We woke up, ate breakfast in our room, then bundled up and headed to the Yosemite Valley Floor to start hiking and exploring. 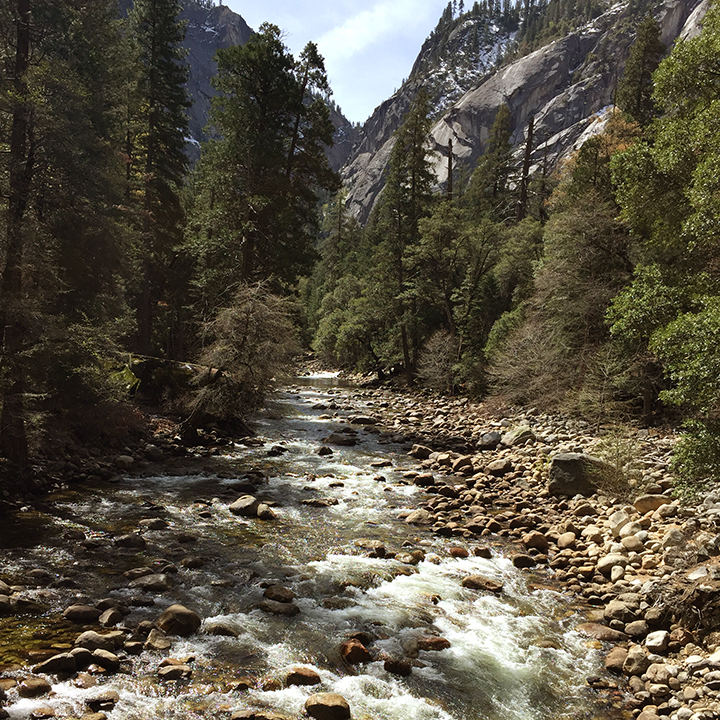 We visited the Yosemite Visitor’s Center, then hiked part of the Mist Trail to Vernal Falls (it was steep and slippery, so we didn’t hike it all). 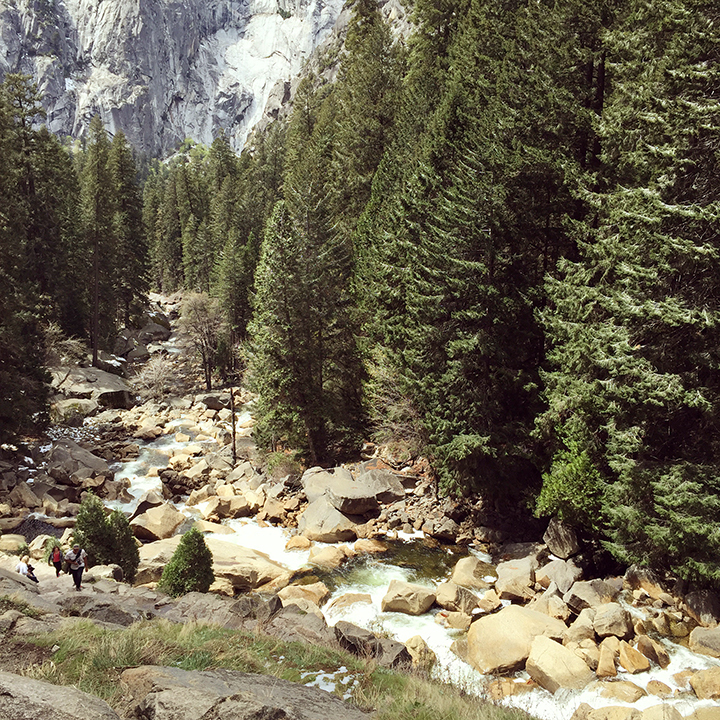 We packed snacks and our lunch, so we stopped on a rock along the trail to eat lunch while admiring the scenery. 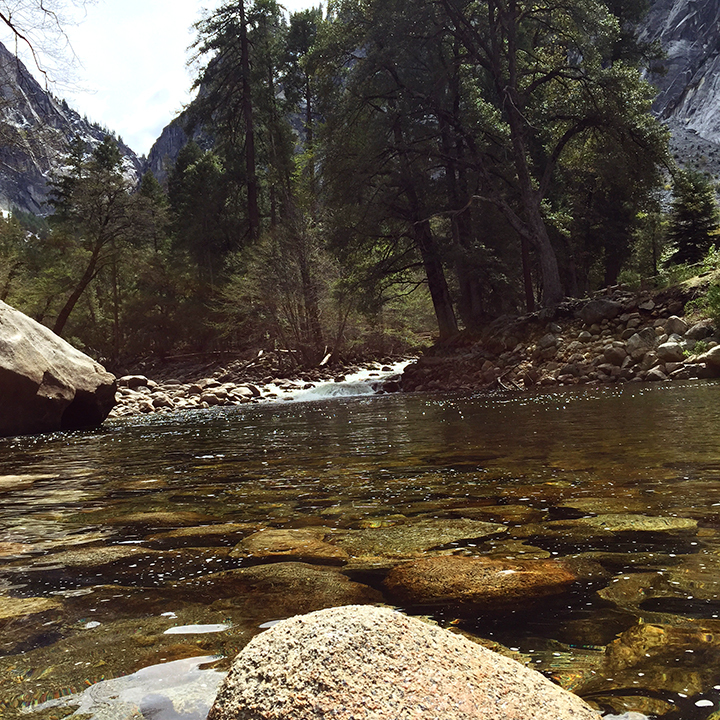 After that we relaxed for a few minutes by the river, then headed over to hike to Mirror Lake. That hike was much easier and less steep, but Mirror Lake was less impressive than I had imagined. We stopped back by the Vistor’s Center to see the Gift Shop and Yosemite Museum Exhibit before heading back to our car and then back to our room. It was an exhausting day of walking! We made dinner in our room and spent the rest of the evening relaxing and watching HGTV. Friday, April 10 – Drew and I both developed head colds when we started heading into the mountains on Wednesday, so by this point, neither of us were sleeping very well. I guess this day it came to our benefit, because by 6 a.m. I was wide awake and tired of laying in bed and not being able to sleep, so we got up super early (for us!) and packed up our stuff and headed out to make our way to San Francisco. It worked out well that we left early because we made it to San Francisco by lunchtime. We stopped downtown for lunch, walked around in some shops, and Drew checked out a bar with some local craft beers on tap. After that, we headed to the Ferry Marketplace to check out a gluten-free bakery and walk around the pier a bit. Then we drove down past the piers to get a good view of the Golden Gate Bridge before heading to check into our room. I took a brief nap, as my head didn’t feel good and I was exhausted from lack of sleep. 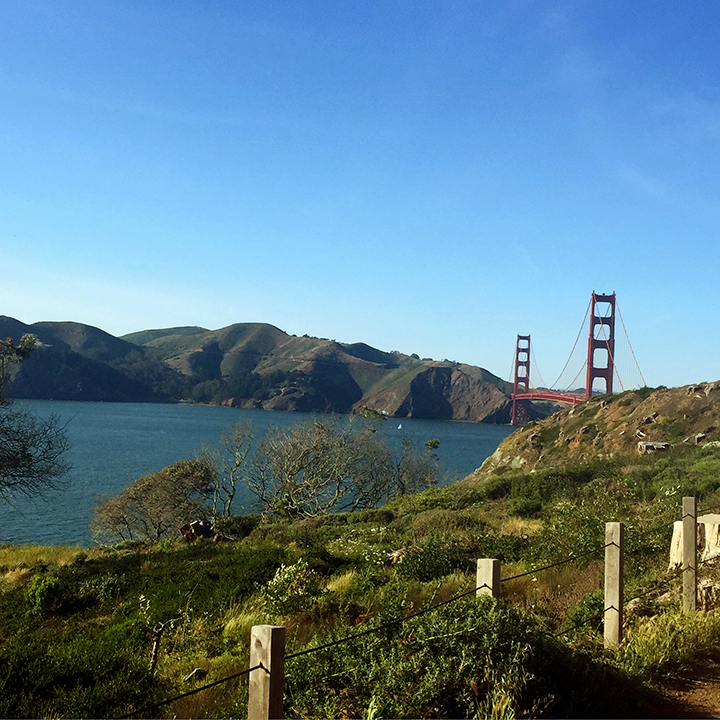 Once I got up, I drank some tea, then we drove through Golden Gate Park, up to a beautiful look-out over the Golden Gate Bridge, then past the Painted Ladies, and on to a little seafood place for dinner. 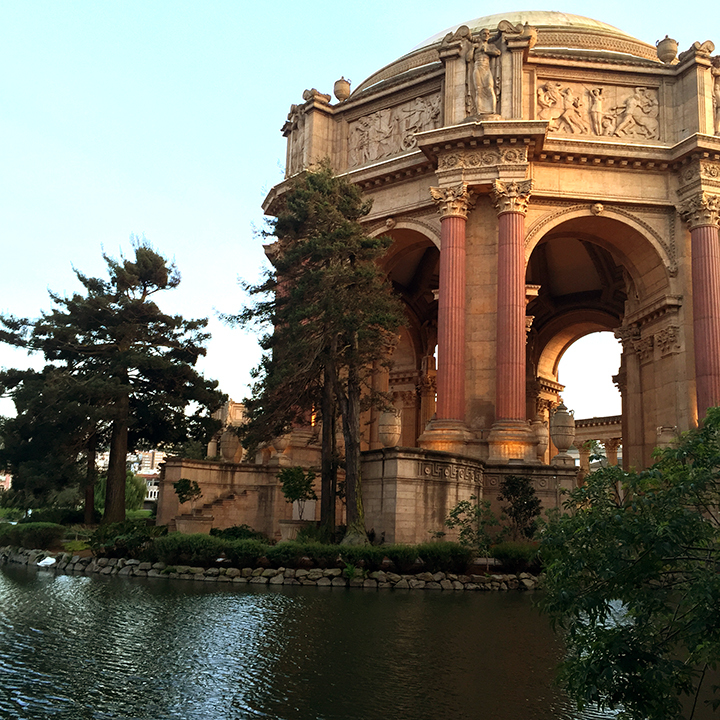 After dinner was ice cream and then a stop at the Palace of Fine Arts and then a drive through Chinatown. 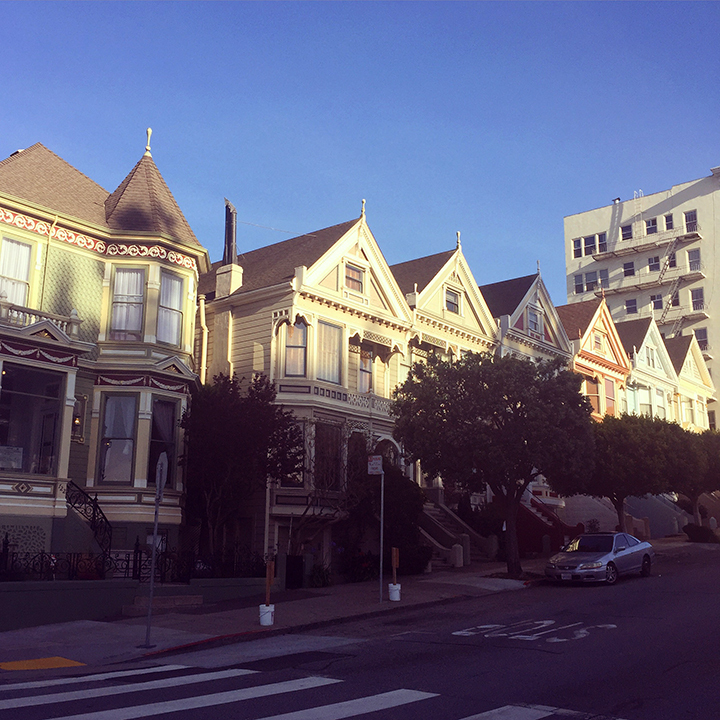 Saturday, April 11 – We got up and had breakfast at Radish in the Mission District. I had the gluten-free pancakes with freshly-squeezed orange juice and Drew had the biscuits and gravy with hashbrowns. Both were great! 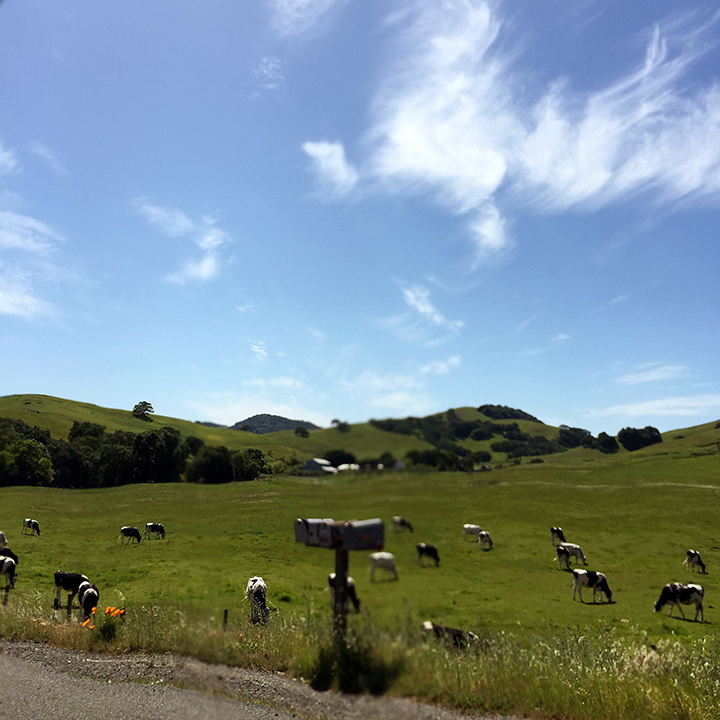 After breakfast, we headed North of San Francisco to Santa Rosa, California to go to Russian River Brewing, then Petaluma, California to check out Lagunitas Brewing. 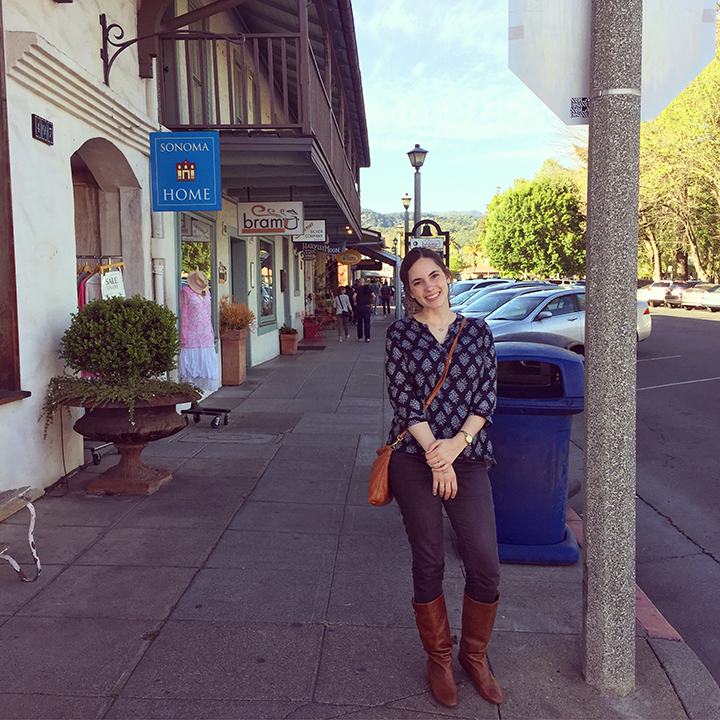 We then drove around through Napa and Sonoma, admiring the gorgeous lush hills and vineyards, eating dinner at The Red Grape in Sonoma, California. 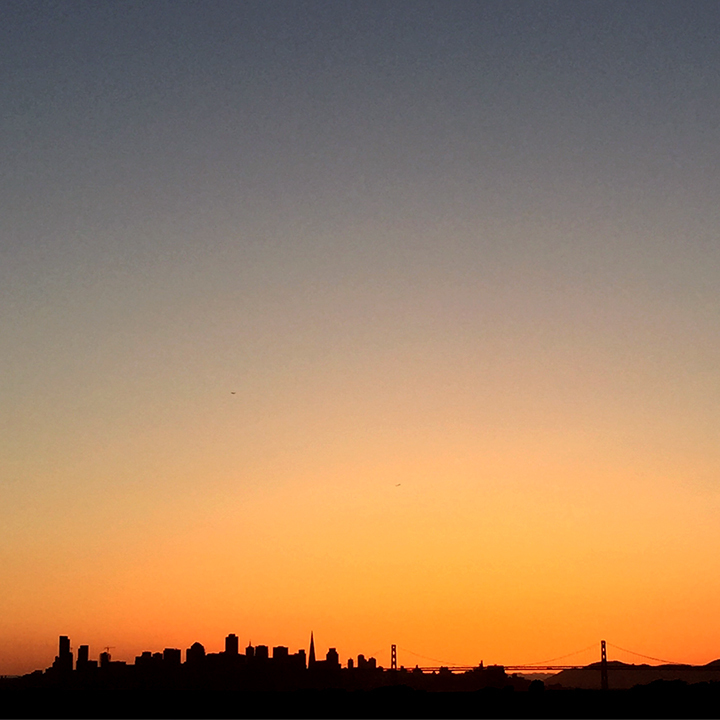 After that, we headed back towards San Francisco to the Berkeley/Oakland area to check out Faction Brewing (amazing sunset views of SF), head to IKEA, visit Rare Barrel Brewing, and lastly to Target to get cold medicine! Sunday, April 12 – Our flight back to New Orleans left at 6:15 a.m., so we had to get up at 3:00 a.m. to have time to put gas in the rental car, drop it off, get through the airport, etc. So that wasn’t fun! But we made it to our flights on time and got back into New Orleans around 3:00 p.m. (we had a stop over in Dallas). Let me tell you, flying with a head cold is no fun! I woke up that morning with a raw throat and no voice and the change in elevation/altitude hurt my ears so bad! It wasn’t until Monday that they finally popped and started feeling better (although not 100% for a few more days!). I could barely hear all day Sunday! But we were so happy to see our kitty again! Overall this was such an amazing trip! 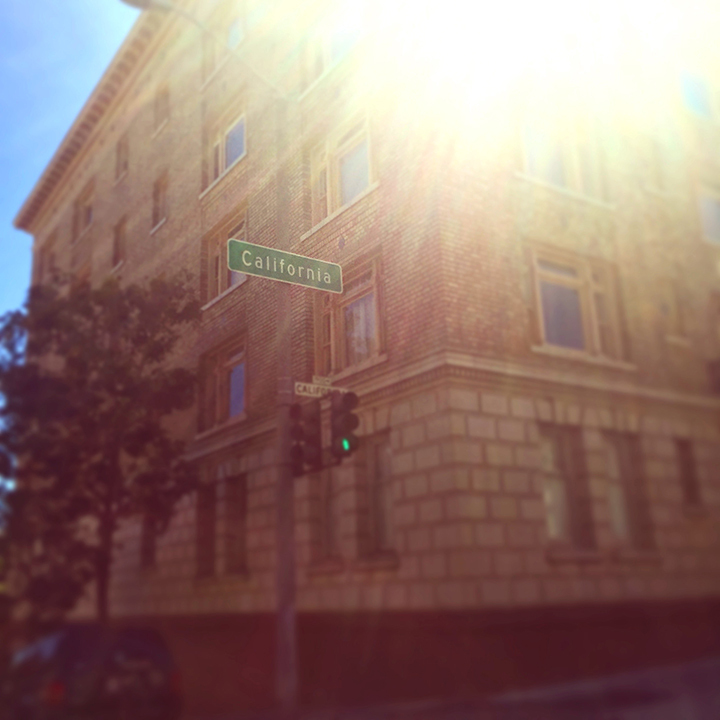 California is just so beautiful! 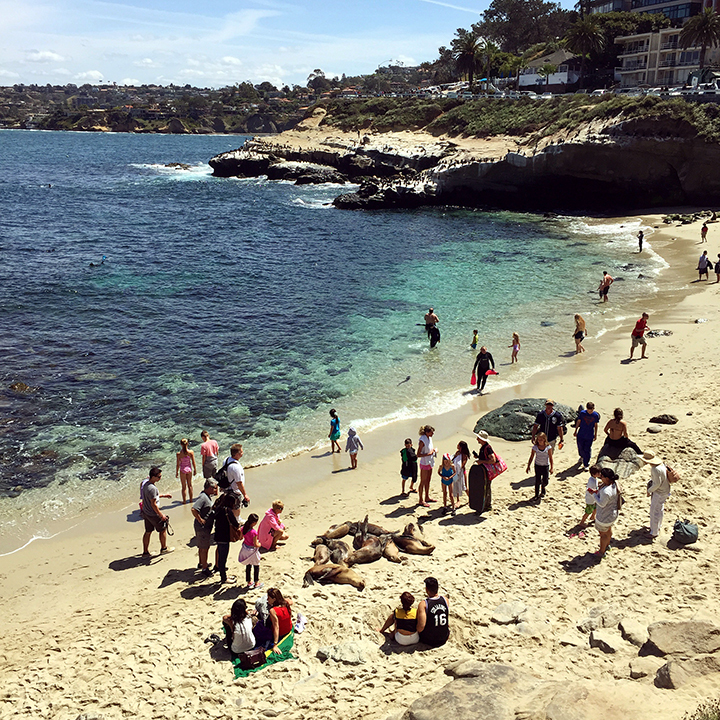 We saw cities, small towns, beaches, mountains, valleys, deserts, rivers, streams, lakes, waterfalls, hills, orchards, nut groves, vineyards, bays, sunrises, sunsets, and so much in between all in the same week! 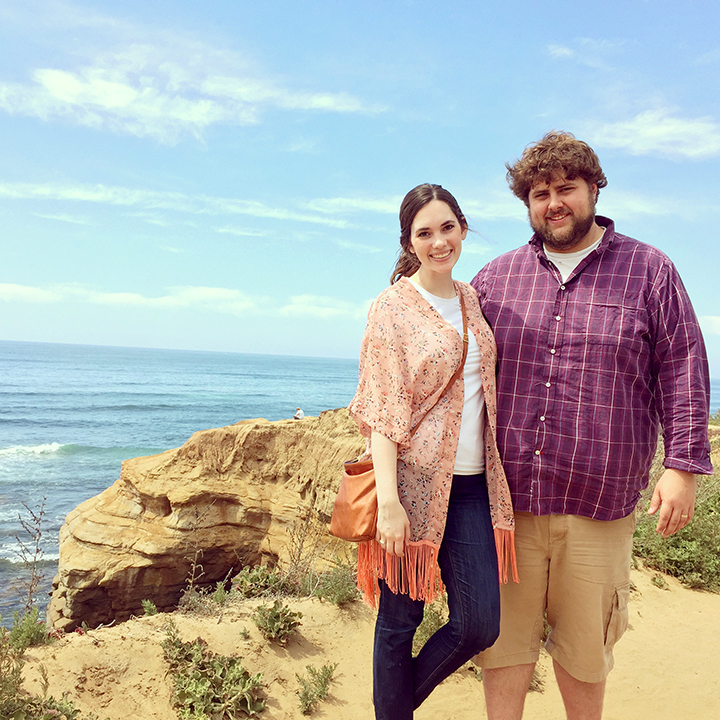 Drew and I had been to both San Diego and San Francisco before (we got engaged in San Diego almost 5 years ago!) and flying is so convenient, but you just can’t see the same things you do when you drive across a state. Such a different experience! And really, for us, 16+ hours of driving across a week is no biggie. We are used to driving 20 hours (10 there, 10 back) from New Orleans to our hometown in Southern Illinois over long weekends, so this trip, with such beautiful things to see and the driving spread out over several days, was super enjoyable! Last weekend, a dream of mine came true. 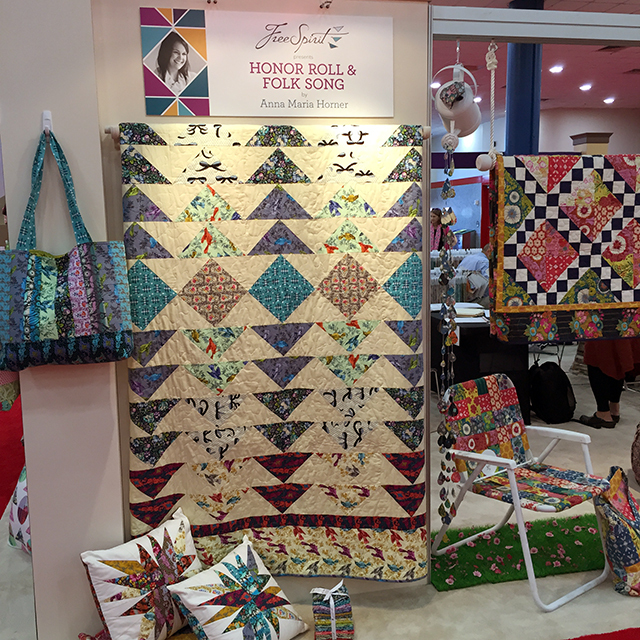 I was able to attend Quilt Market! 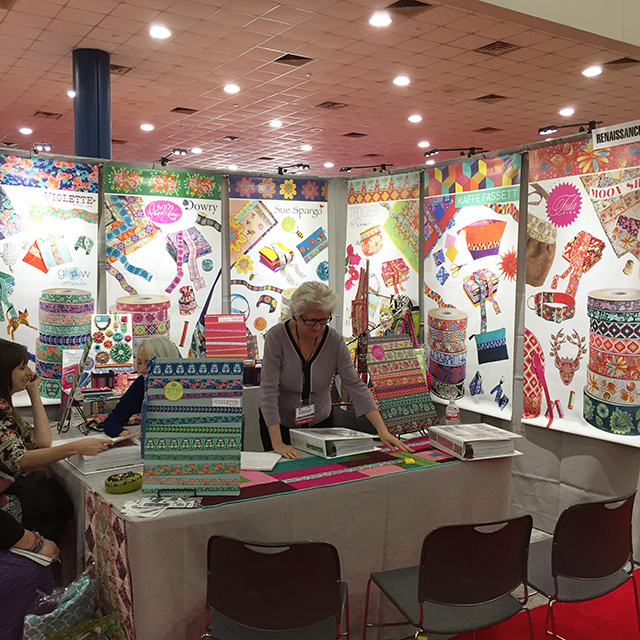 For those of you that don’t know, Quilt Market is an international trade show for the fabric industry. 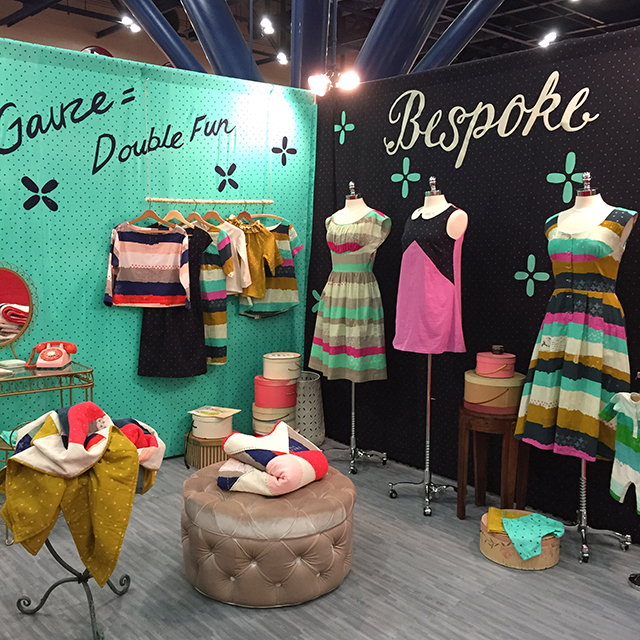 Manufacturers, Fabric Designers, Pattern Makers, etc. 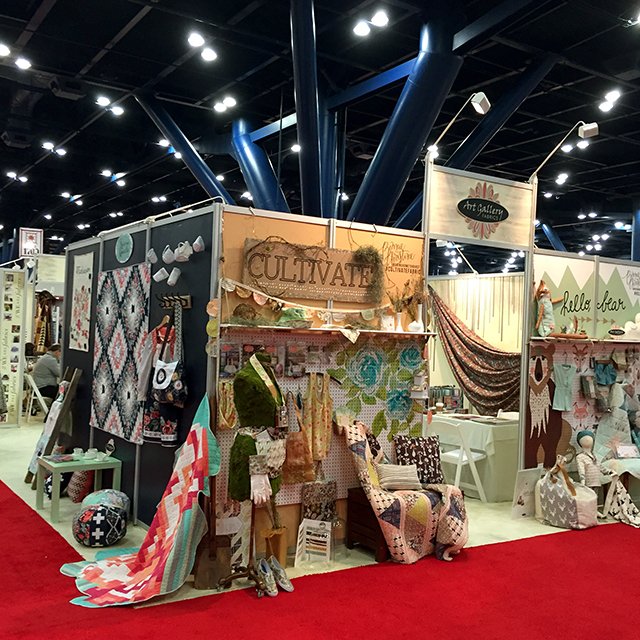 are all there with their booths decked out displaying their newest collections for shop owners to see and order fabrics for their stores. This market was in Houston, TX. Bonnie Christine (above) is one of the sweetest people that I’ve ever met and I was so happy to be able to chat with her in person this weekend! She immediately felt like an old friend that I’d known forever! (Although I guess I have followed her blog for almost 5 years!) Her story is so inspirational to me as her background and goals are very similar to mine. I also just love her work (and her passion for sharing with others to help make their dreams come true too!). The entire market was full of inspiration everywhere. I love Leah Duncan‘s patterns and style (above). 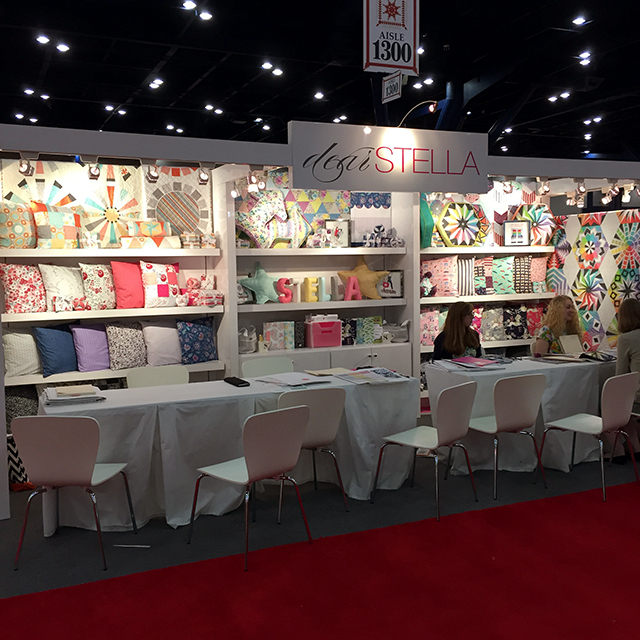 I also loved seeing Katarina Roccella‘s patterns in person as well (I didn’t get a good shot of her booth, but you can see part of it in the second picture, above). 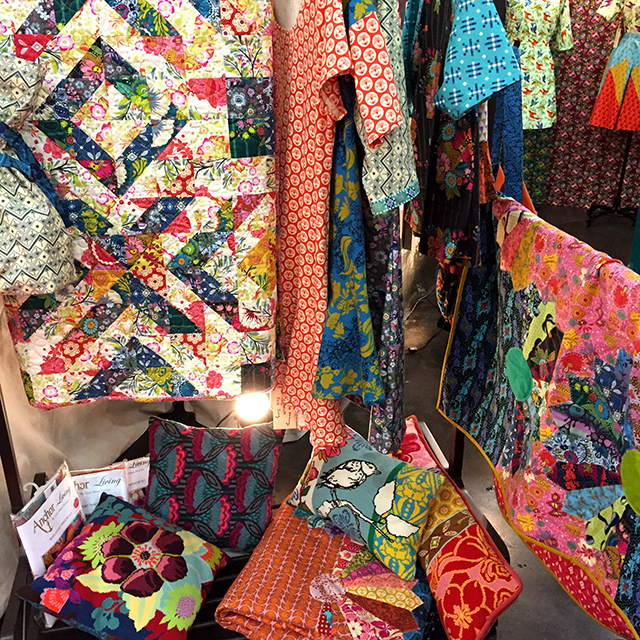 I also saw Elizabeth Olwen‘s fabrics in person for the first time here as well (I thought I got a picture of her booth, but can’t find it, so it must not have taken!). All three of those designers are pretty new to me, but I loved seeing and being inspired by their work! One of the highlights of my visit was getting to meet and chat with Amy Butler (probably one of the most well-known fabric designers!) and her husband. They were both so incredibly sweet and were more than happy to answer my questions about the industry and what inspires them. Amy Butler was so encouraging of my dream, she told me to work towards my passion and great things will happen! 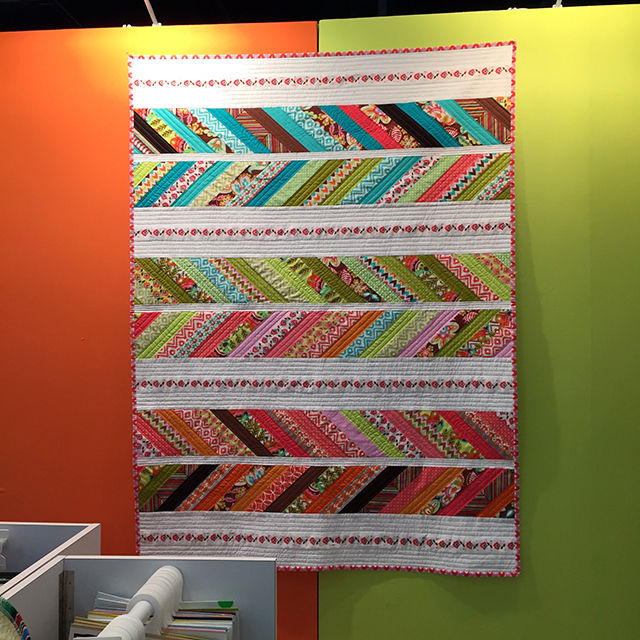 Anna Maria Horner (along with Heather Bailey and Sandi Henderson) was one of the first fabric designers that really caught my eye. I started following their blogs years ago and they are a good part of the reason that I also want to design fabric. It was awesome to meet Anna Maria Horner in person after all these years of being inspired by her work! 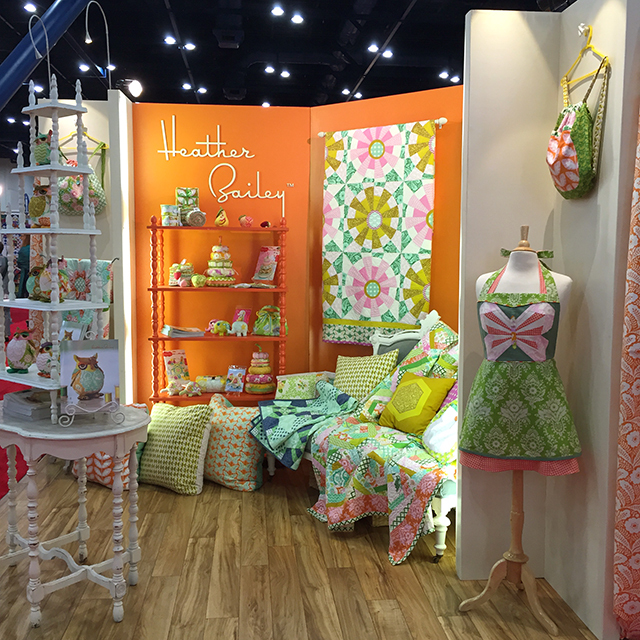 I saw Heather Bailey‘s booth, but didn’t see her. Next time! Many of my favorite designers have also come out with ribbon collections. These are seriously so beautiful and I was so glad to see them in person since I don’t think they are sold in any stores around where I live. 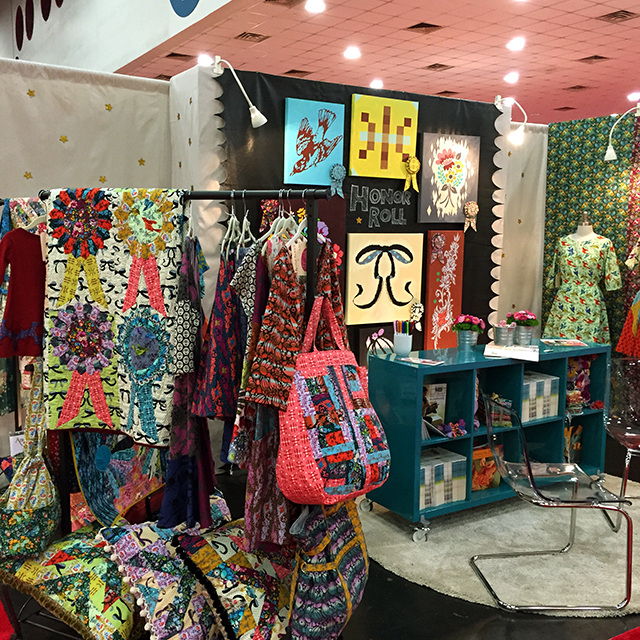 Aside from meeting and chatting with designers, I walked around, checking out booths of designers I’d never heard of before and just admiring all the beautiful colors and patterns. The quilts were so gorgeous, as were all the other cool things designers had made with their fabrics. I’m so grateful for this amazing opportunity. 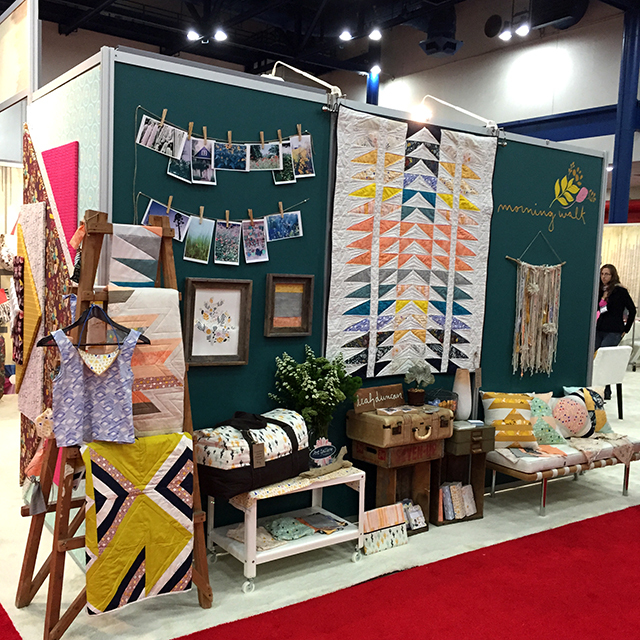 It gave me great insight into the fabric design industry, into how quilt market works, and the chats I had with the designers were so helpful and encouraging (and also had a good dose of reality too). It really has started to make something that always seemed like a long lost dream a truly achievable reality! Thank you Bonnie for making it happen!